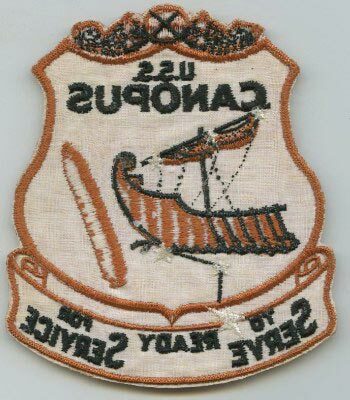 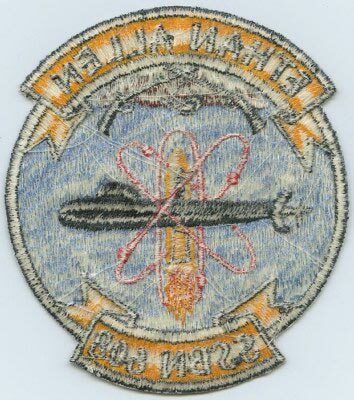 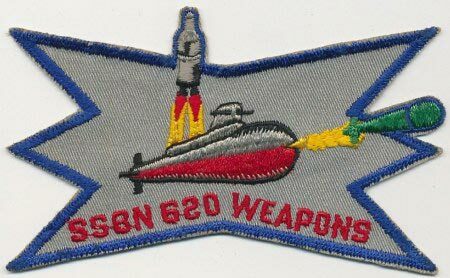 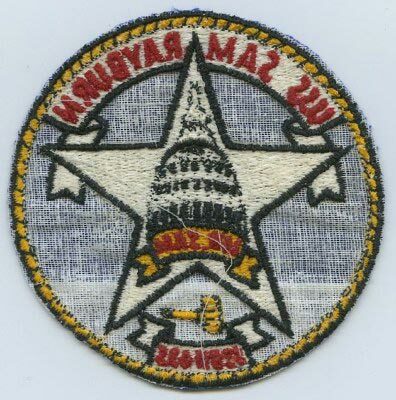 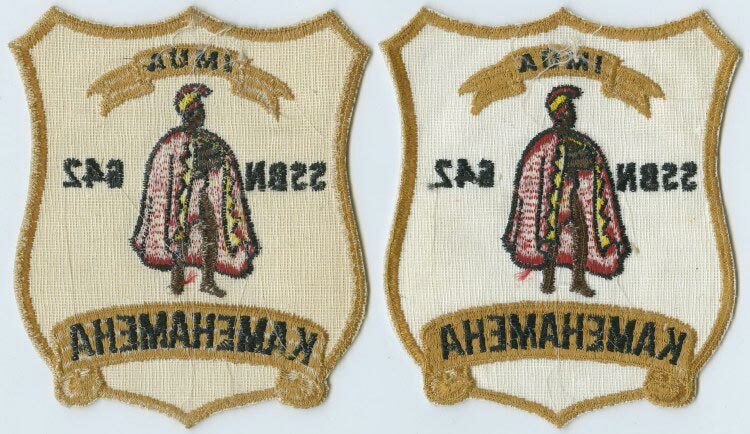 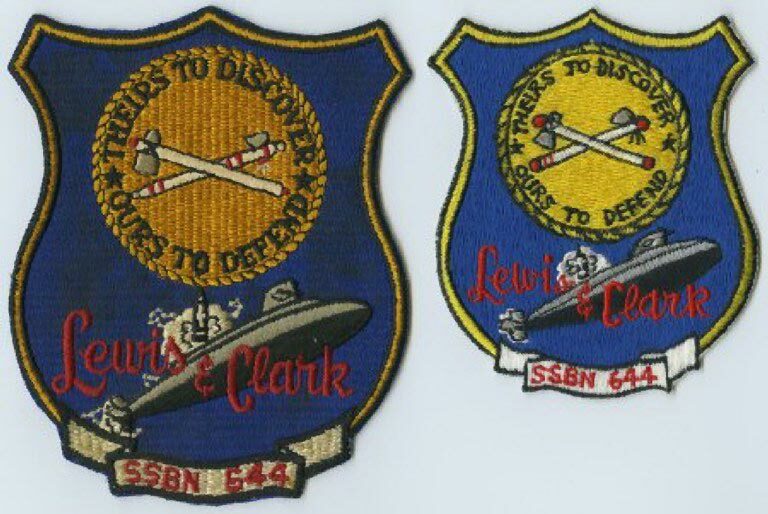 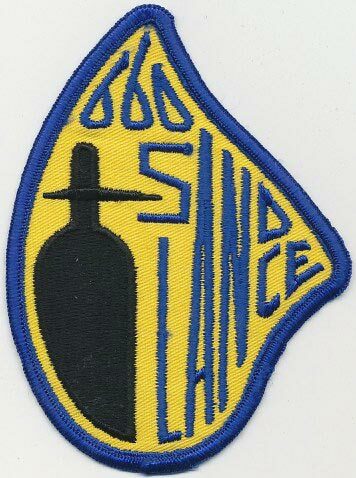 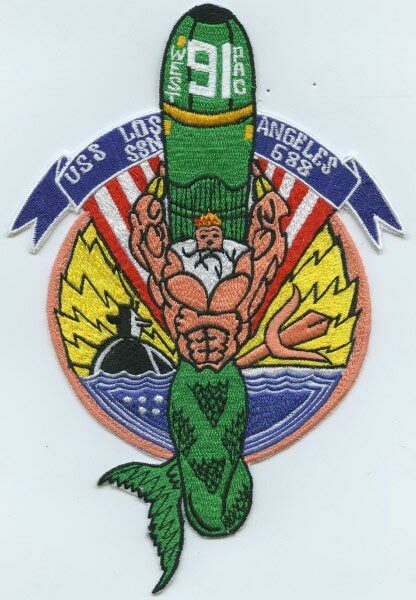 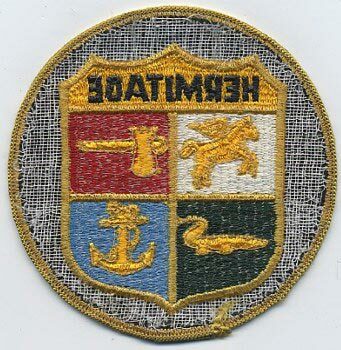 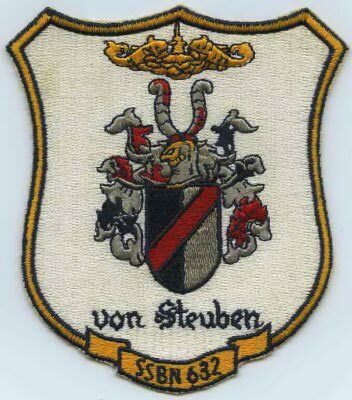 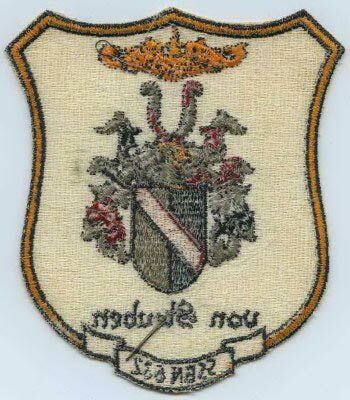 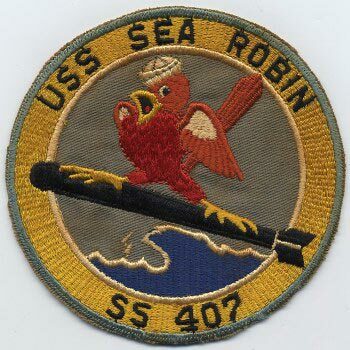 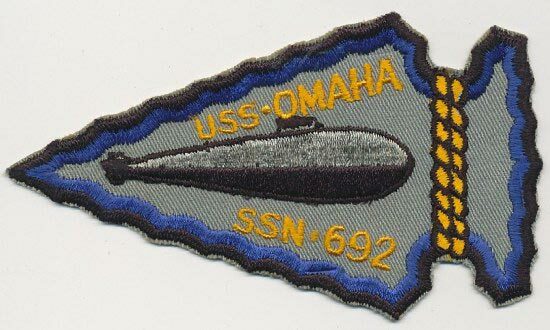 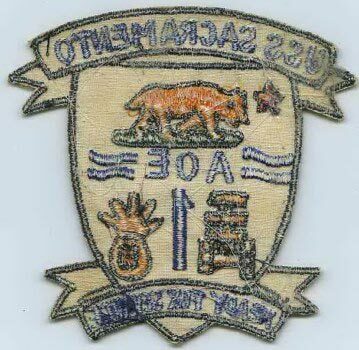 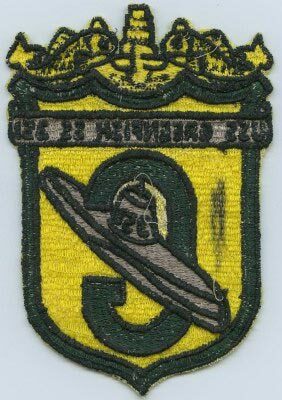 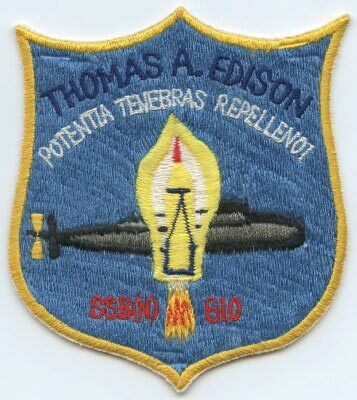 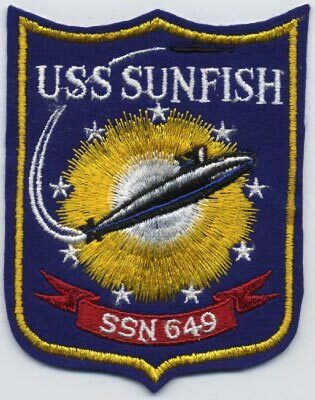 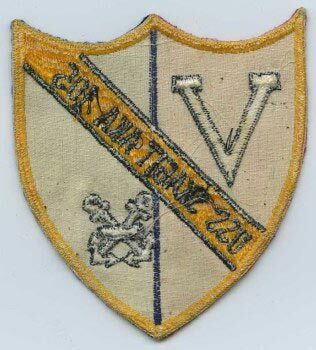 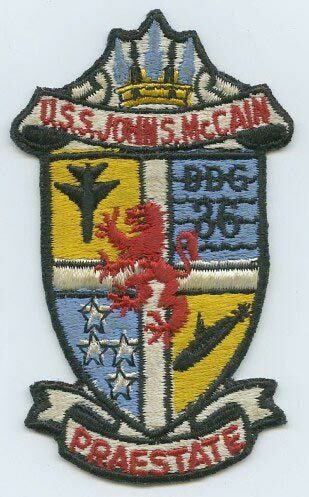 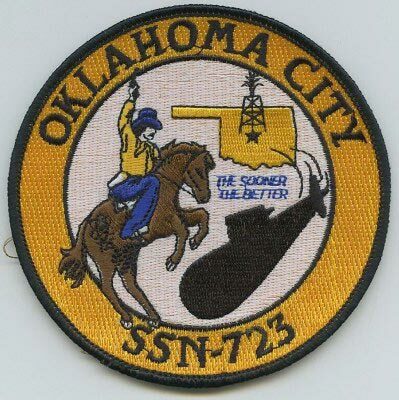 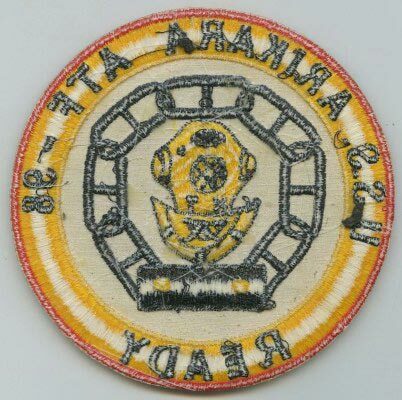 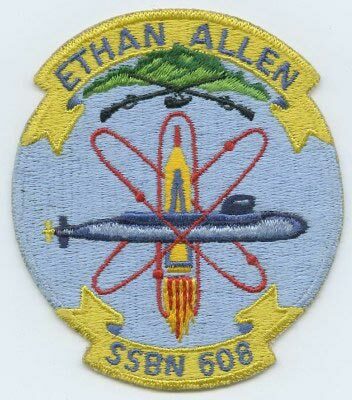 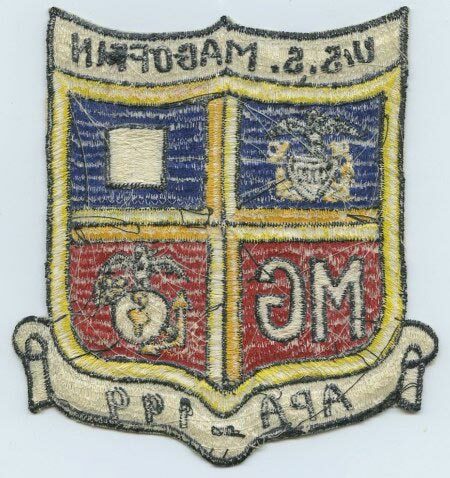 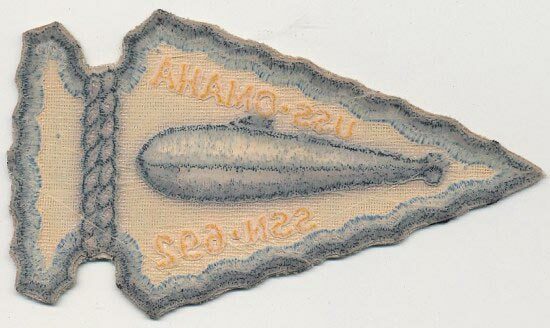 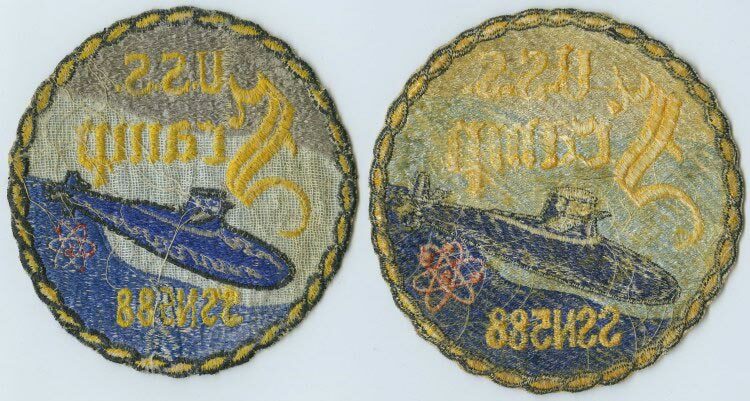 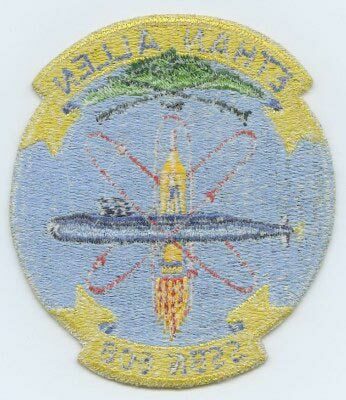 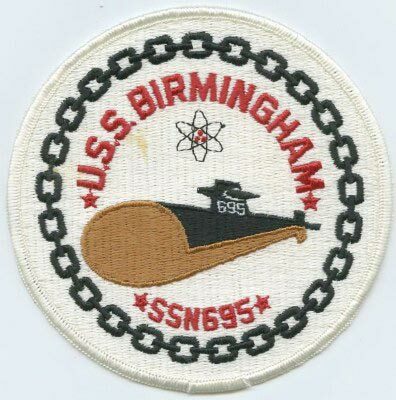 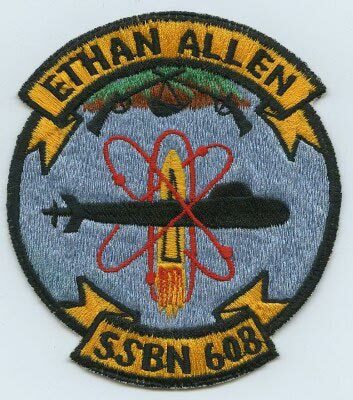 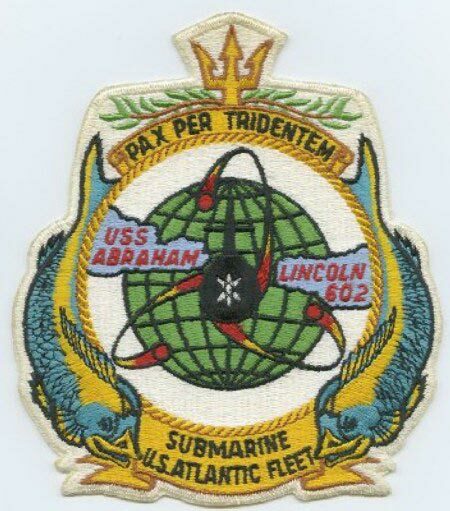 USS John Adams (SSBN-620), "WEAPONS"
One site states the Yellow patch with the First Motto was used from 1953 - 1968???? 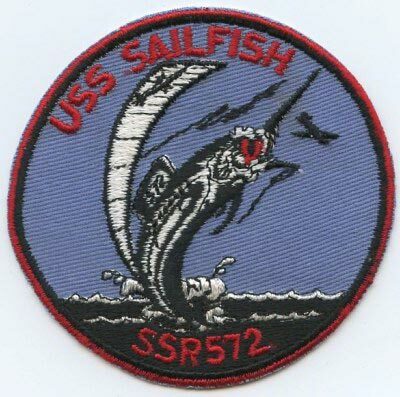 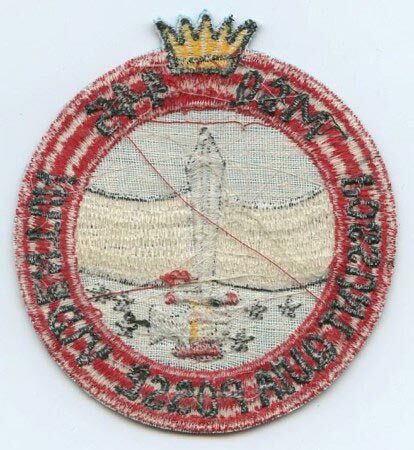 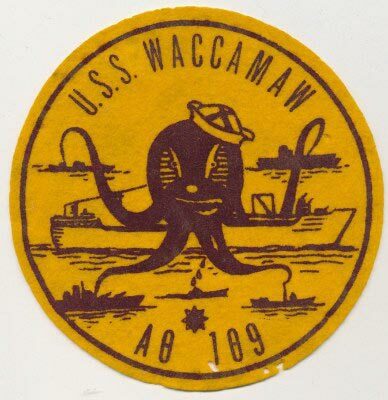 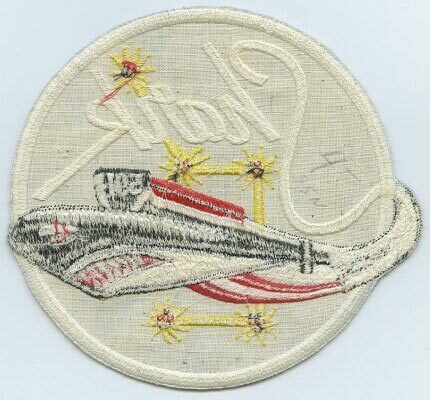 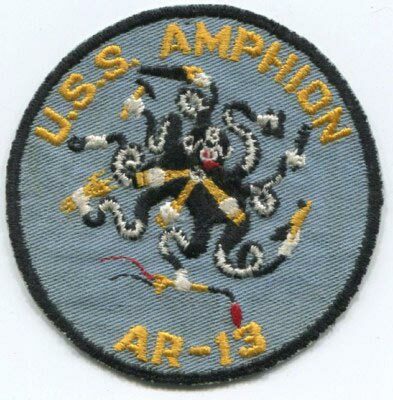 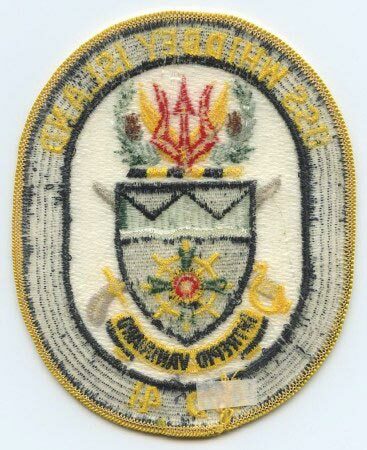 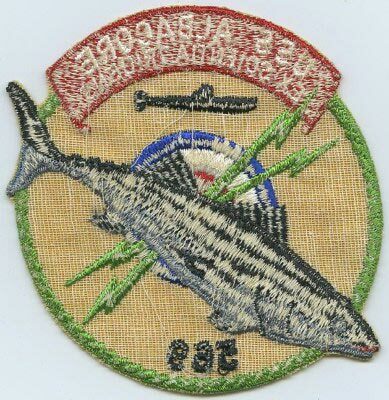 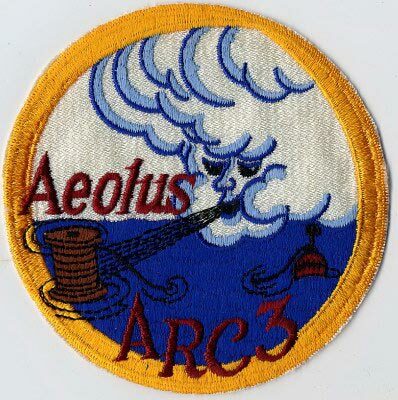 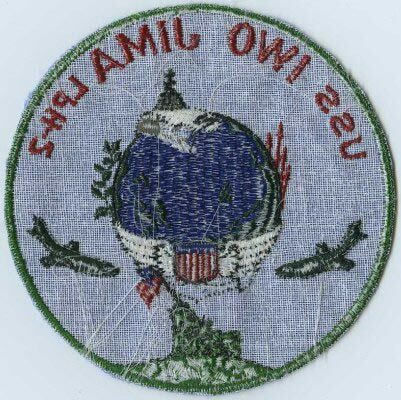 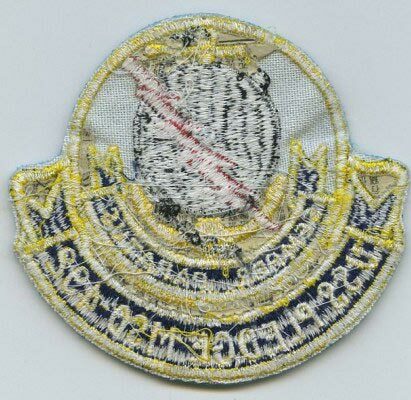 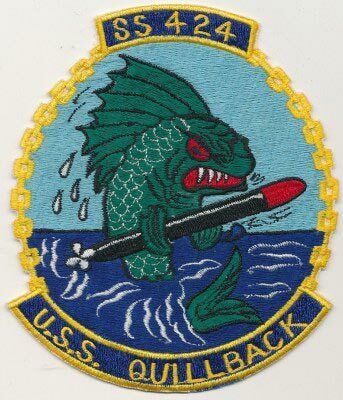 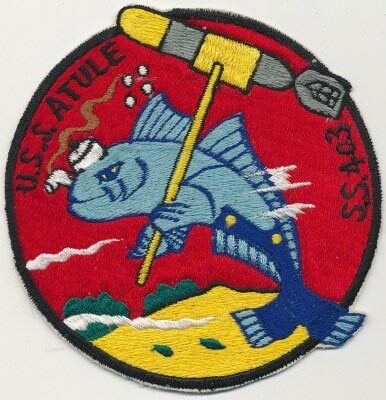 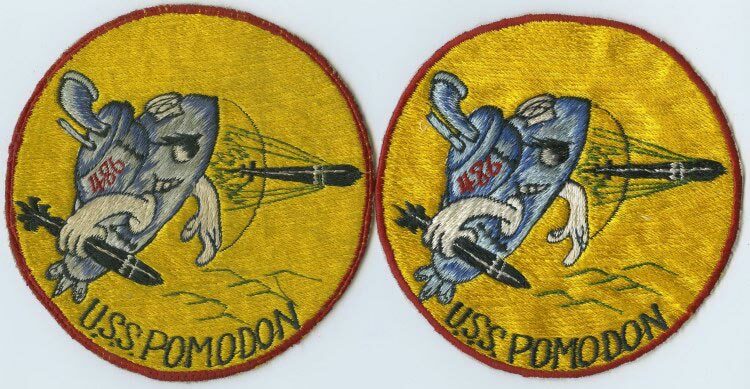 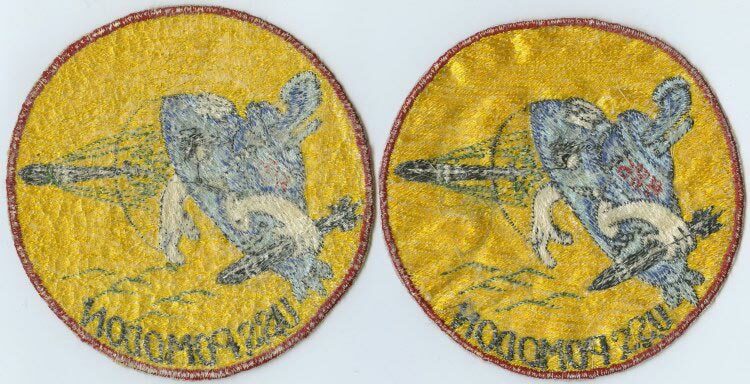 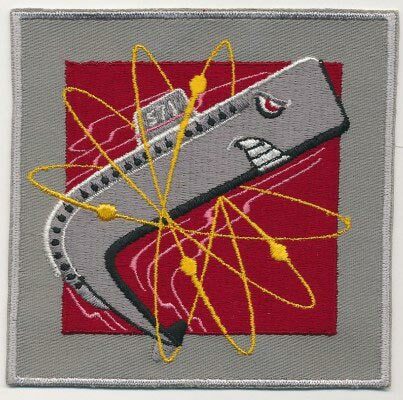 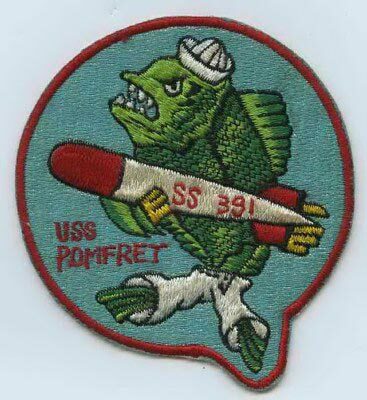 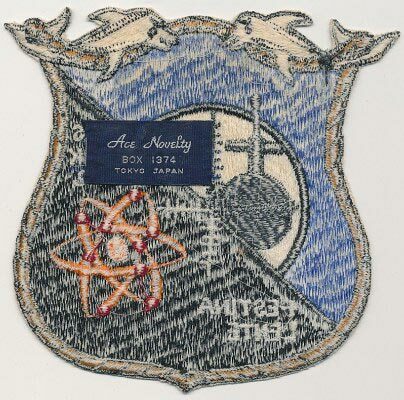 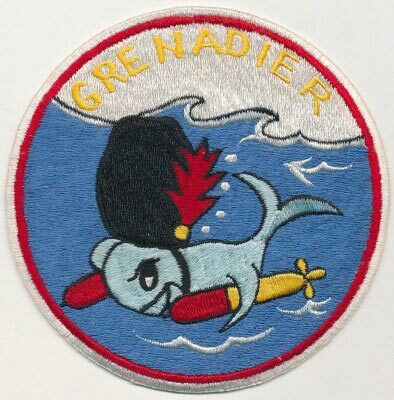 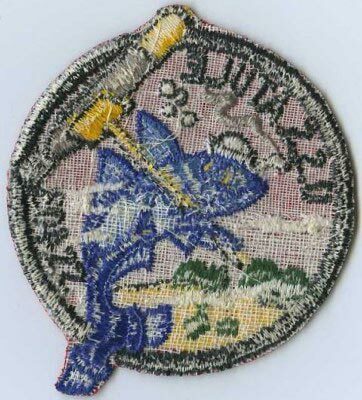 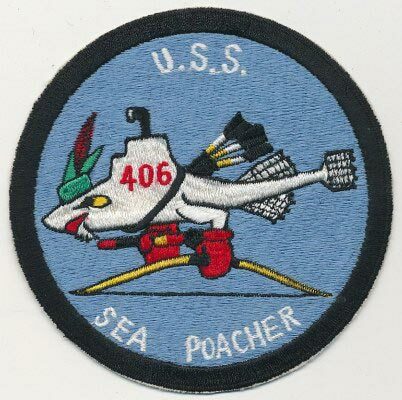 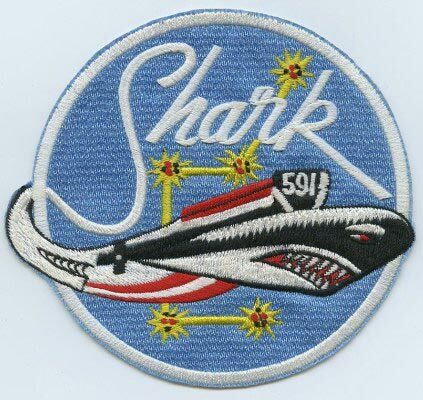 "The ComHogPac patch is from the early to mid-60's when Archerfish was in WestPac (Western Pacific). 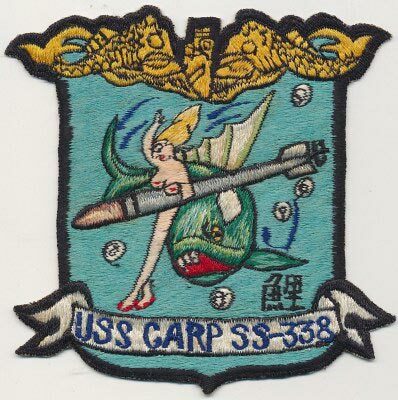 Log II, that contained pictures of the many, many, many young ladies, old ladies, and other females that Archerfish Sailors "shared time with" from around the world from 1960 to 1968. 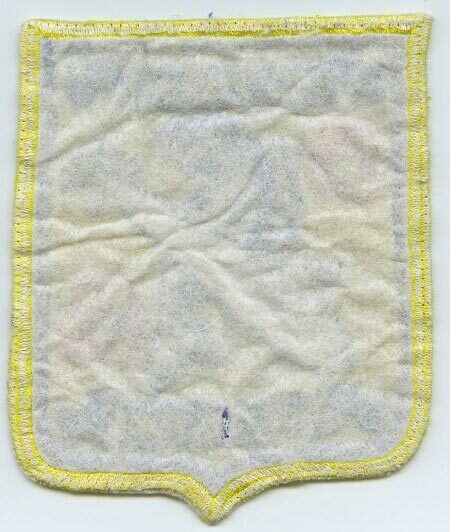 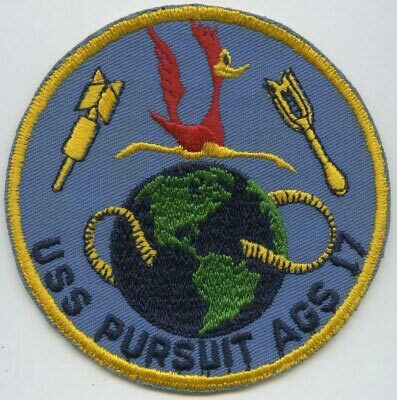 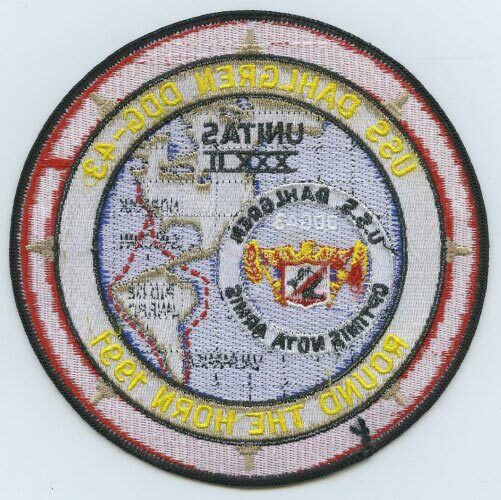 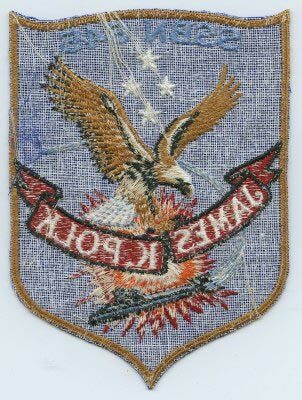 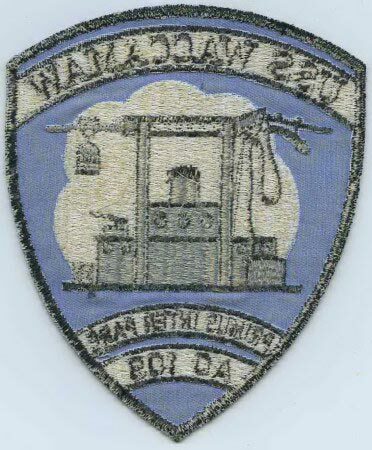 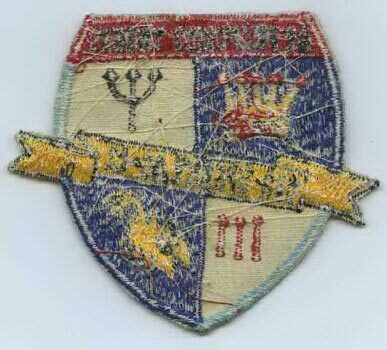 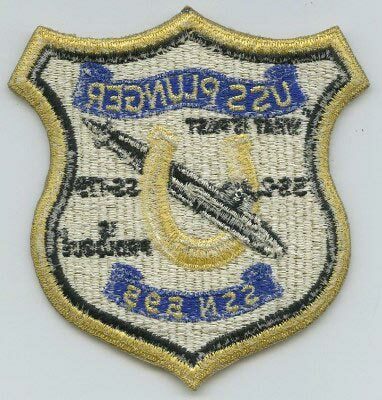 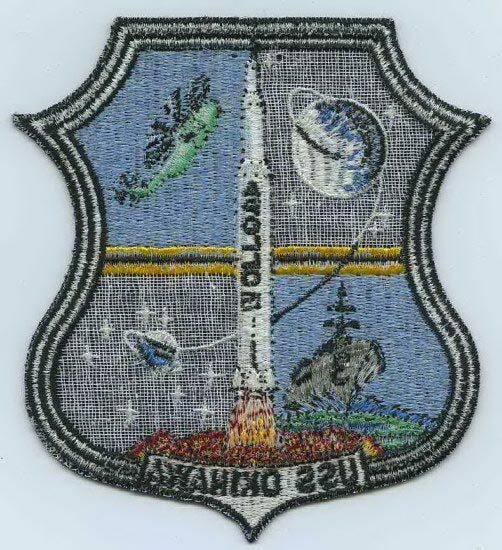 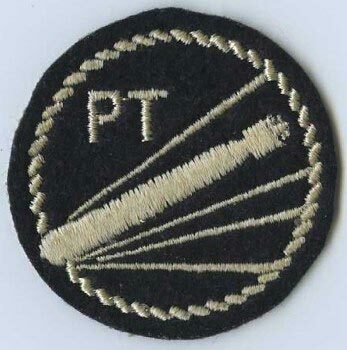 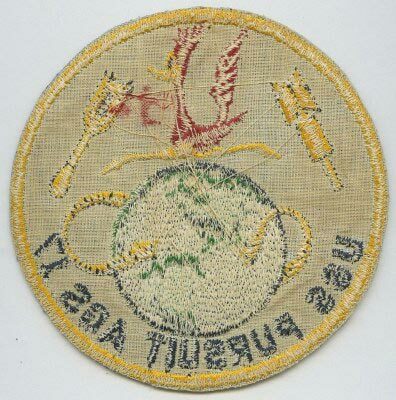 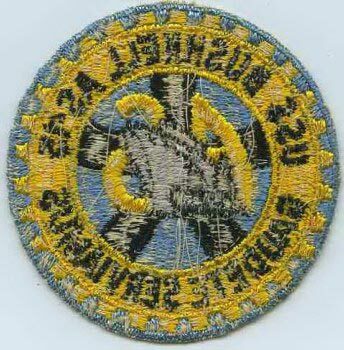 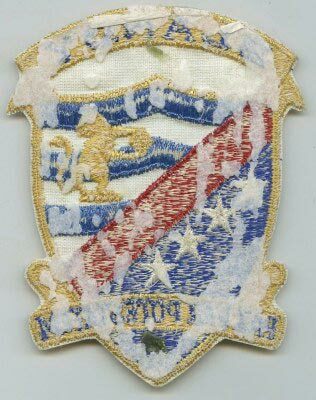 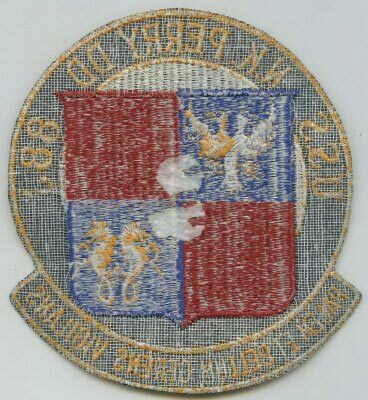 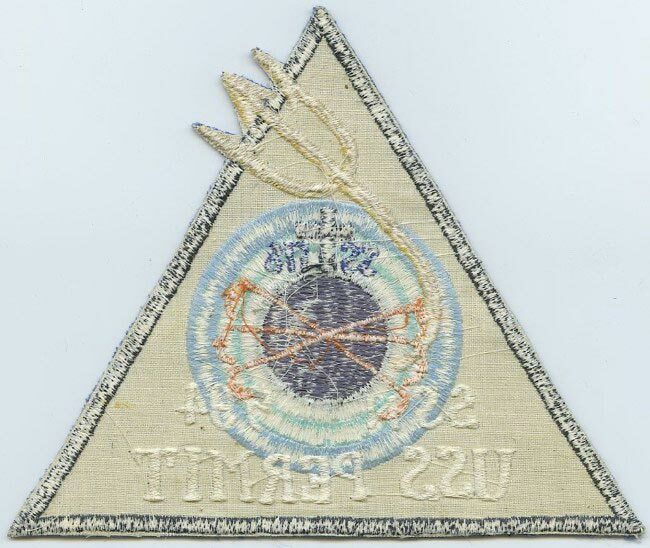 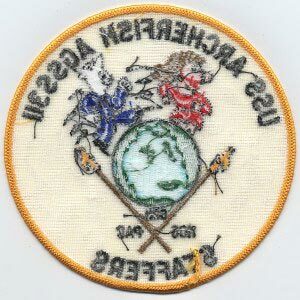 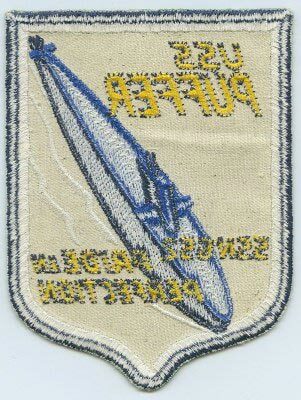 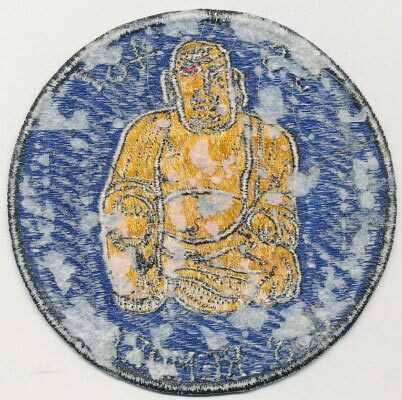 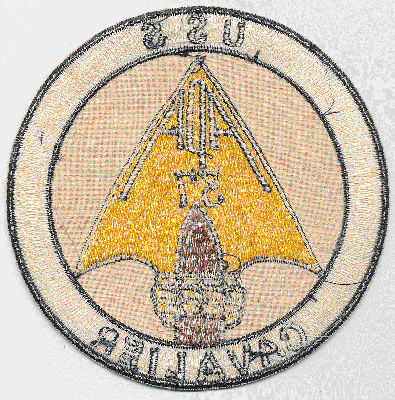 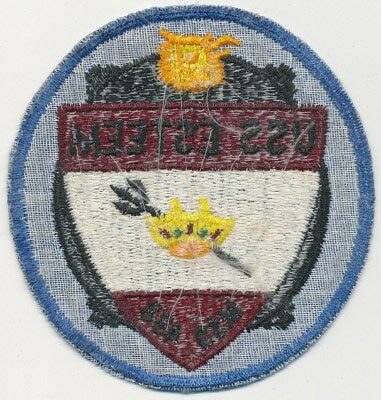 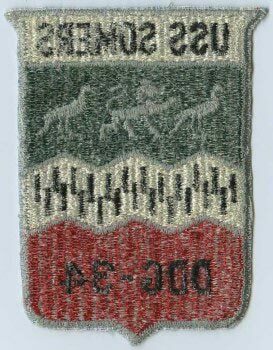 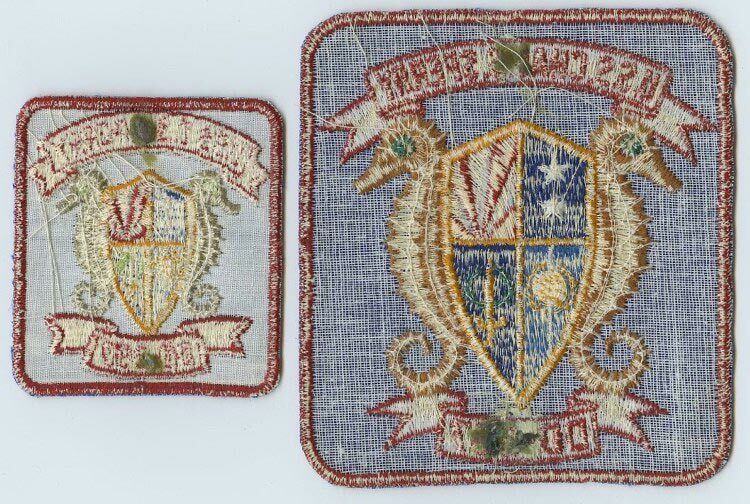 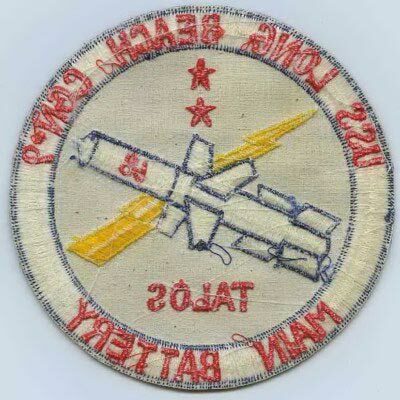 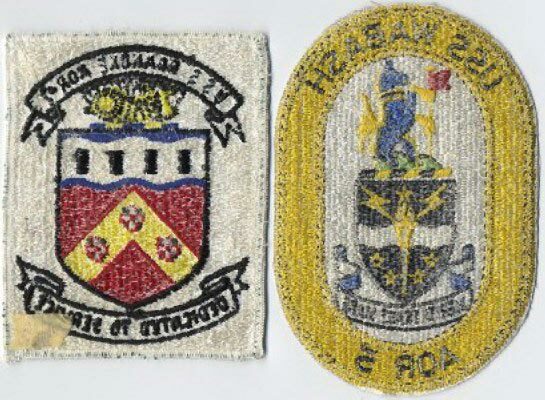 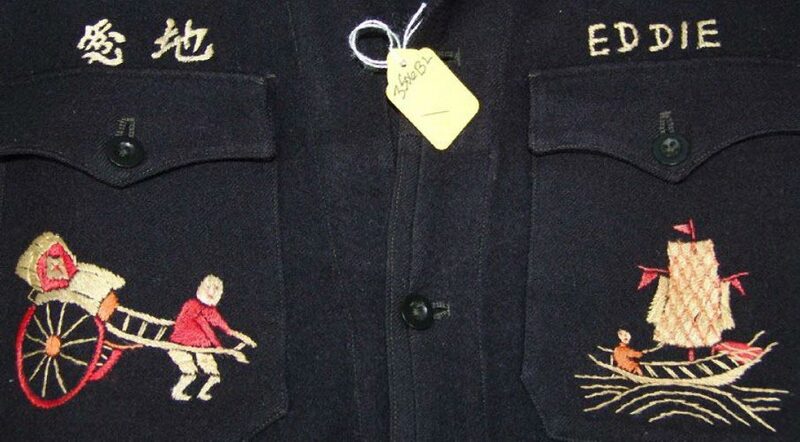 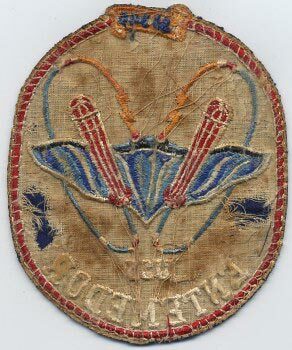 ......patch was created in recognition of those "pursuits". 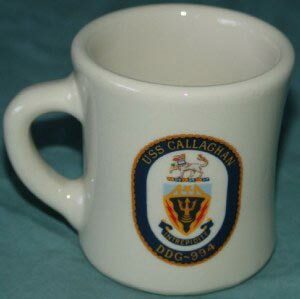 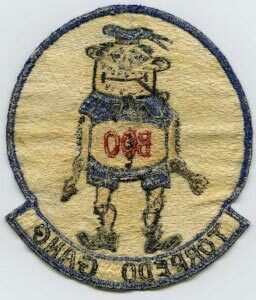 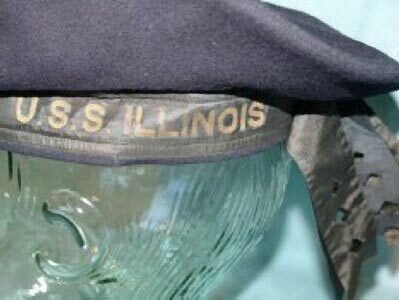 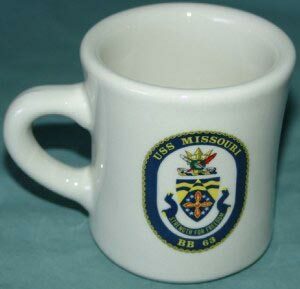 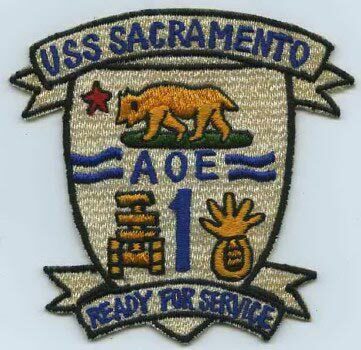 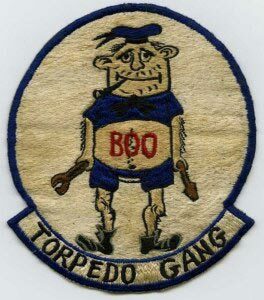 We were an all bachelor crew - the ONLY all bachelor crew on any ship in the US Navy. 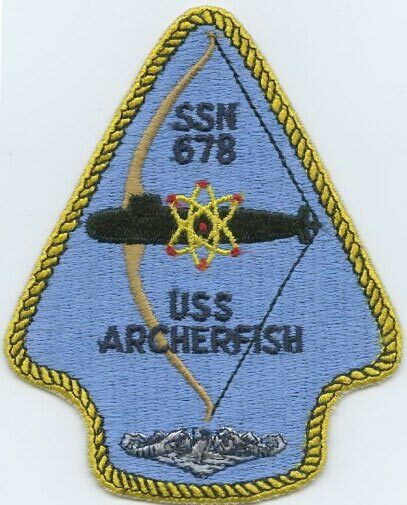 The reputation of the Archerfish and Crew was legendary. 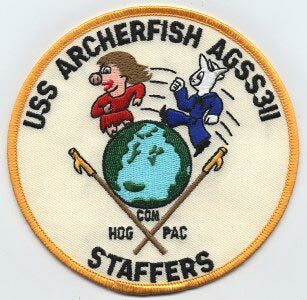 Any time we visited a port, foreign or domestic, the "young lovelies" were literally lined up on the pier waiting for a chance to hook up with an Archerfish Crew Member. 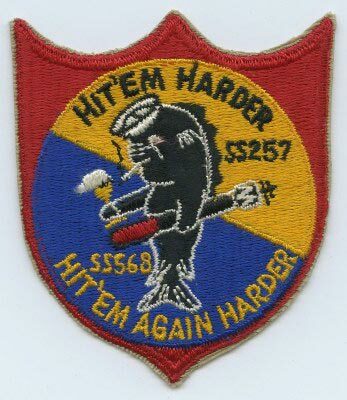 Getting their picture added to Hog Log seemed to be considered an honor. 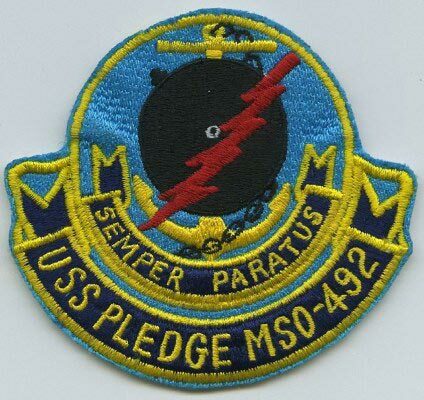 "ComHogPac" is a play on official names such as ComSubPac & etc. 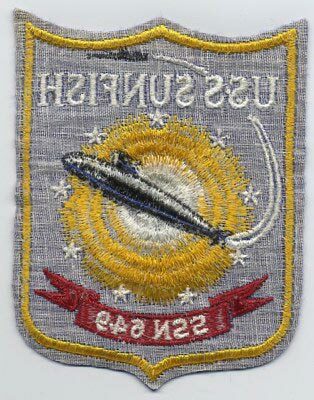 We of course were the STAFFERS." 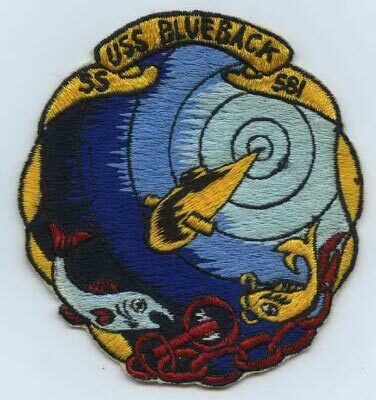 USS Blueback was Commissioned October 15 1959; last non-nuclear powered submarine built by the U.S. Navy and the last to be Decommissioned after serving her country for 31 years. 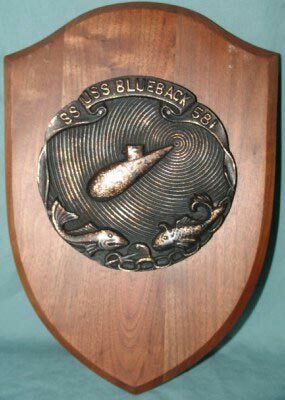 Blueback and her sister ships of the Barbel class utilized radical new concepts in post World War II submarine design, the most important being the teardrop hull and a single propeller. 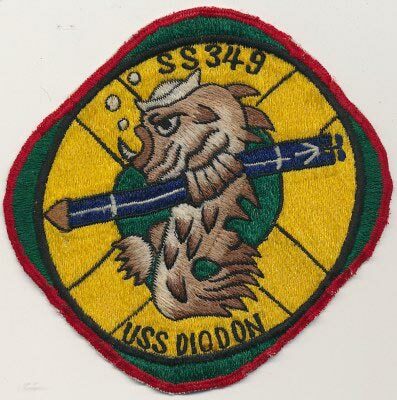 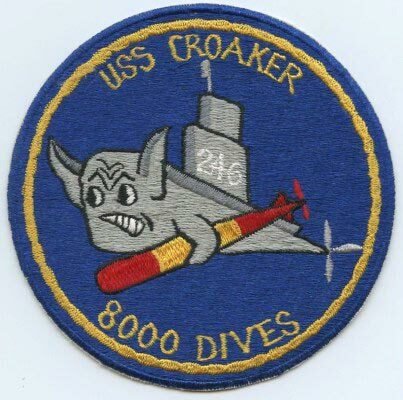 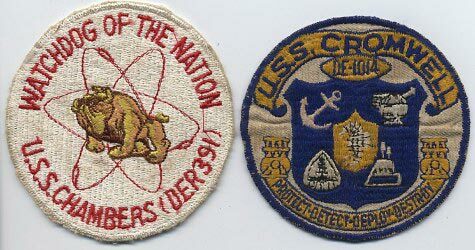 "WITHOUT FEAR - WITHOUT REPROACH"
USS Croaker (SS-246), "8000 DIVES"
The USS Diodon (SS-349) a Balao-class sub, was named for Diodon (a porcupine fish). 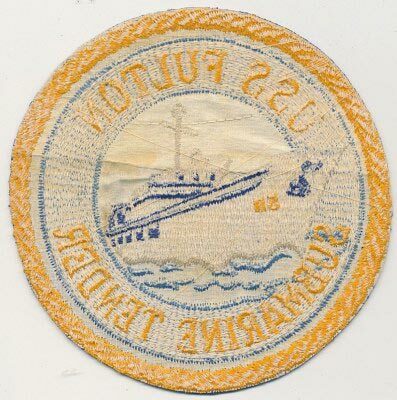 Decommissioned and struck from the Naval Register July 31 1972. 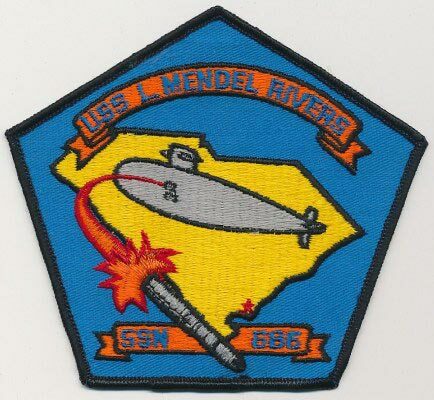 Work began at the Mare Island Naval Shipyard circa November 1967 to Convert the Grayback from a guided missile submarine to an Amphibious Transport Submarine. 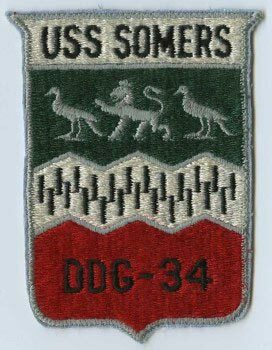 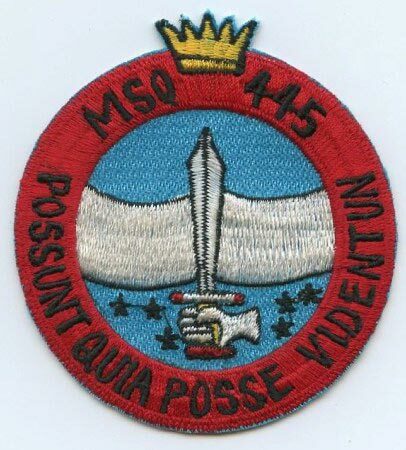 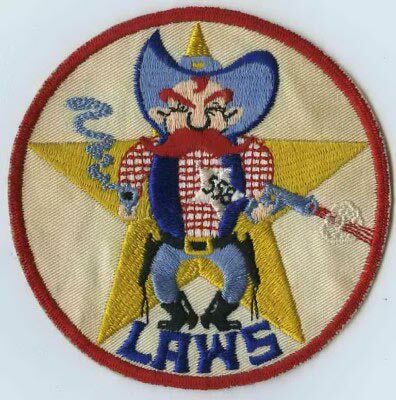 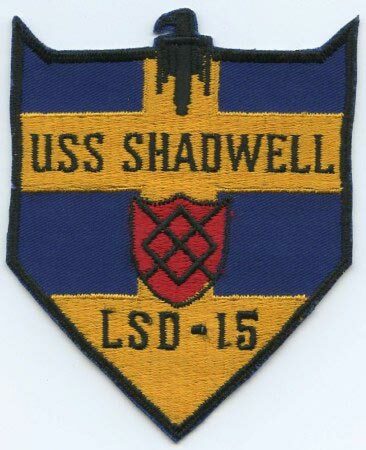 Re-Classification to an LPSS occurred on 30 August 1968. 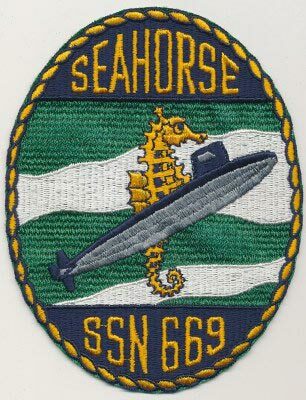 The conversion heightened her sail by ten feet, added two auxiliary tanks to the forward end of the engine room (increasing the length of the boat by 12 feet), and converted the missile chambers to carry 67 troops and UDT/SEAL Swimmer Delivery Vehicles (SDVs). 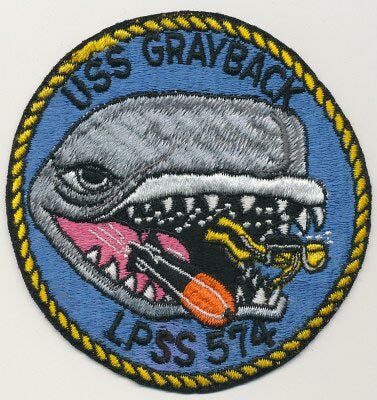 In June 1972, the Grayback carried a team of Navy seals into the coastal waters of North Vietnam as part of Operation Thunderhead. 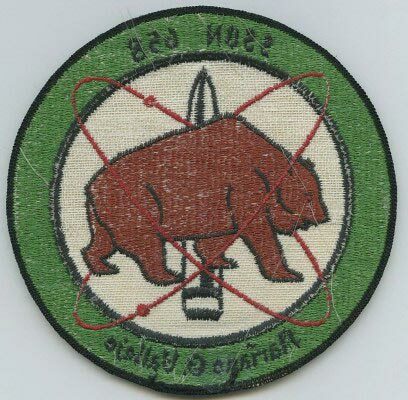 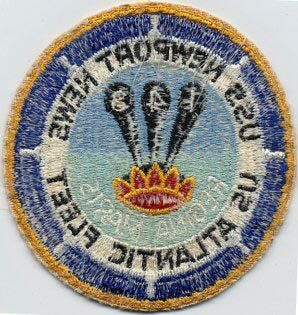 This was the last attempt during the Vietnam War to rescue American POWs held in North Vietnam. 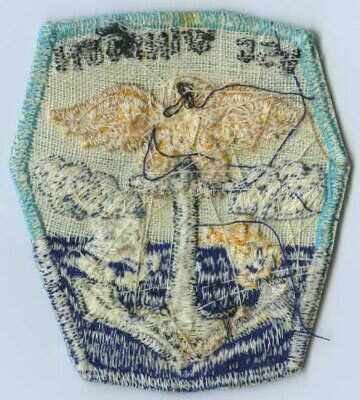 "In the last year of the Vietnam conflict, even as American troops were leaving for home, there were still those fighting for their lives: prisoners of war being held in the Communist north. 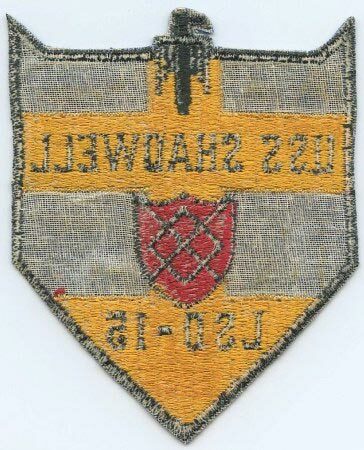 There were two operations launched to rescue the POWs. 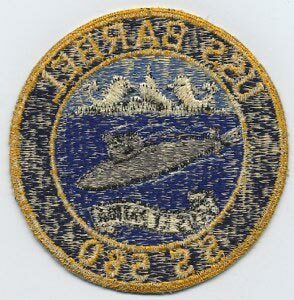 One mission,-the le(g)endary Son Tay raid-was revealed to an astonished public. 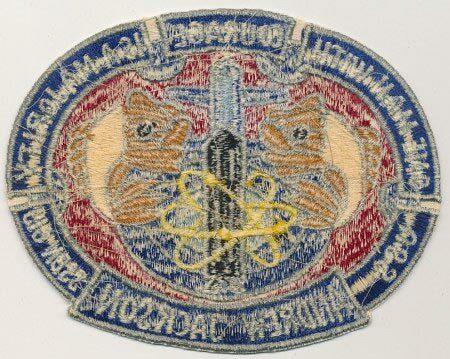 The other mission was classified as Top Secret for years. 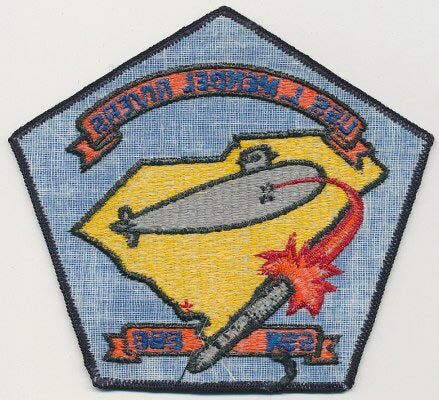 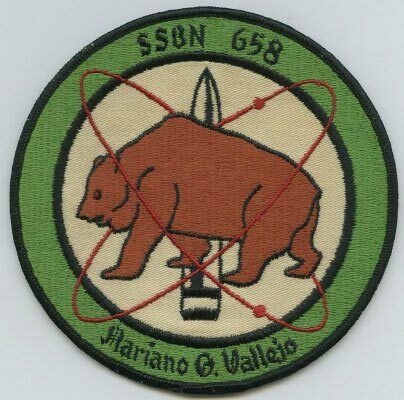 This is the incredible true story of that almost-forgotten mission-Operation Thunderhead. 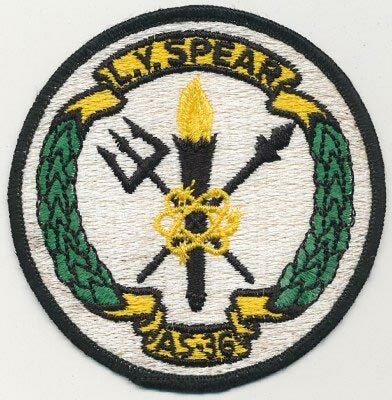 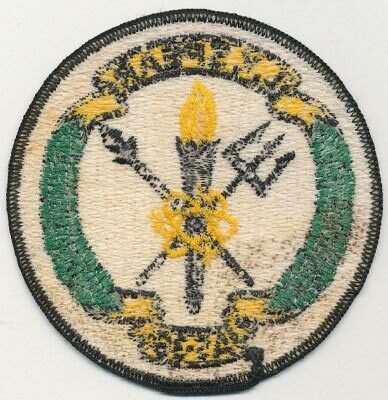 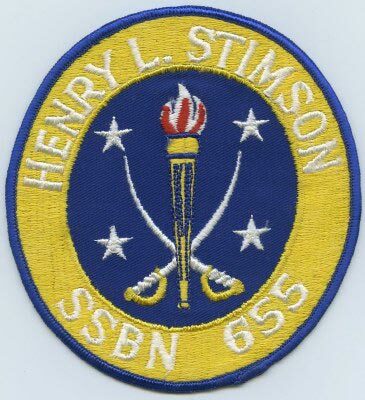 Among the personnel recruited for the mission was a select group of operators from both the US Navy SEALS and the Underwater Demolition Teams who knew that if they were captured, they would be killed, tortured, or more likely disappear forever into enemy hands. 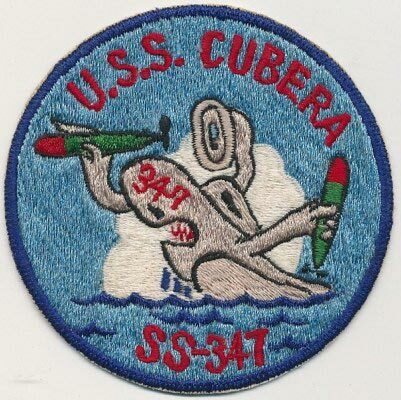 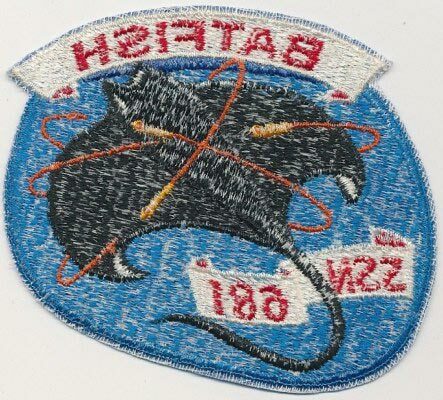 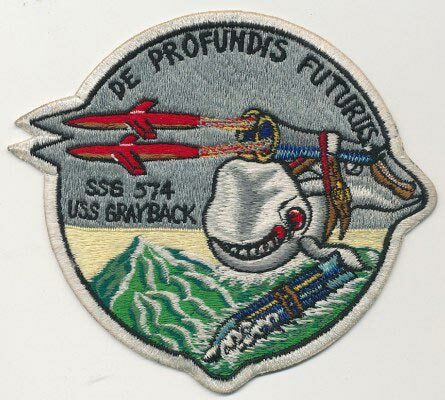 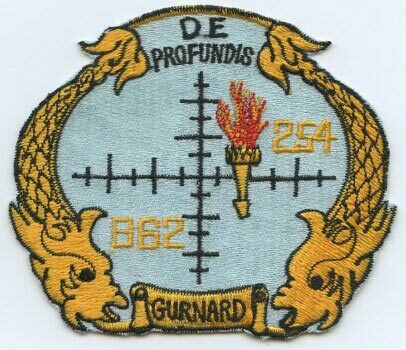 Also involved were the men of the submarine USS Grayback-who would deliver the team while trting to avoid being detected by their own Navy-and two SR-71 Blackbirds, the most secret aircraft in the American arsenal, which were used to make contact with the POWs themselves." 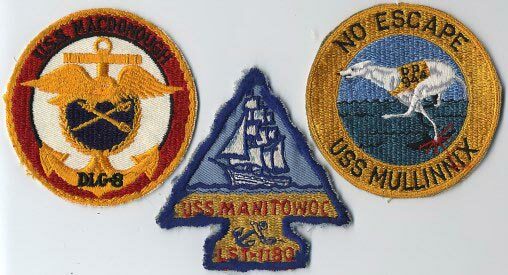 "STEEL TRUE AND BLADE STRAIGHT"
On 15 May 1969, Guitarro was moored in the Napa River at Mare Island Naval Shipyard while still under construction. 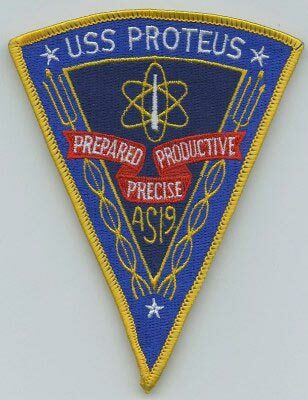 At about 1600 hours, a civilian nuclear construction group began an instrument calibration assignment which required the filling of certain tanks, located aft of the ship's pivot point, with approximately five tons of water. 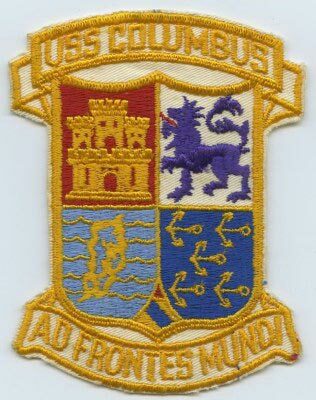 Within 30 minutes, a different, non-nuclear civilian construction group began an assignment to bring Guitarro within a half-degree of trim; this entailed the adding of water to tanks forward of the ship's pivot point to overcome a reported two-degree up-bow attitude. 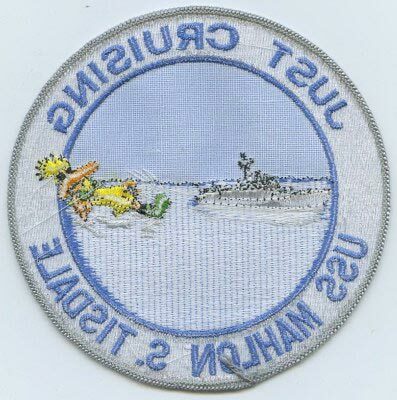 Until shortly before 2000 hours, both groups continued to add water, unaware of each other's activities. 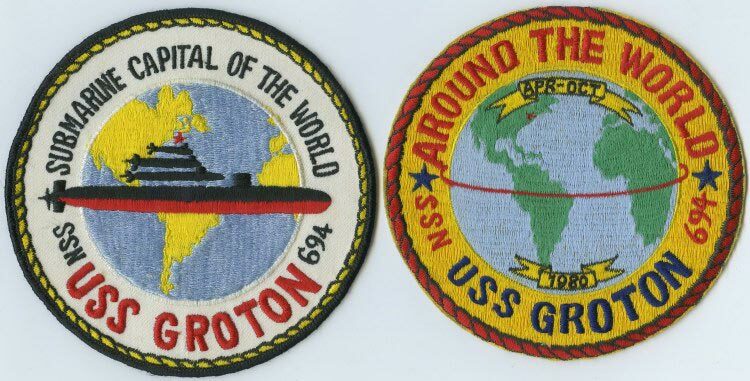 Twice between 1630 and 2000 hours, a security watch advised the non-nuclear group that Guitarro was riding so low forward that the 1 1/2' high wakes of boats operating in the Napa River were sloshing into an uncovered manhole in the most forward and lowest portion of the ship's deck; these warnings went unheeded. 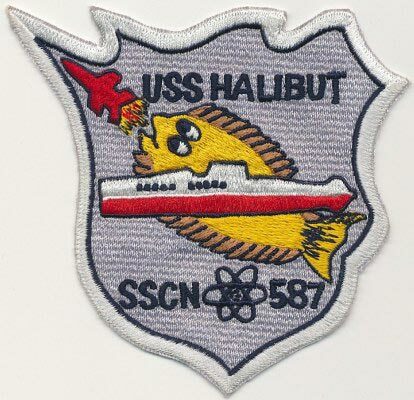 At 1945 hours, the non-nuclear group stopped adding water to the ballast tanks and began to halt work for their meal break, leaving at 2000 hours. 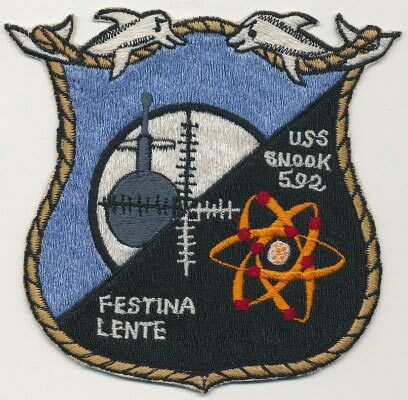 At 1950 hours, the nuclear group completed their calibrations and began to empty the tanks aft. 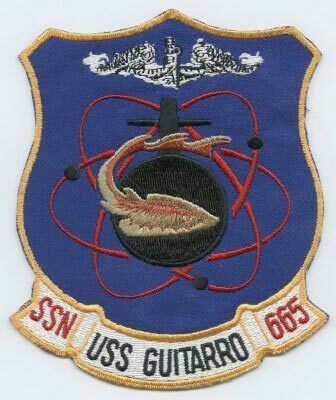 At 2030 hours, both the nuclear group, still aboard, and the non-nuclear group, returning from their break, noticed Guitarro taking a sudden down angle which put the forward hatches underwater. 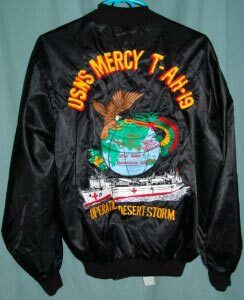 Massive flooding took place through several large open hatches. 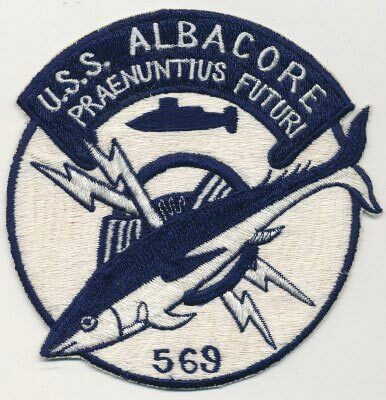 Efforts between 2030 and 2045 hours to close watertight doors and hatches were largely unsuccessful because lines and cables ran through the doors and hatches, preventing them from closing. 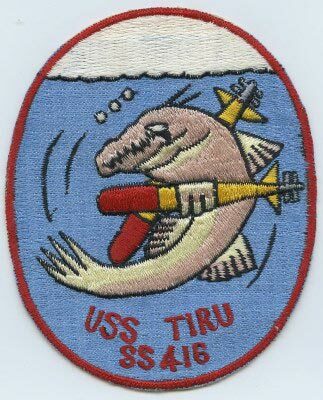 At 2055 hours, Guitarro sank earning her the nickname, "Mare Island Mud Puppy"
Guitarro was refloated three days later on 18 May 1969. 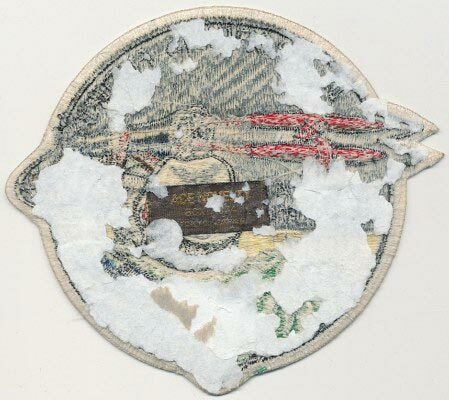 Damages were estimated at between $15.2 million and $21.85 million. 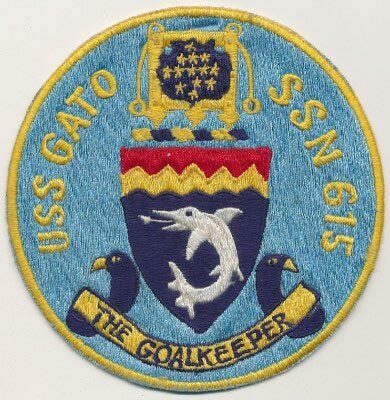 The Guitarro had been scheduled to be commissioned in January 1970, but repairs necessitated by her sinking dictated a 32-month delay. 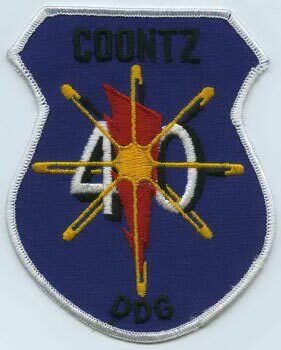 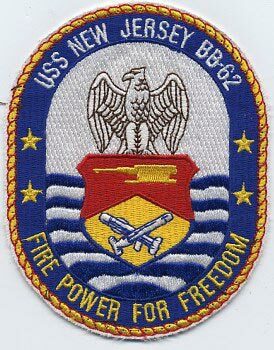 Finally Commissioned September 9, 1972. 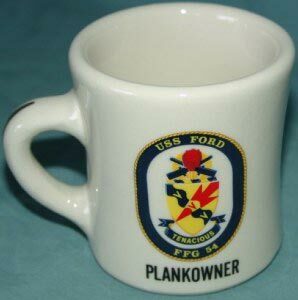 Has anything changed - I think not - we just lost $535 million at SOLYNDRA.........not far from Mare Island. 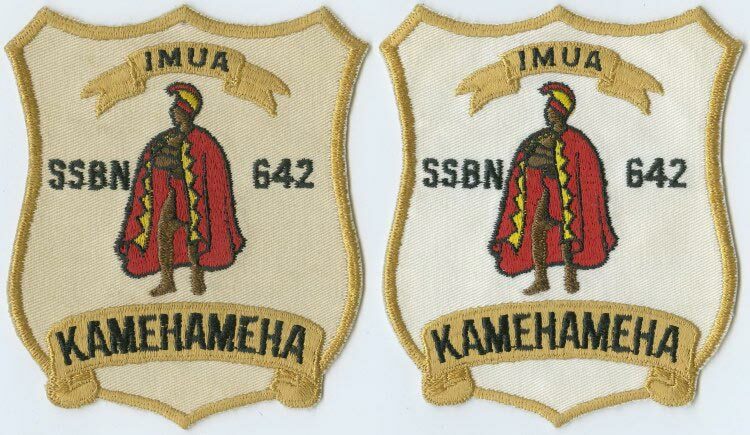 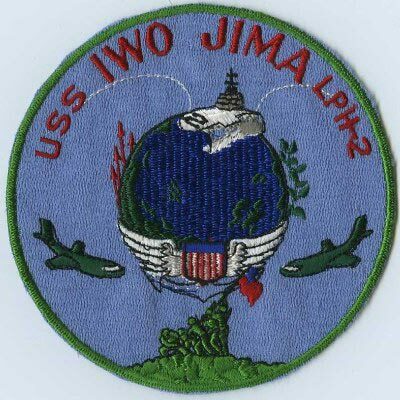 "IMUA" = Hawaiian meaning "To move forward with confidence and courage"
Reclassified in 1992 as SSN-642 when the Ballistic Launching tubes were removed/etc. 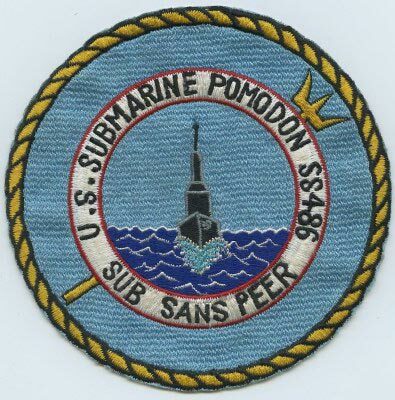 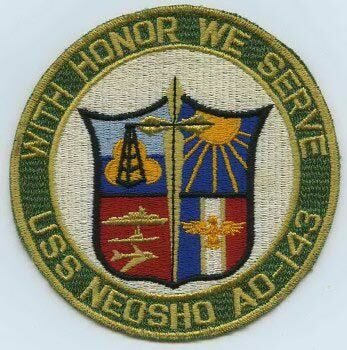 "THEIRS TO DISCOVER - OURS TO DEFEND"
"Submarine U.S. Atlantic Fleet, Fleet Ballistic Submarine"
1964-1988, "ONLY THE MEMORIES REMAIN"
USS Pomodon (SS-486), a Tench-class submarine, was the only ship of the United States Navy to be named for the Pomodon (a name for a Snapper). 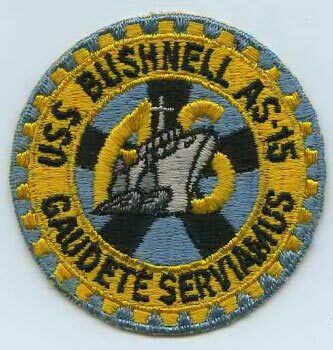 Built by Portsmouth Navy Yard in Kittery, Maine; launched in June 1945; Commissioned September 11, 1945. 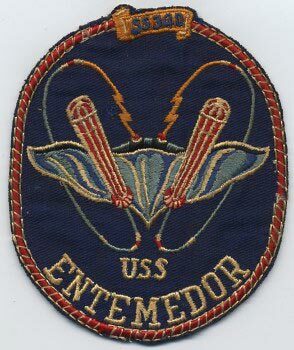 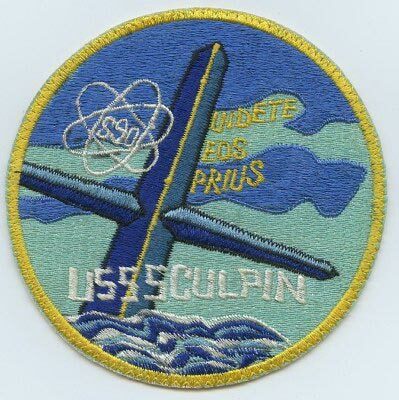 Modified circa October 1946 - July 1947 with the FIRST GUPPY upgrade(Greater Underwater Propulsive Power Program) in the Pacific Fleet. 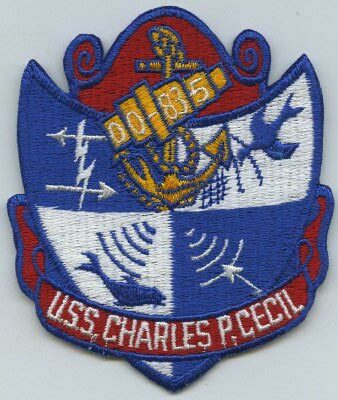 Deployed many times to the Pacific to include some Serivce in Vietnam Waters; Stood-down in 1970 after 25 years of service. 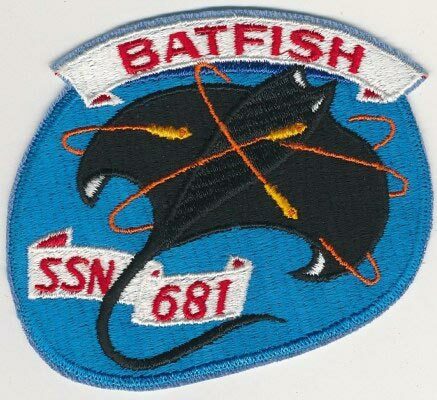 Named for a fish with a flat body, large pectoral fins, & a whip-like tail. 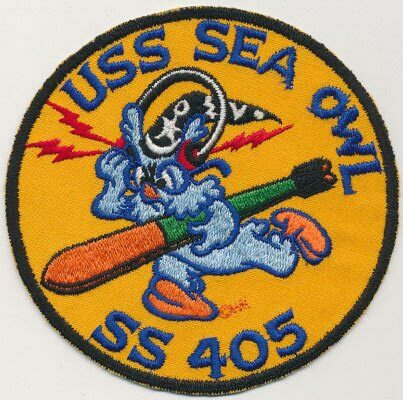 Was in the movie "ICE STATION ZEBRA"
Howland Owl was the swamp's self-appointed leading authority on everything! 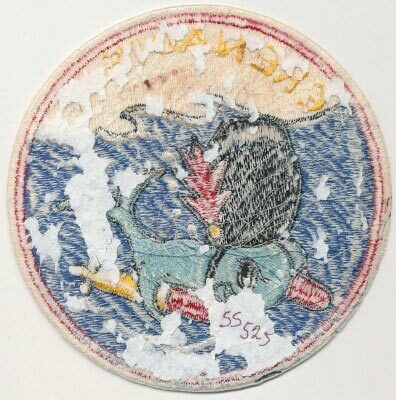 He wore Large-Frame glasses and in early years a "dunce" style wizard's cap with star and crescent moon. 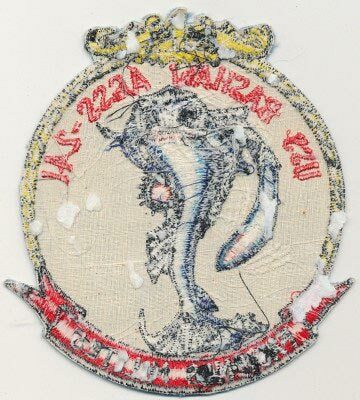 Named for the sterlet, a small sturgeon found in the Caspian Sea and its tributaries. 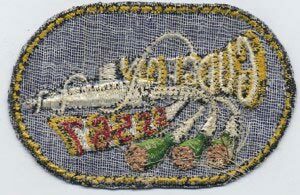 Their meat is considered delicious and whose eggs are one of the world's great delicacies, Caviar. 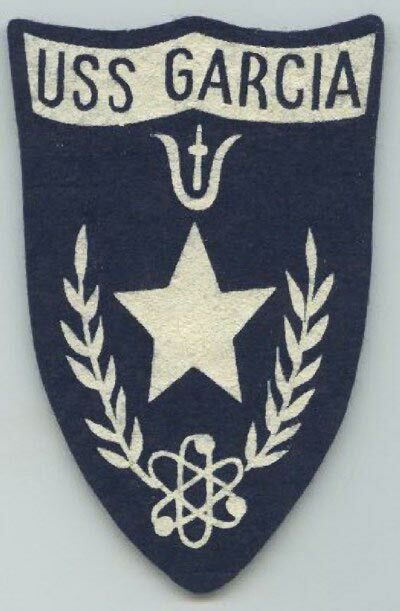 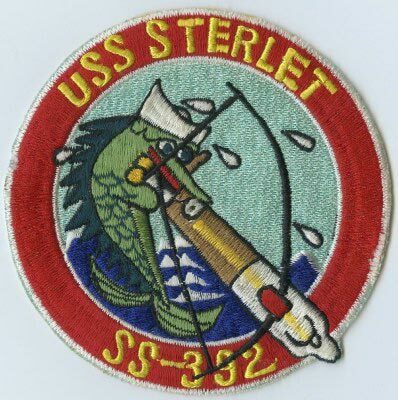 The USS Sterlet was awarded six battle stars for World War II service. 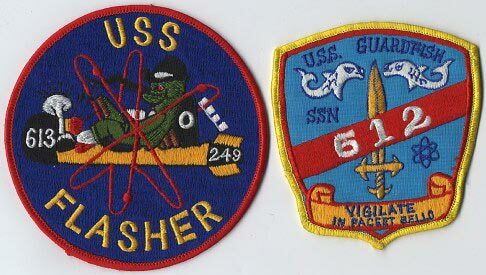 USS Thresher, lead ship of a class of 3700-ton nuclear-powered attack submarines, was built at the Portsmouth Naval Shipyard, Kittery, Maine. 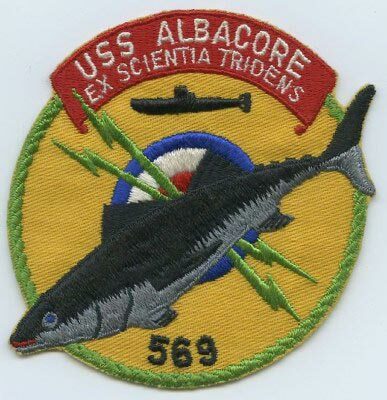 Commissioned in August 1961, she conducted lengthy trials in the western Atlantic and Caribbean areas in 1961 and 1962, providing a thorough evaluation of her many new technological features and weapons. 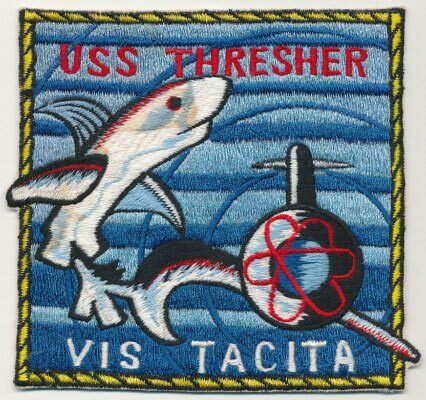 After the completion of these test operations, Thresher returned to her builders for overhaul. 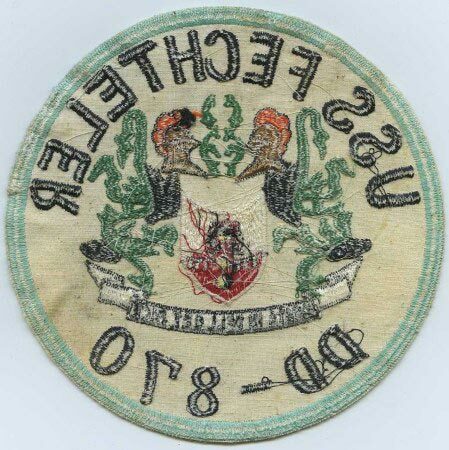 On 10 April 1963, after the completion of this work, Thresher began post-overhaul trials. 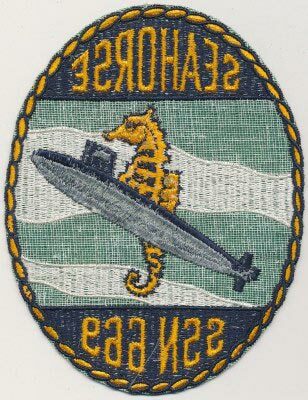 Accompanied by the submarine rescue ship Skylark (ASR-20), she transited to an area some 220 miles east of Cape Cod, Massachusetts, and started deep-diving tests. 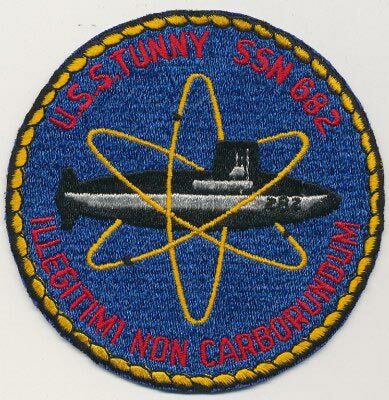 As these proceeded, garbled communications were received by Skylark, indicating trouble aboard the submarine. 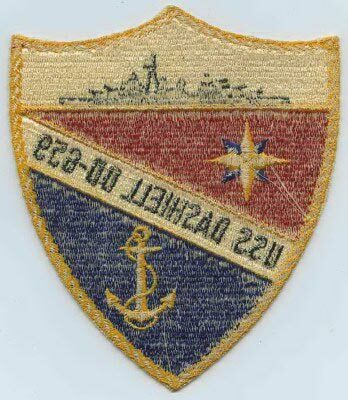 It gradually became apparent that she had sunk, taking the lives of 129 officers, crewmen, and civilian technicians. 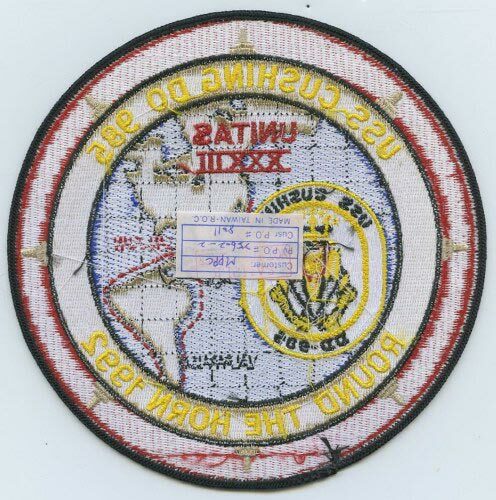 Left patch came in an opened-clear-plastic-bag which I believe is the original "point-of-sale" container. 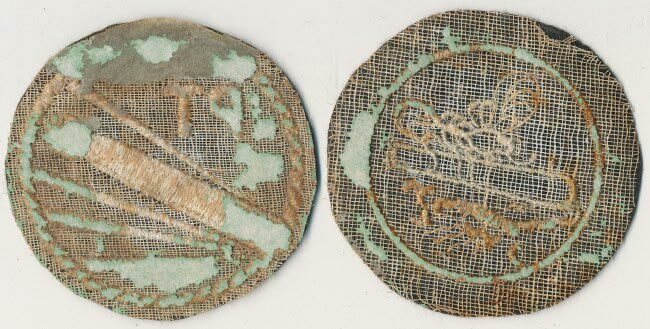 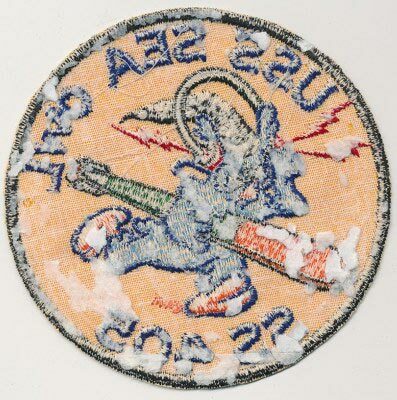 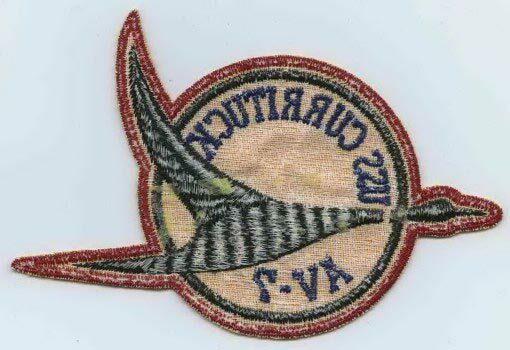 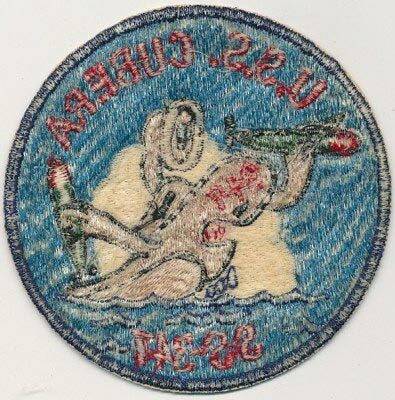 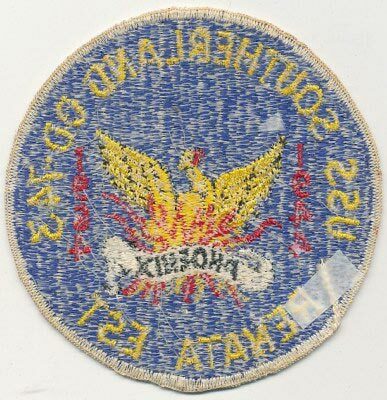 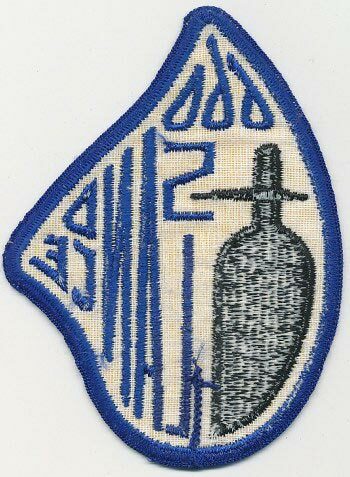 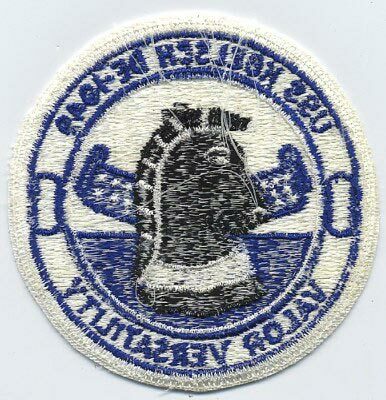 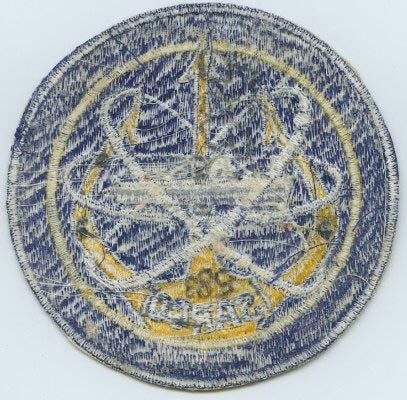 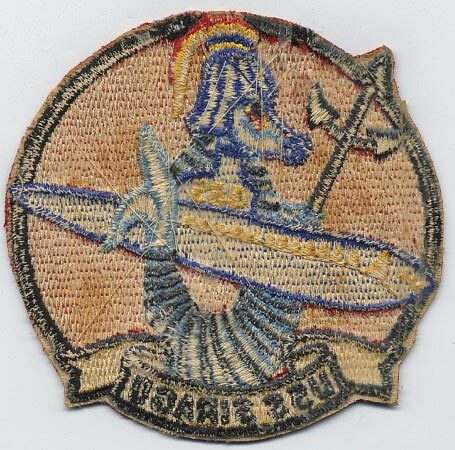 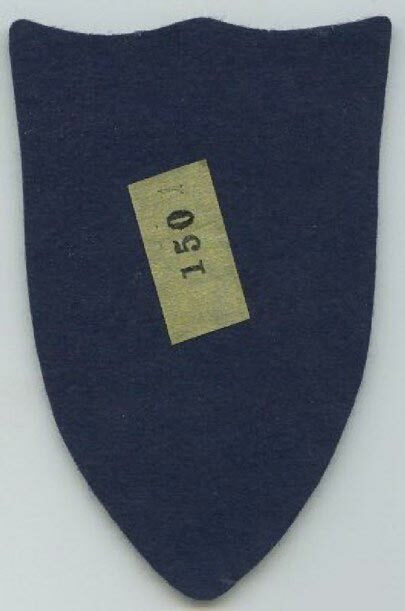 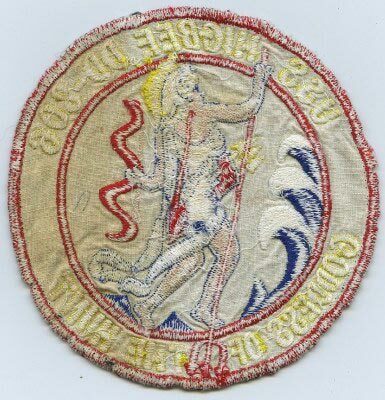 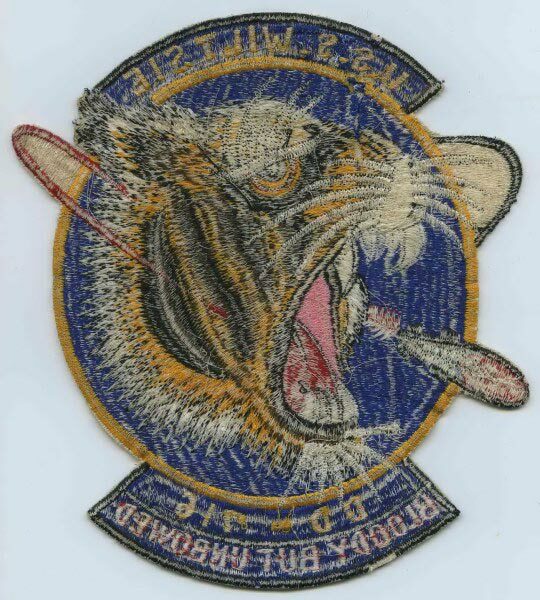 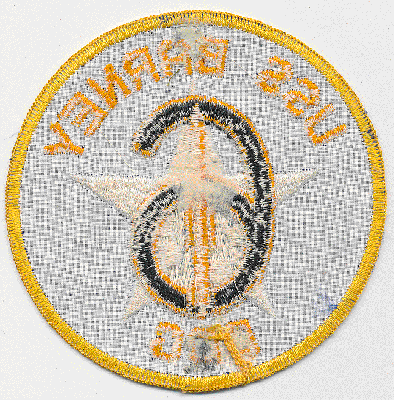 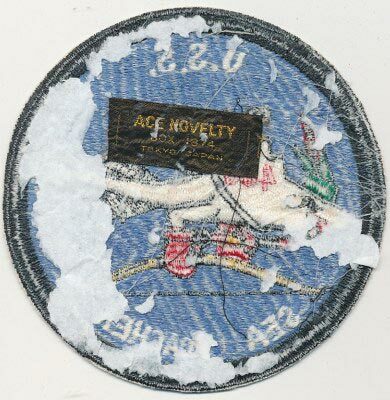 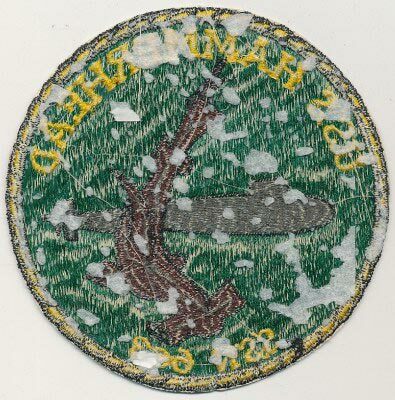 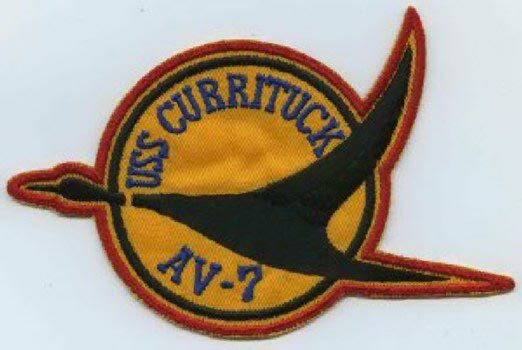 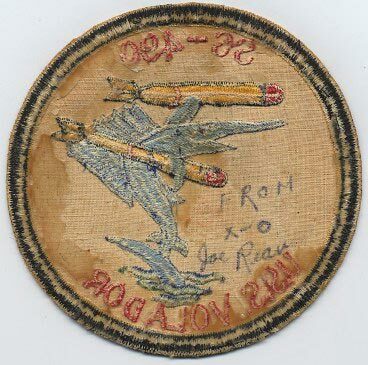 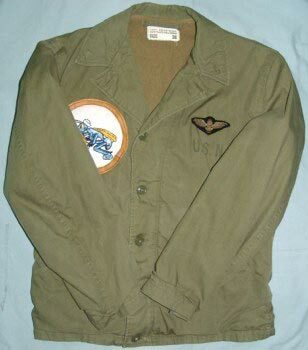 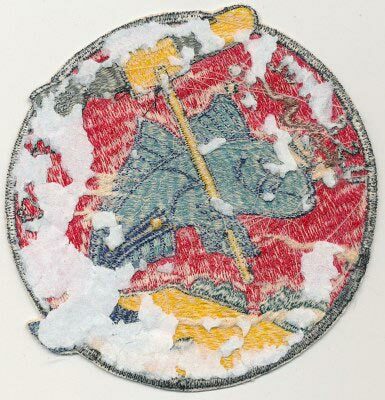 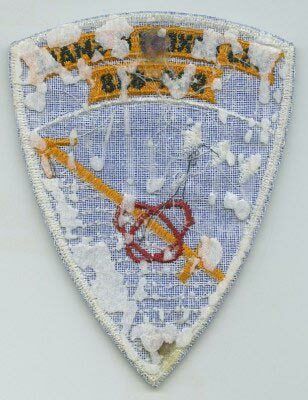 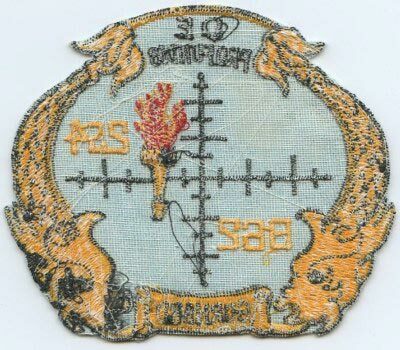 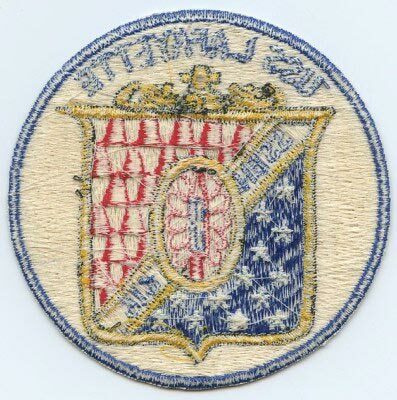 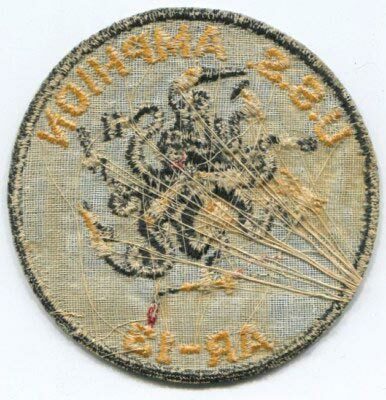 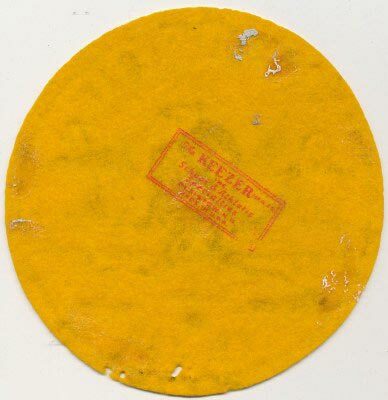 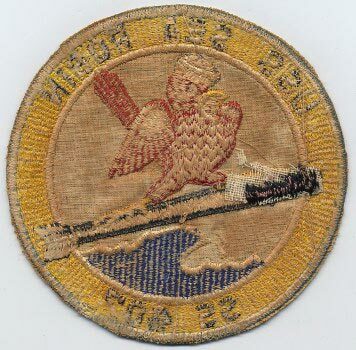 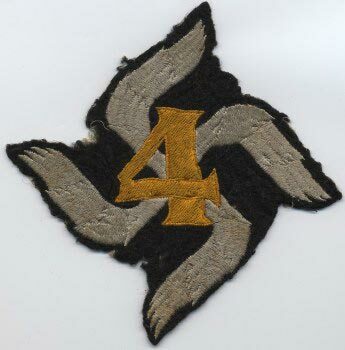 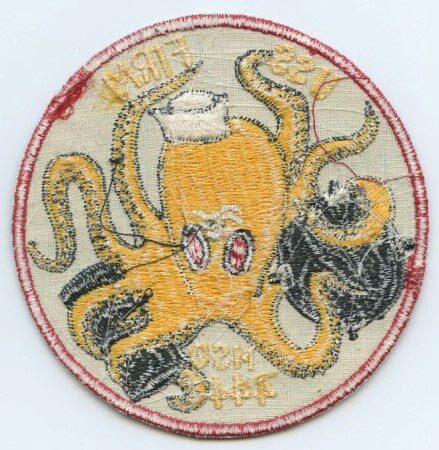 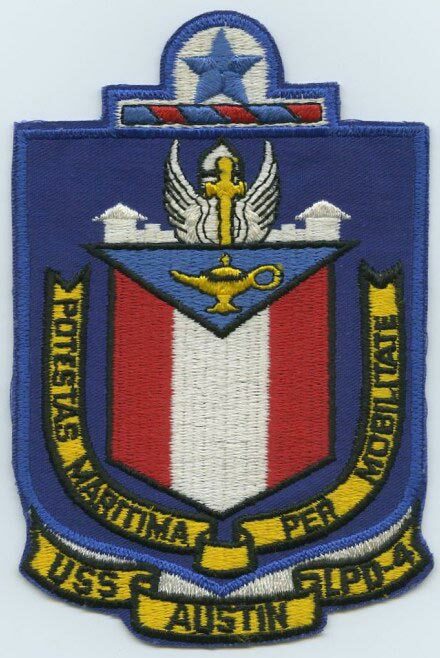 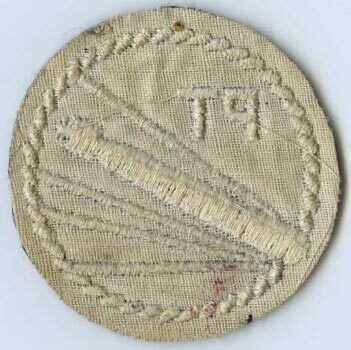 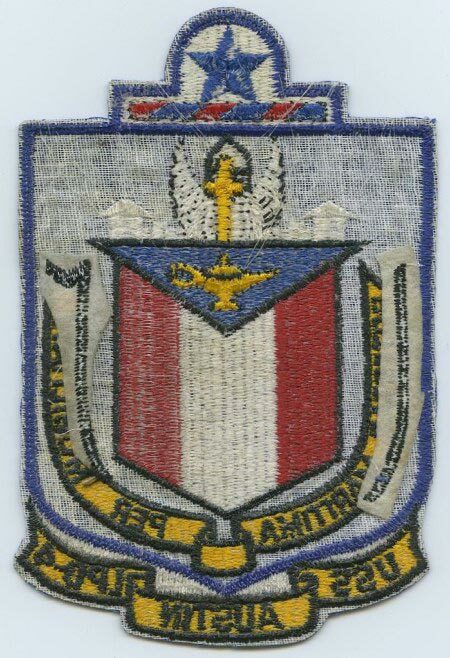 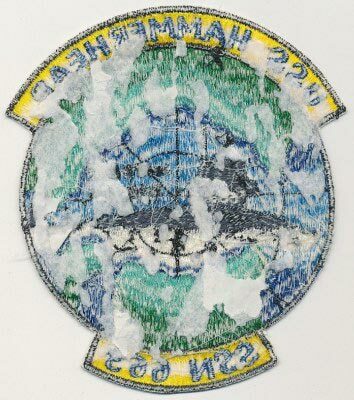 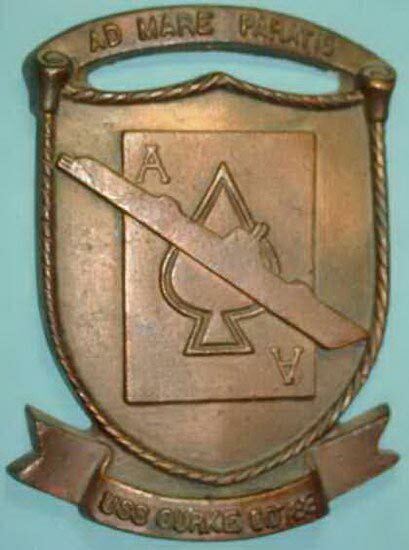 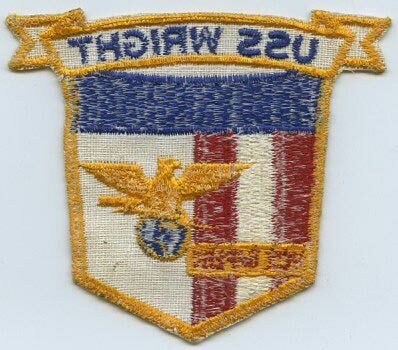 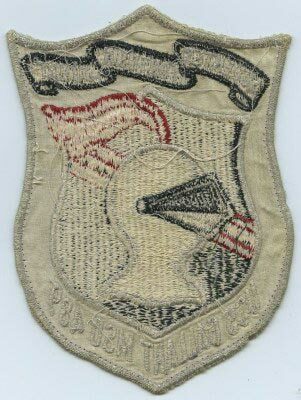 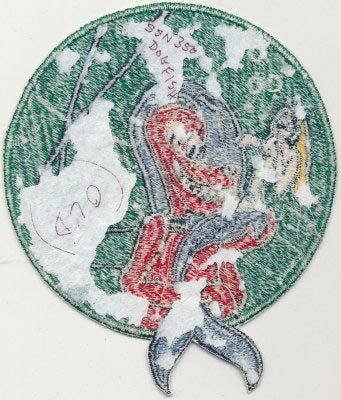 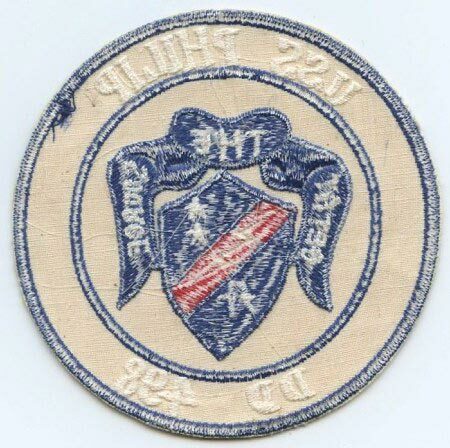 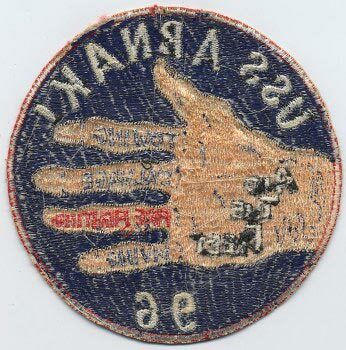 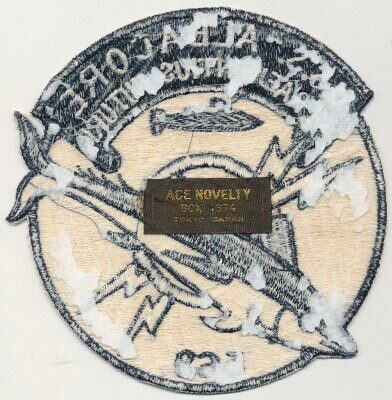 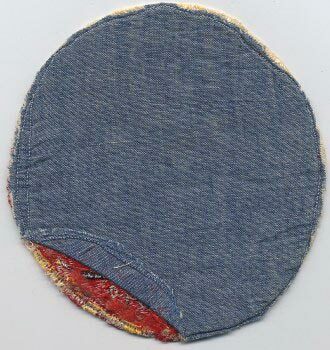 UI#140 - found with ABNAKI patch, looks NAVAL Aviation "AirCrew-4" or ? 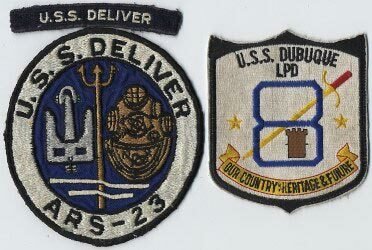 A Fleet Tug (earlier Commissioned as AT-98 in 1944); participated in the D-Day and Okinawa landings, Korean War, and Vietnam, awarded 11 Battle Stars. 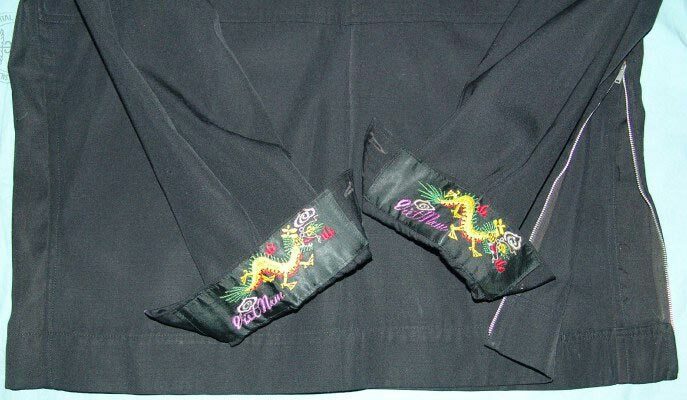 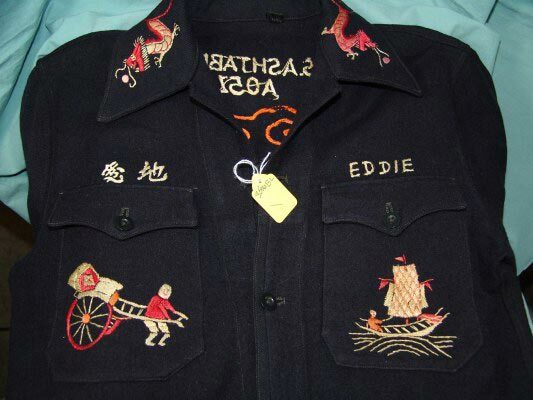 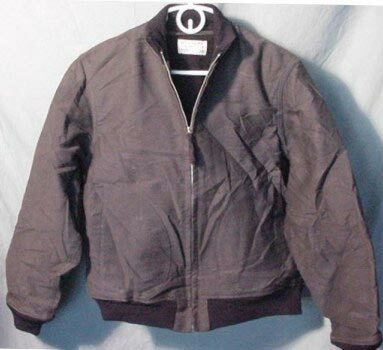 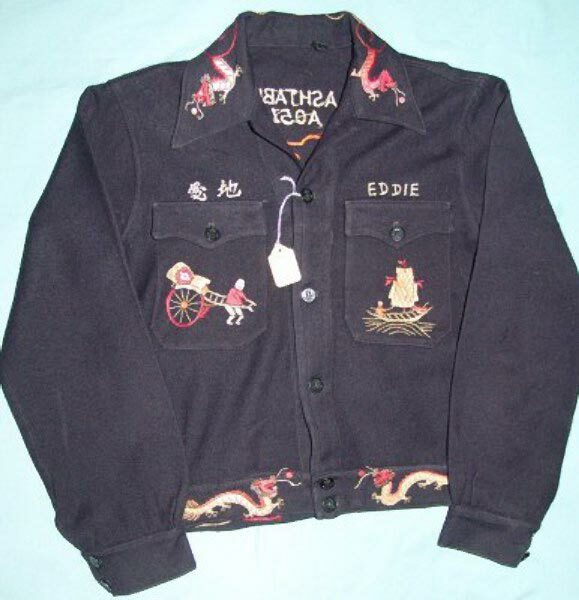 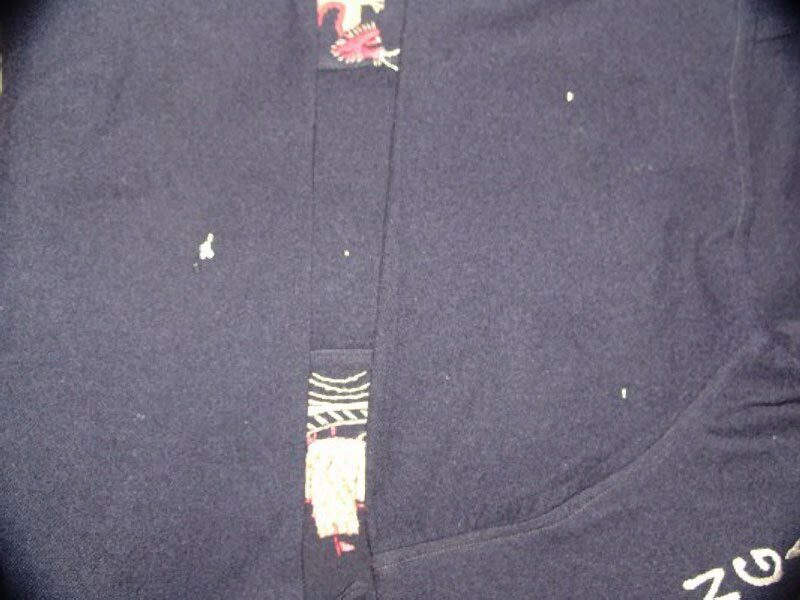 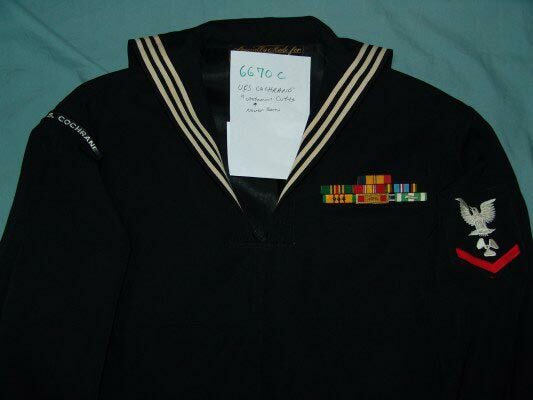 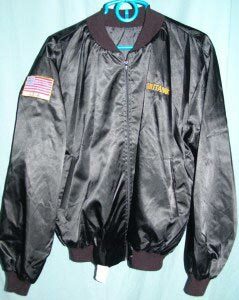 The color of this jacket is Dark Navy Blue - some of the pictures show it as faded = bad photographer. 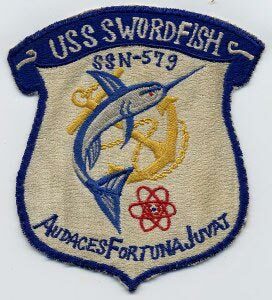 Transferred to Russia(USSR) in 1945 and renamed "Admiral Mararov"
Knight on Seahorse, "Gray Ghost of The Korean Coast"
"TO SERVE READY FOR SERVICE"
"UNITAS XXXIII - ROUND THE HORN"
"UNITAS XXXII - ROUND THE HORN 1991"
Sold and Redesignated Korean Navy "ROKS Chungmu (DD-911)"
"PARATA IN DELL O ET PACE"
Gallant's second tour with the 7th Fleet (August 1959-March 1960) again included training with the Republic of Korea Navy. 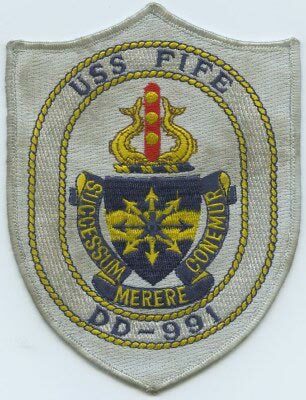 While operating out of the Philippines, she participated in joint readiness operations with the navies of SEATO nations. 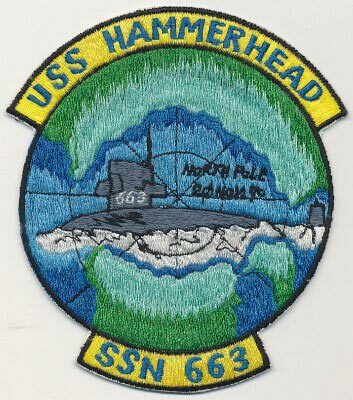 She returned to Long Beach in March 1960 and spent the next 12 months in a training schedule with the Mine force of the 1st Fleet that carried her as far north as Ketchikan, Alaska. 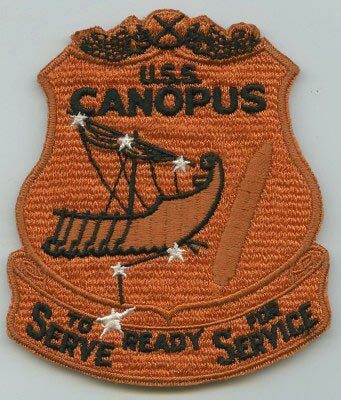 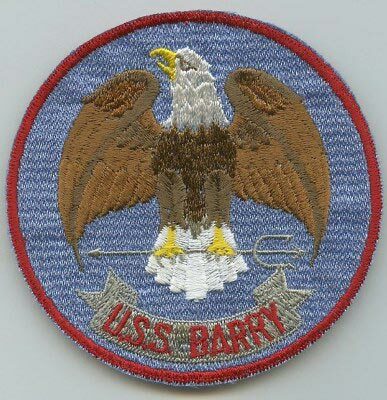 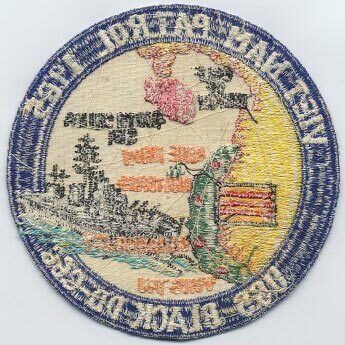 Service during her third deployment in the Far East (August 1961-April 1962) once again included fleet readiness defense exercises with the navies of Southeast Asia. 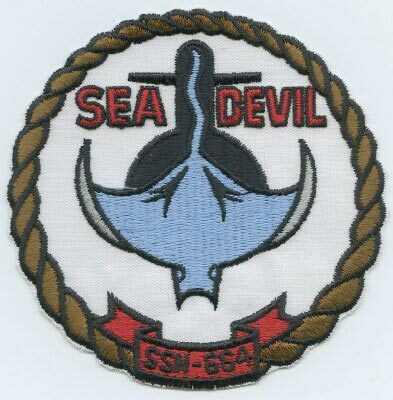 In addition, she patrolled the coast of South Vietnam and provided valuable service during training operations of the South Vietnam Navy. 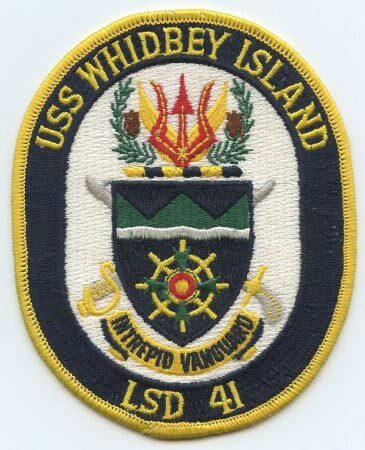 Returning to the West Coast on 20 April 1962, she resumed duty out of Long Beach; and during the next 15 months participated in fleet maneuvers and mine squadron exercises off southern California. 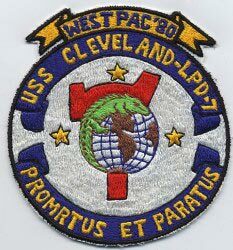 Departing Long Beach on 12 August 1963, Gallant steamed on her fourth deployment to the troubled Far East, where she arrived Sasebo, Japan, on 23 September. 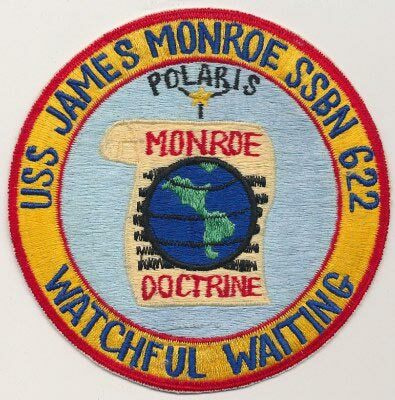 There, she resumed peace-keeping operations with the 7th Fleet; and, during readiness patrols in Far Eastern waters, she cruised from the coast of South Korea through the East China and South China Seas to the coast of Southeast Asia. 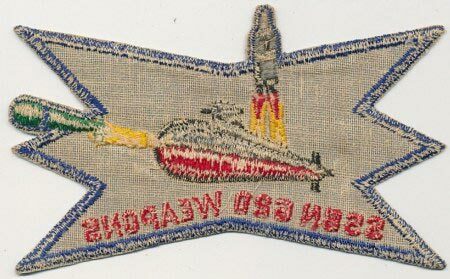 She departed WestPac in the spring of 1964, and after additional training in hunting mines, sailed for blockade and coastal patrol duty off Vietnam. 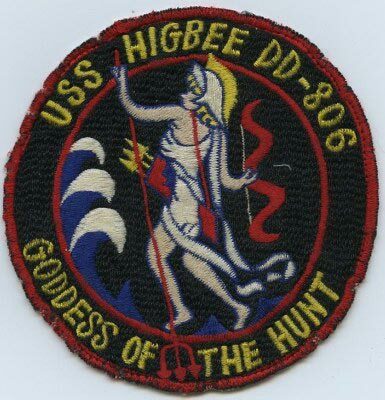 Arriving off the southern coast of South Vietnam on 1 October 1965, she joined "Operation Market Time", designed to control coastal infiltration of men and supplies by the Viet Cong. 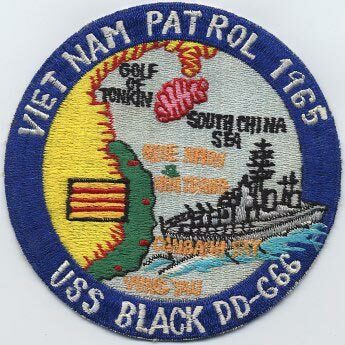 Throughout the remainder of the year, Gallant boarded and searched suspicious Vietnamese boats. 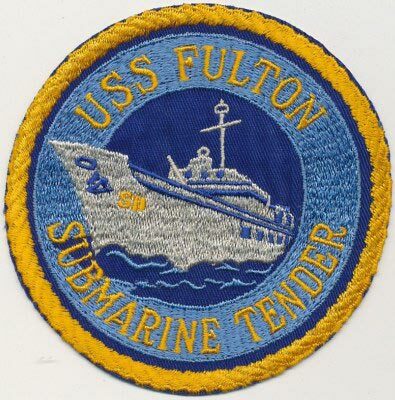 She supported "Market Time" operations until 9 March 1966 when she departed for the United States. 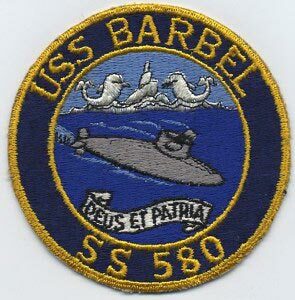 Steaming via the Philippines, Guam, and Pearl Harbor, she arrived Long Beach on 28 April. 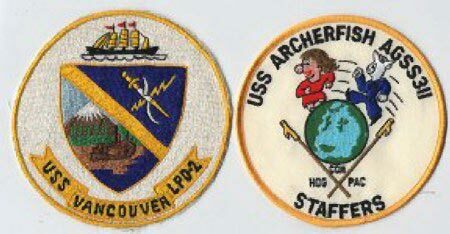 During the remainder of the year, she operated along the West Coast from Long Beach to Portland, Oregon, to maintain her fighting capabilities and operational readiness. 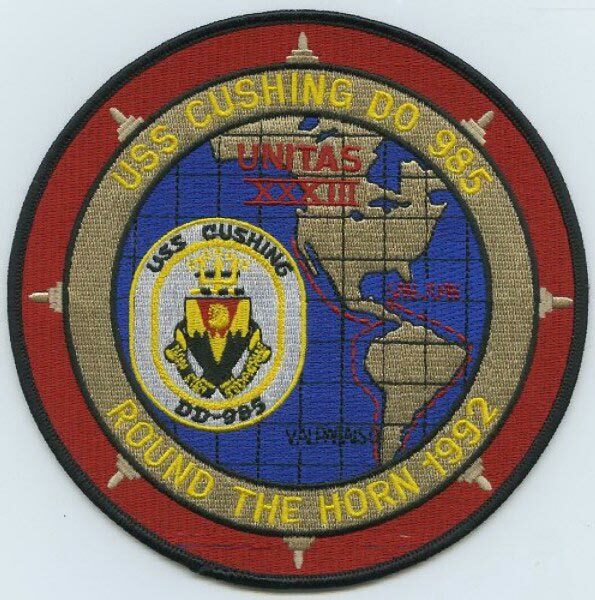 Decommissioned 29 April 1994 and sold to Taiwan September 8, 1994; Renamed Yung Ku (M 1308). 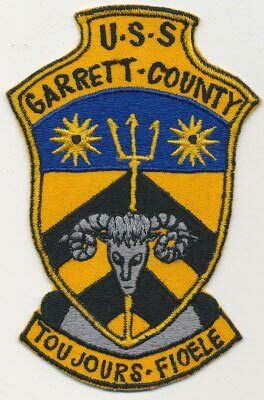 HAL-3's DETs 3 and 6 assigned to the Garrett County. 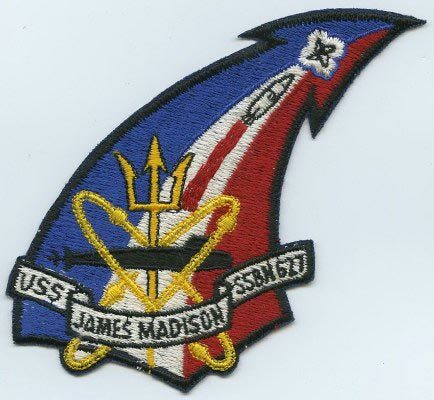 On July 31, 1964 the USS Maddox started a routine patrol in the Gulf of Tonkin Gulf; this routine patrol lead to the Bombing of NVN facilities. 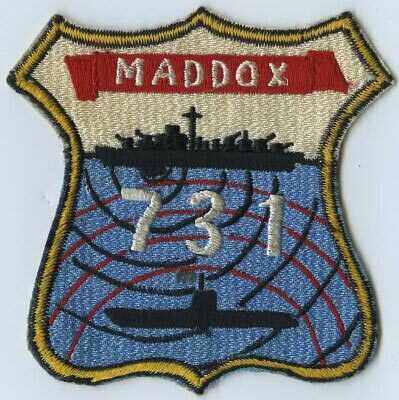 On August 2nd the Maddox cruising in international waters was closed and attacked by 3 x NVN Navy Torpedo Boats. 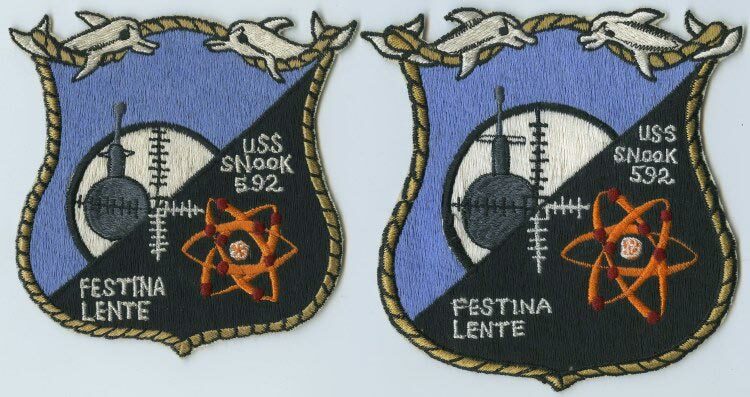 Two of the Commie boats were put-out-of-action with direct hits. 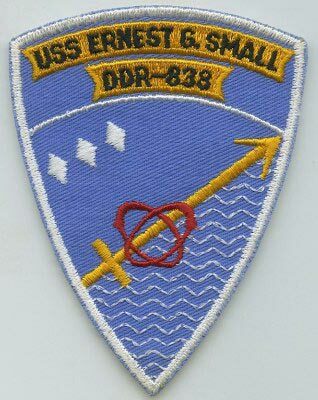 The attack was assumed to have been in error; but on 4th the Maddox and the USS Turner Joy (DD-951), which had joined the Maddox, were again attacked. 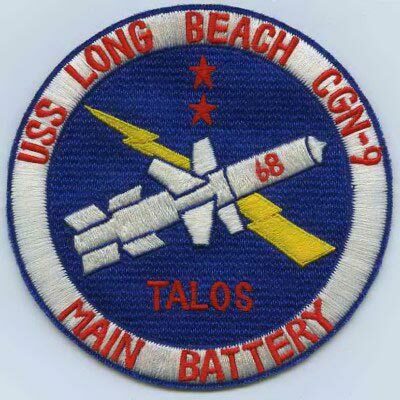 Retaliatory airstrikes on NVN patrol boat bases and associated depots commenced immediately. 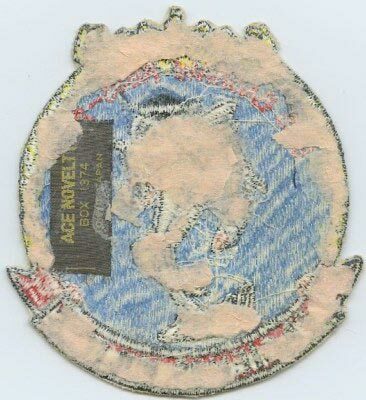 "ANY BEACH IN THE WORLD"
Bad scan on the ZIPPO, the LST has all the paint remaining - LIghter was never used. 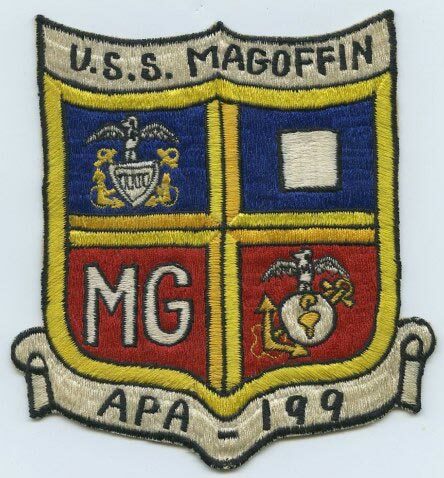 Participated in the Okinawa landings April 1, 1945; during the battle for Okinawa, Magoffin, the first ship in Transport Division 54 to be unloaded, assisted in shooting-down 2 Japanese aircraft; after Okinawa she carried men and cargo between the U.S. and Western Pacific bases until the following spring; On March 10, 1946 she reported to the 19th Fleet in San Francisco, California for Inactivation; Decommissioned August 14, 1946. 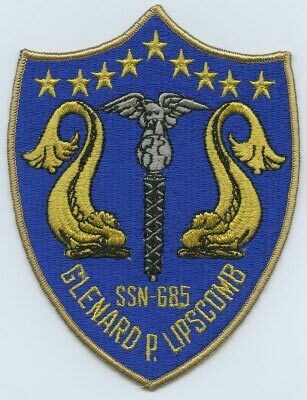 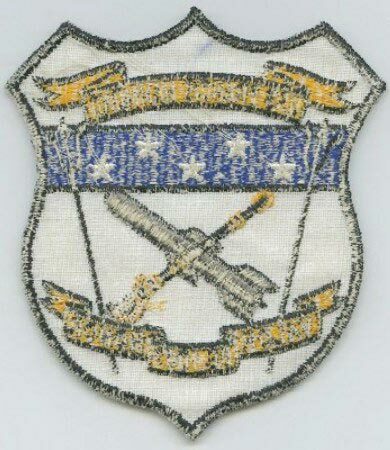 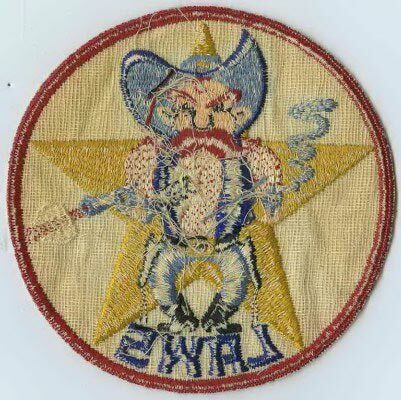 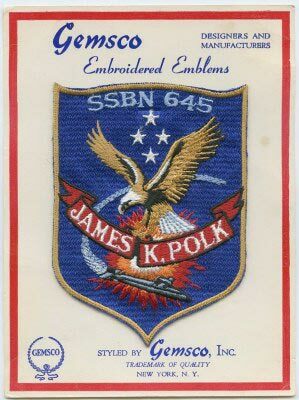 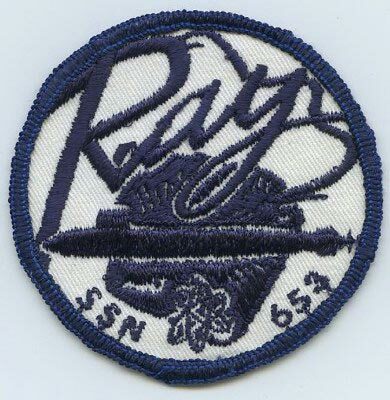 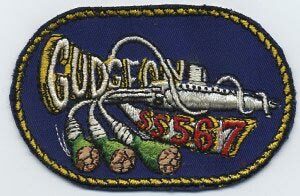 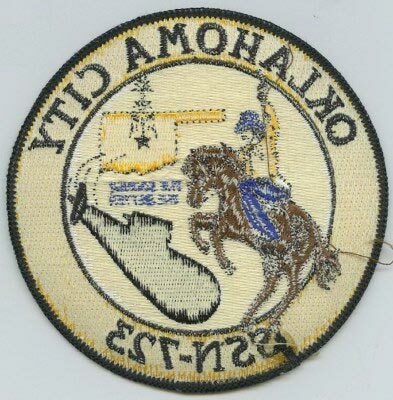 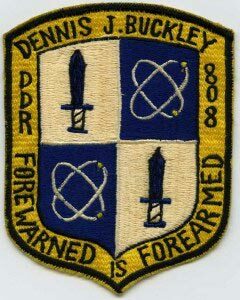 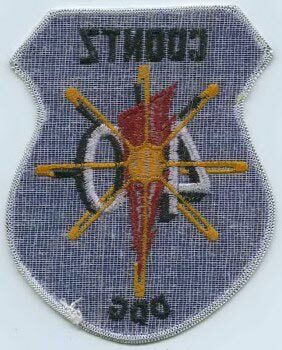 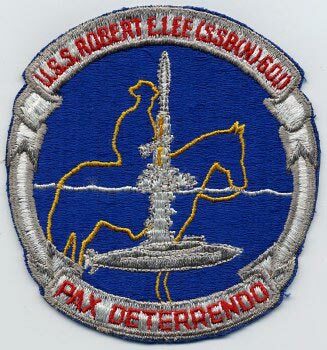 Reactivated for Korean War; Recommissioned October 4, 1950 and participated in the Korean War effort. 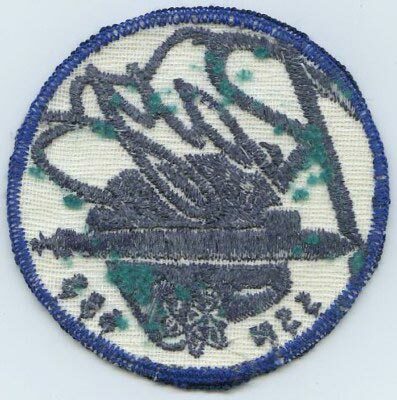 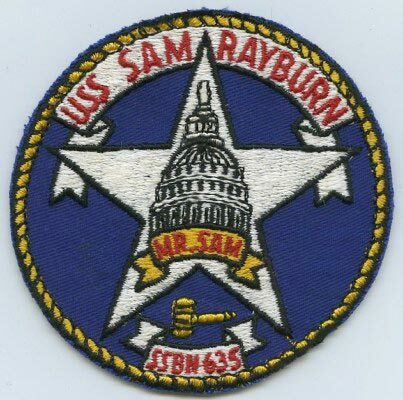 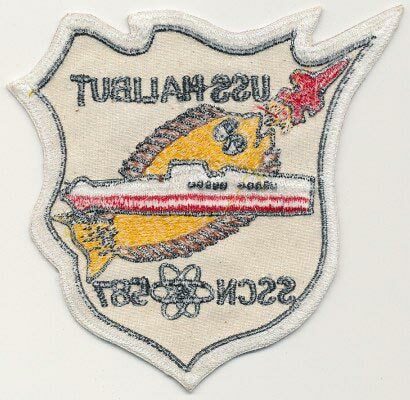 Participated in Nuclear Testing in the Pacific; carried Troops to the Persian Gulf region to provide support to the British and American forces sent into Jordan and Lebanon. 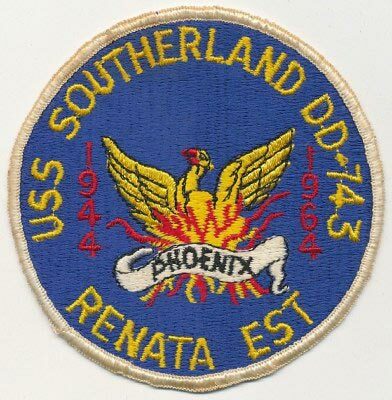 In August 1964 she was heading to San Diego after completing a tour but was ordered back to Okinawa to pickup troops and transport them to Vietnam as a result of the USS Maddox incident in the Gulf of Tonkin; transported troops/cargo, pulled Coastal Operations, patrol, and other missions for the SEA effort. 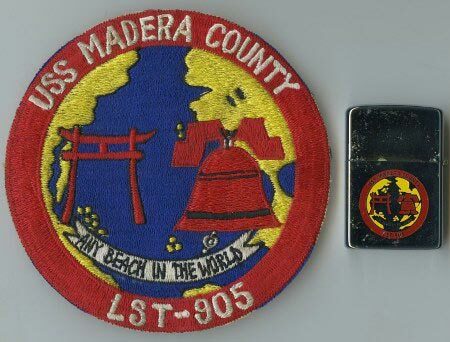 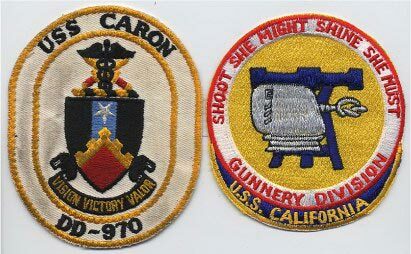 Returned to San Diego December 9, 1967 for Inactivation; Decommissioned April 10, 1968 and anchored in Suisun Bay, California as a Reserve ship; Redesignated LPA-199 January 1, 1969. 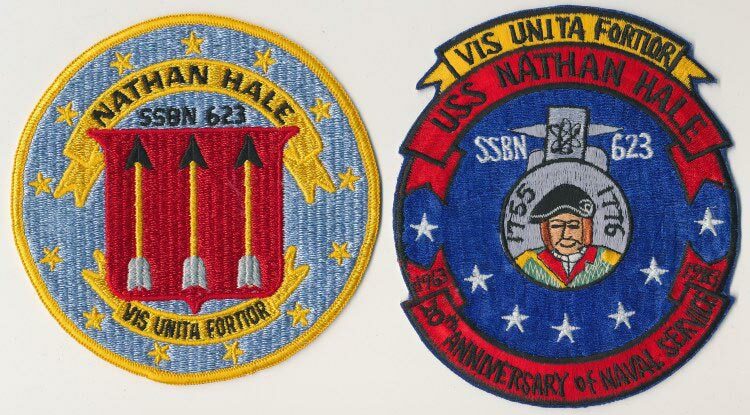 She received 7 Battle/Campaign Stars for Okinawa, Korean War, and the Vietnam War.
" 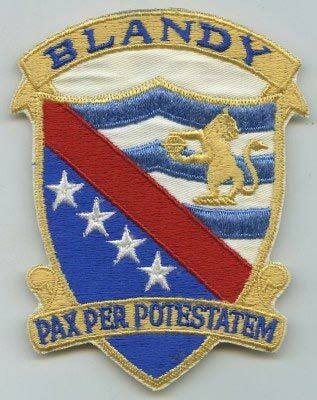 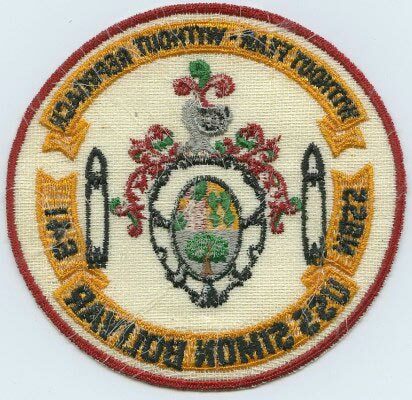 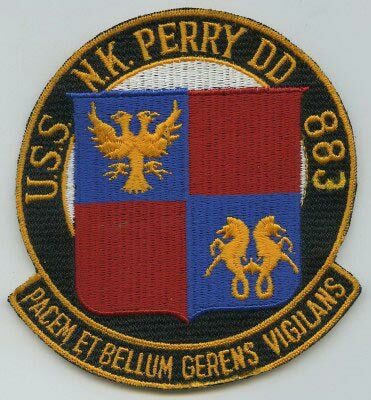 WITH HONOR WE SERVE"
USS New Jersey (BB-62), Gun Turret "3"
"FINEST FRIGATE IN THE FLEET"
"PACEM ET BELLUM GERENS VIGILANS"
September was not a good month for this ship. 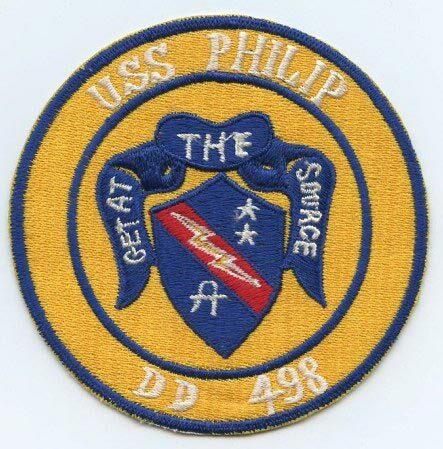 Landing Ship Dock Rushmore departed Norfolk on 5 August 1944 for the Pacific where she participated in four amphibious landings: the Battle of Leyte in October 1944; of Palawan in February 1945; of Mindanao in March 1945; and of Tarakan, Borneo, in May 1945. 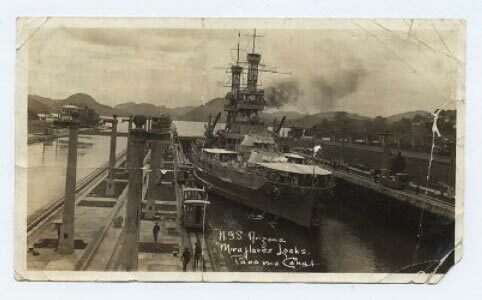 Rushmore entered Leyte Gulf early in the morning of 20 October, and after discharging her LCMs from her boat well in one of the first waves to hit Yellow Beach near Dulag, Leyte, acted as repair ship for damaged landing craft. 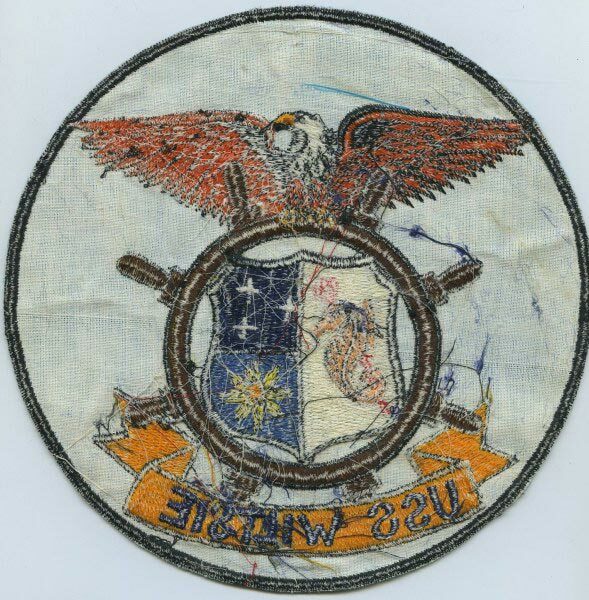 At Palawan on 28 February 1945, she landed Army-manned LCMs and other craft loaded with personnel and equipment of the 167th Field Artillery of the U.S. 8th Army. 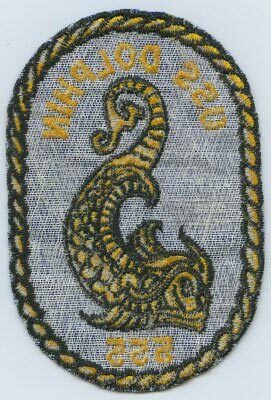 At Mindanao she carried a record 867 men for a 10 March landing on a beach north of Zamboanga City. 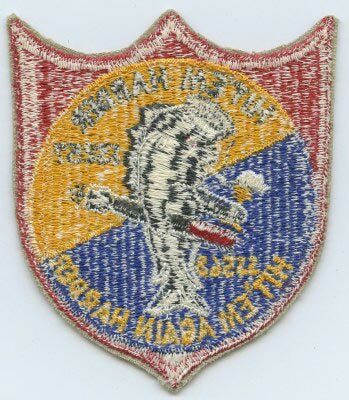 For the invasion of Tarakan on 1 May, Rushmore carried U.S. Army-manned LCMs loaded with Australian troops and light tanks. 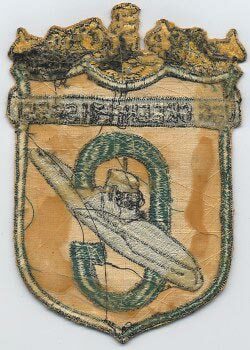 The Australian troops were a battalion of the famed "Rats of Tobruk" which had helped to chase German General Erwin Rommel out of Africa. 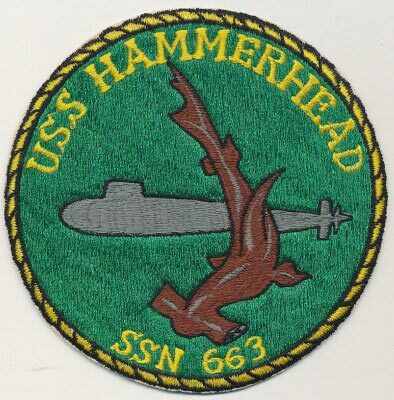 During this landing, Rushmore was hit by a Japanese torpedo fired from the beach, which fortunately glanced off her hull without exploding or causing damage. 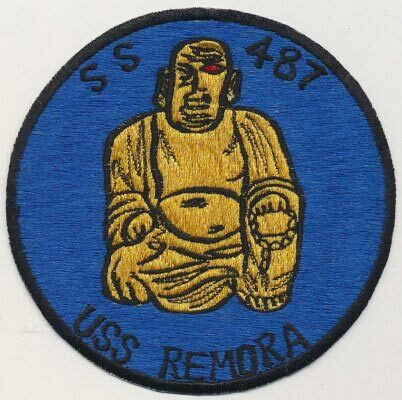 Returning to the Philippines, Rushmore loaded a 137-foot Japanese submarine which she carried to San Francisco to serve as a display to help sell war bonds. 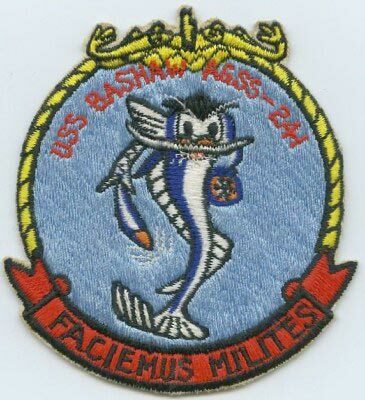 In the United States from 2 June to 27 June, Rushmore next carried landing craft from base to base in the South Pacific and was in Pearl Harbor when the war ended. 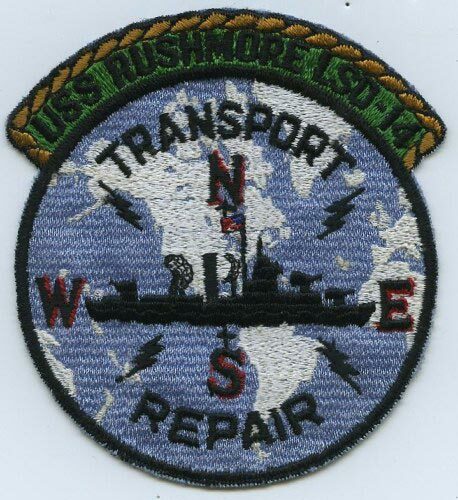 After the war, Rushmore operated in the Far East, particularly in occupied Japanese waters. 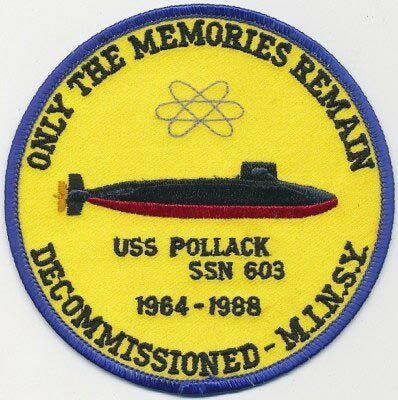 Decommissioned August 16, 1946 and Mothballed in Pascagoula, Mississippi. 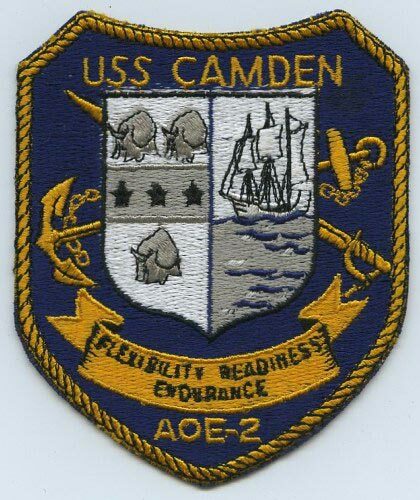 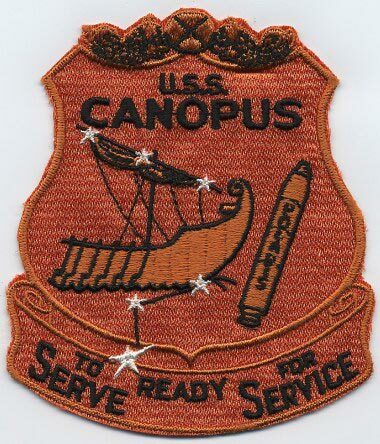 Recommissioned at Charleston, S.C., September 21, 1950, to begin a period of Atlantic Fleet service. 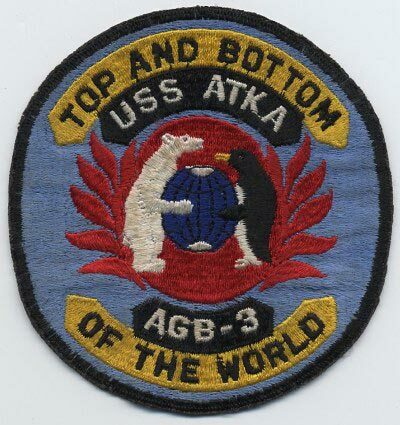 Her next ten years included Caribbean exercises, Reserve cruises, a Mediterranean cruise, and regular Arctic trips to resupply the DEW Line bases. 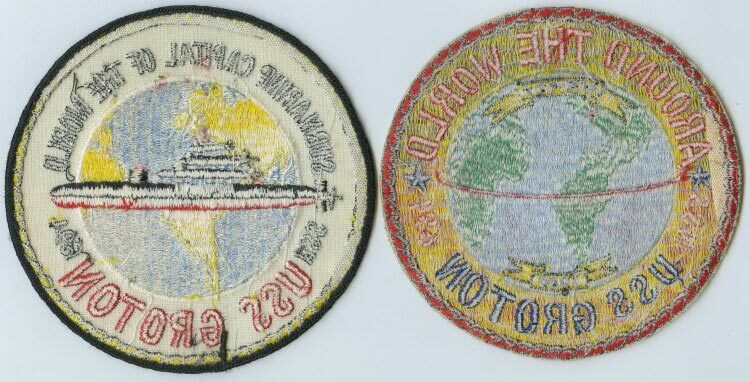 Rushmore was present for ceremonies at Istanbul, Turkey, in May 1954 on the occasion of the return of various small lend-lease vessels from the USSR. 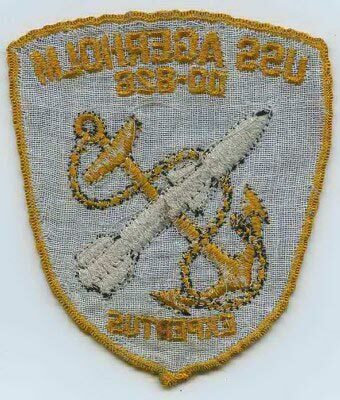 Rushmore returned these ex-Soviet Navy vessels to the United States. 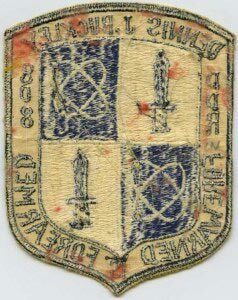 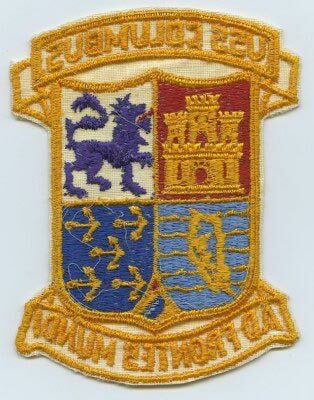 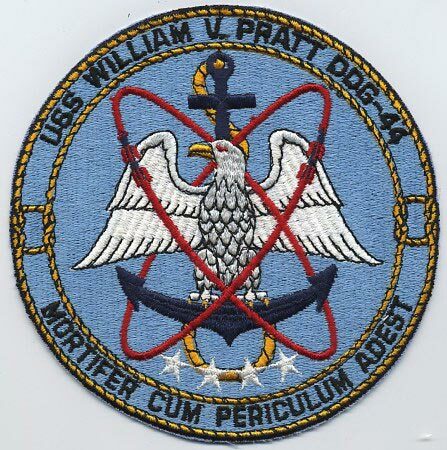 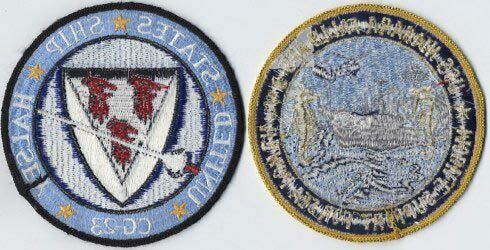 Decommissioned September 30, 1970 and Transferred to the Maritime Administration's National Defense Reserve Fleet, at Fort Eustis on the James River, in February 1971. 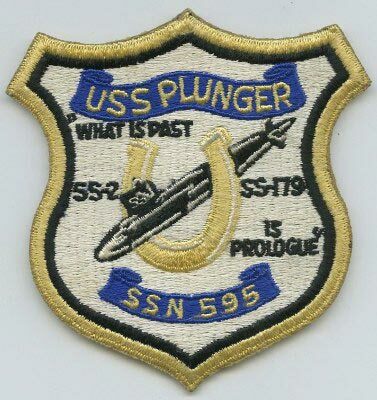 Used as a Target ship and Sunk April 16, 1993. 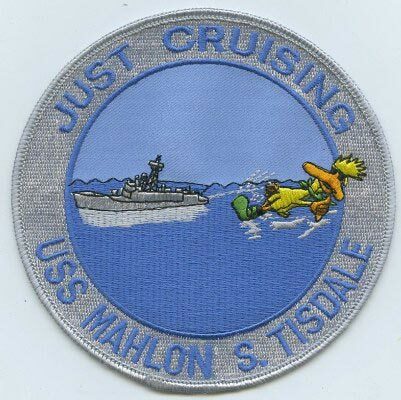 The USS Mahlon S. Tisdale (FFG-27) a guided-missile frigate, was named for Vice Admiral Mahlon Street Tisdale (1890-1972); Commissioned November 27, 1982; Decommissioned September 27, 1996; Stricken from the List in February 1998; Transferred to Turkey April 5, 1999 as the TCG Gökçeada (F 494). 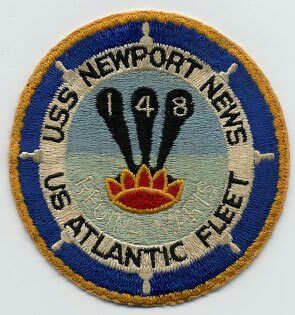 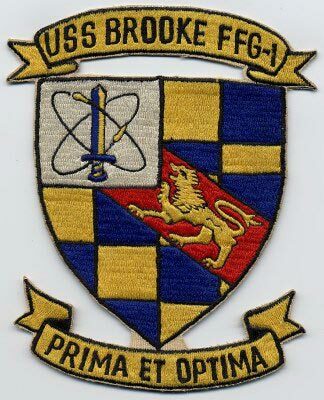 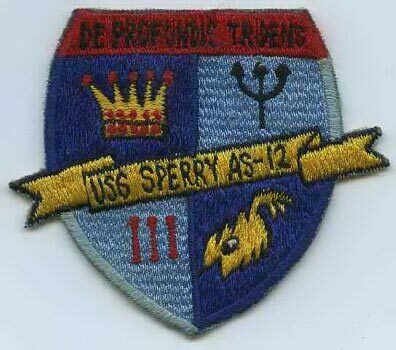 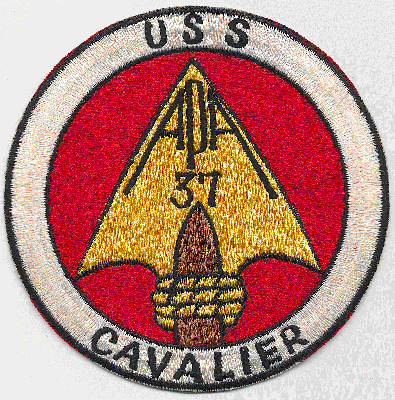 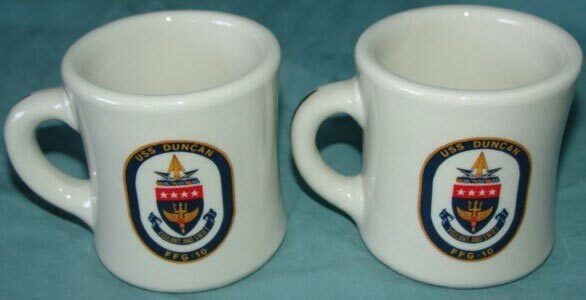 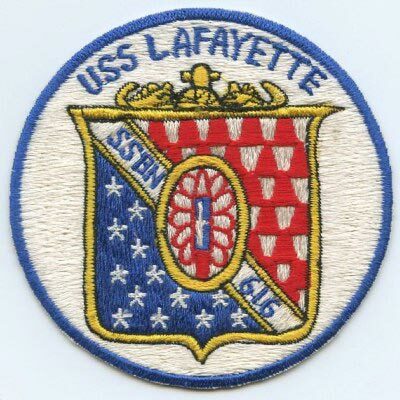 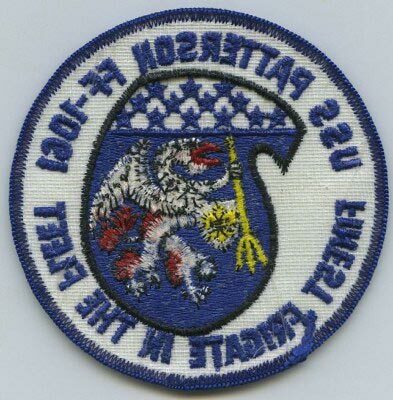 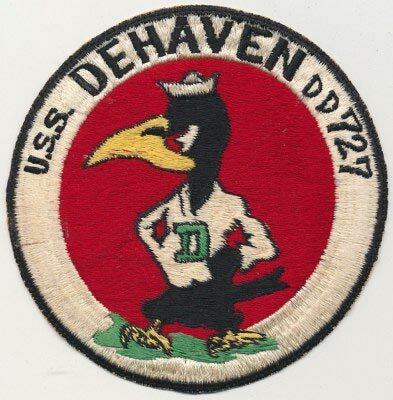 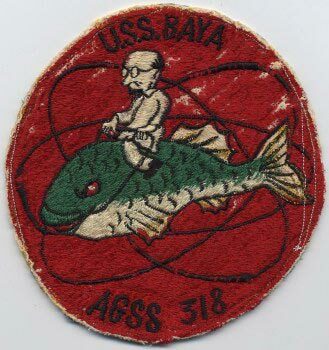 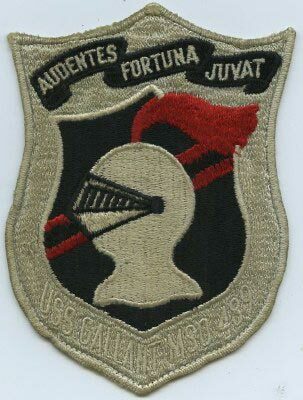 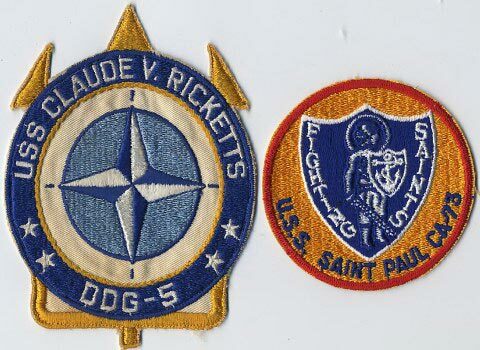 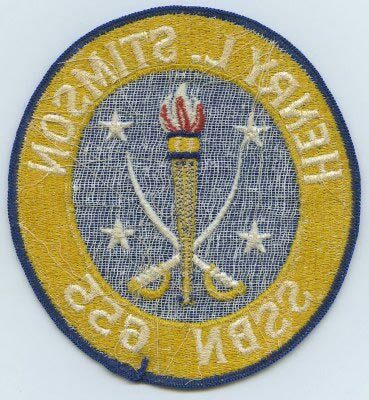 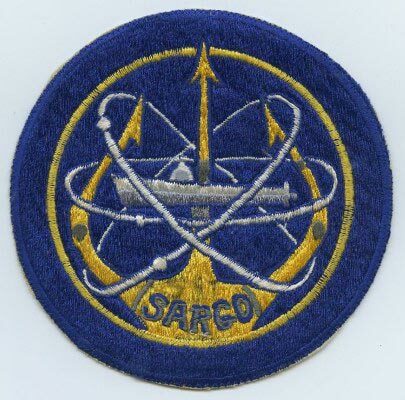 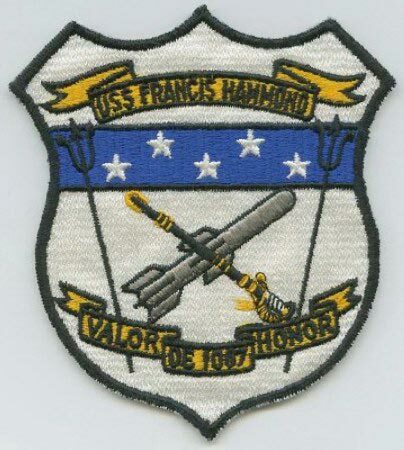 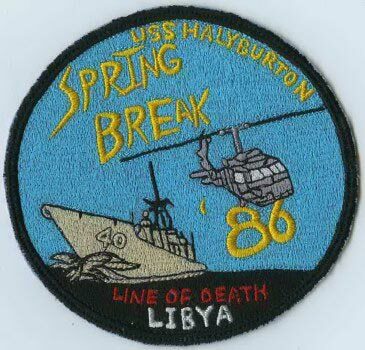 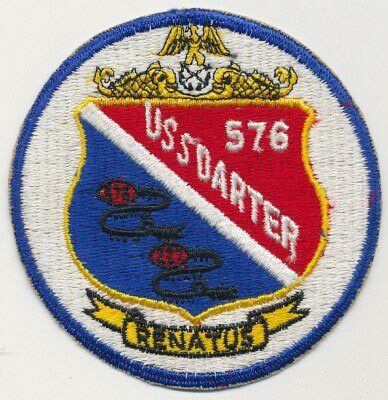 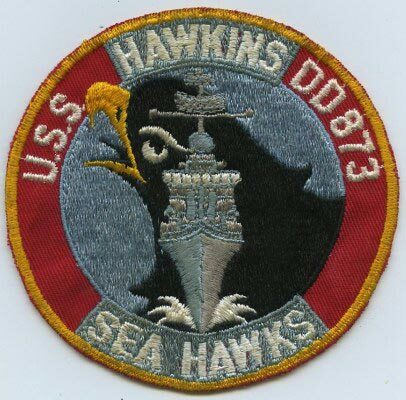 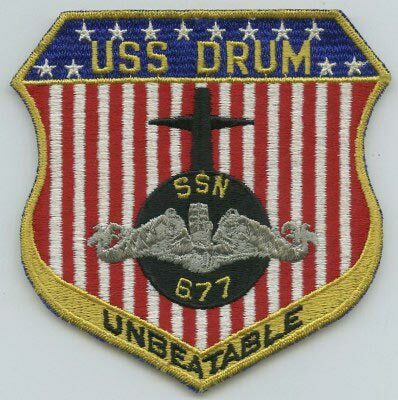 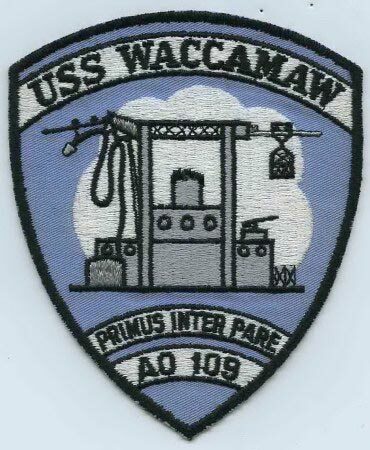 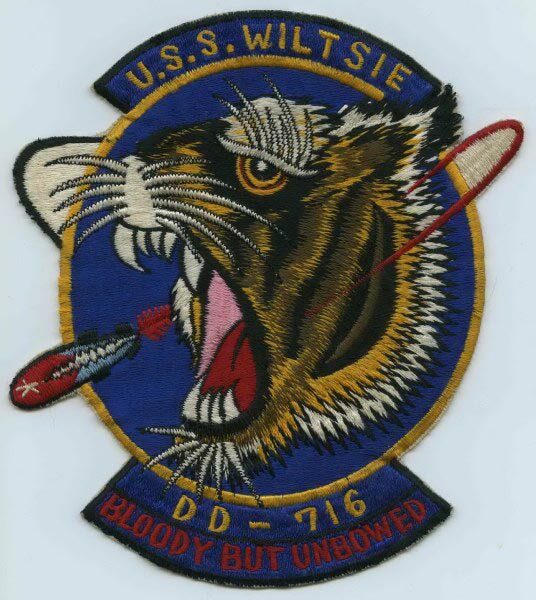 From the same Family Grouping as: HU-1, UNIT-7, USS Firm, USS Force, USS Philips, USN Magazine Subic Bay, and etc. 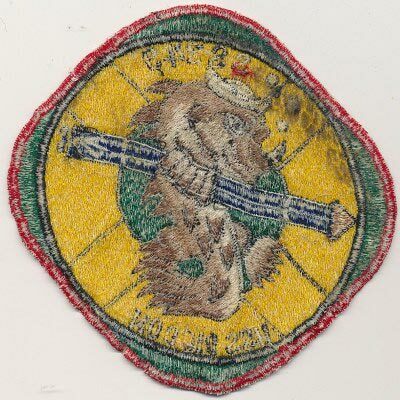 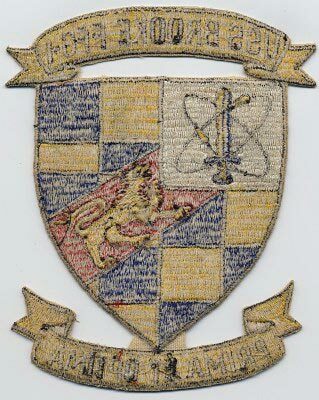 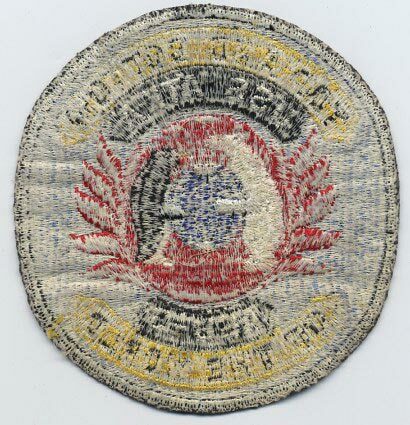 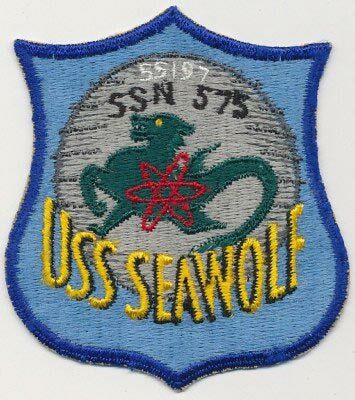 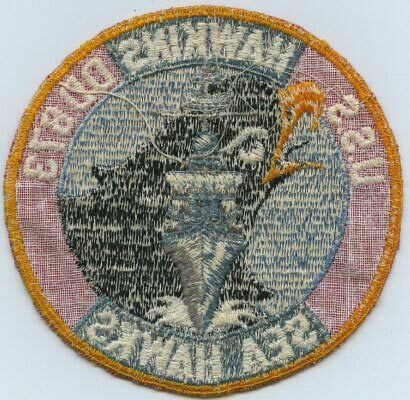 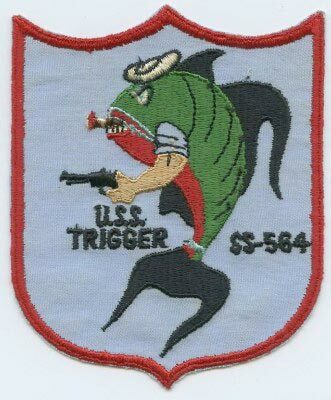 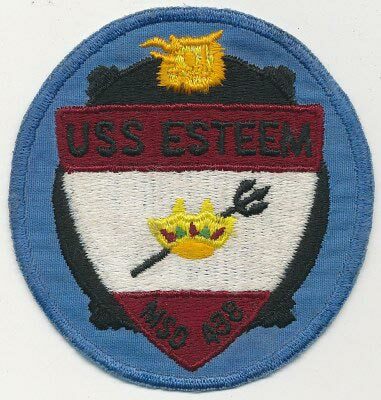 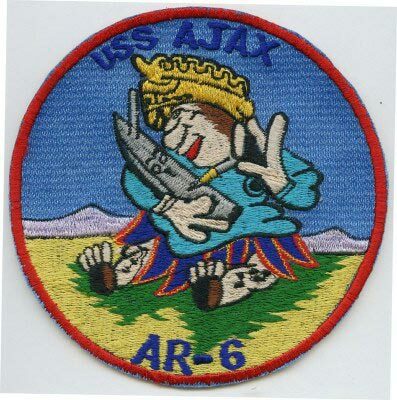 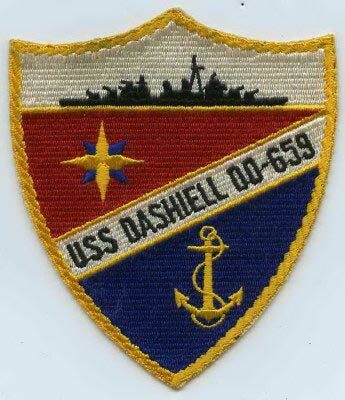 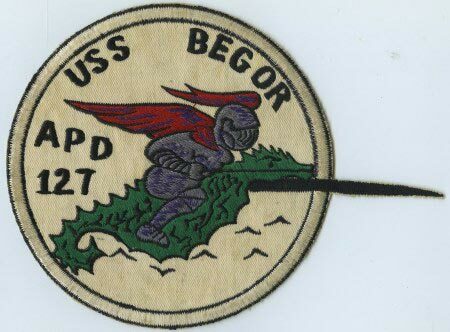 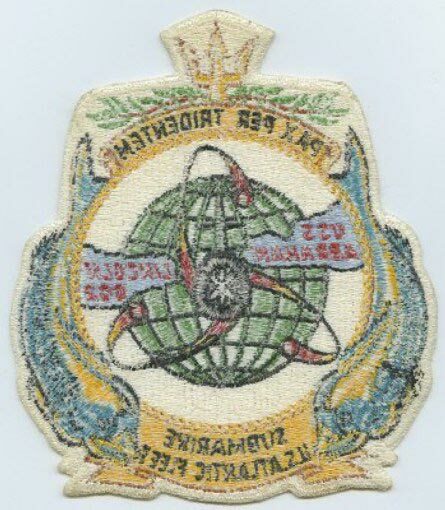 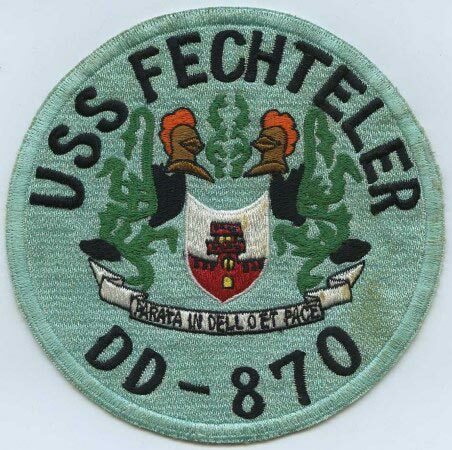 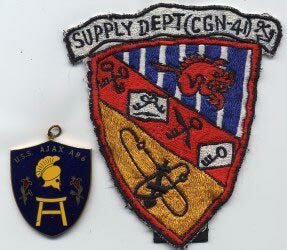 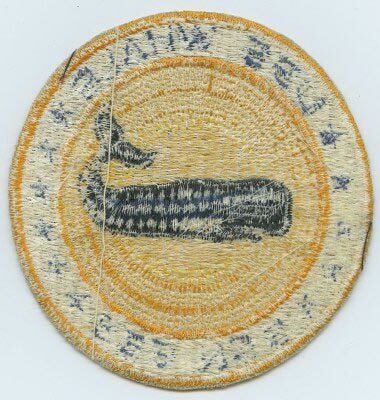 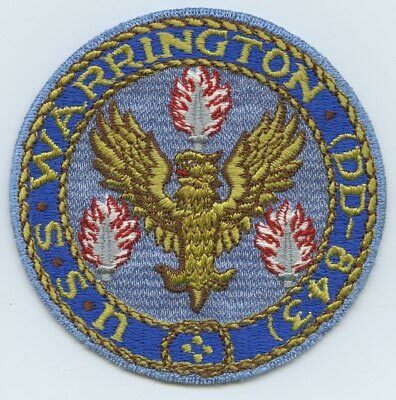 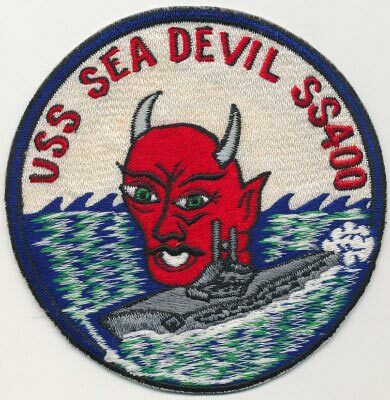 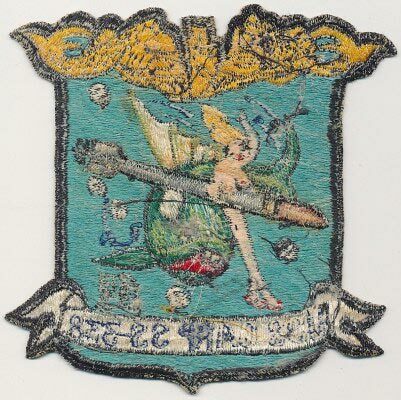 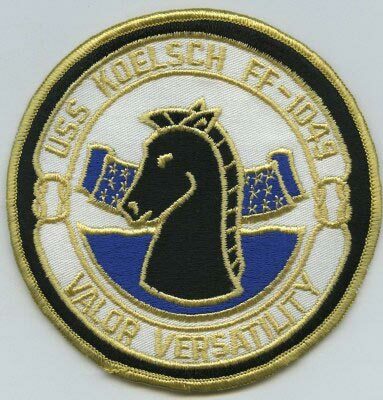 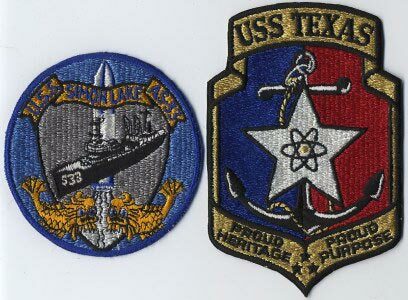 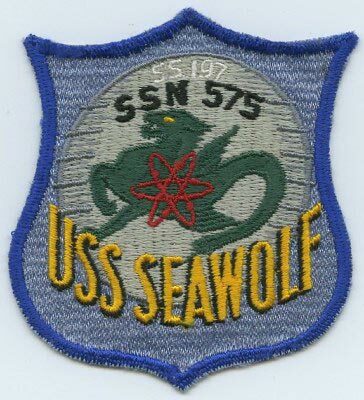 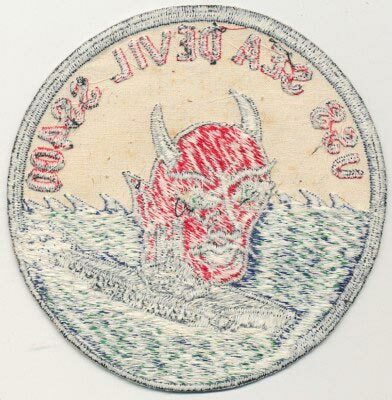 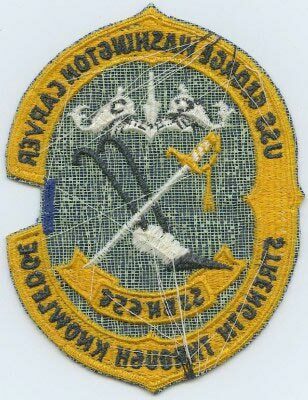 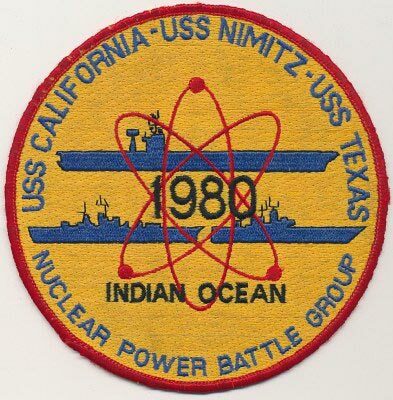 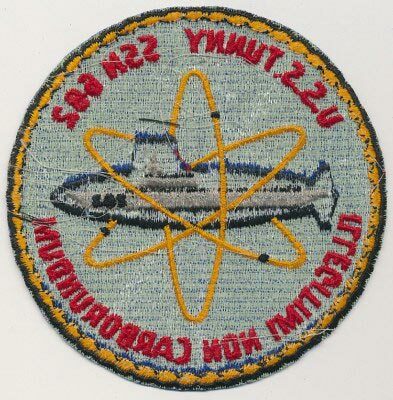 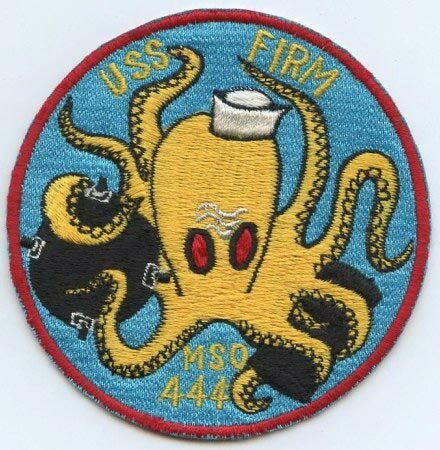 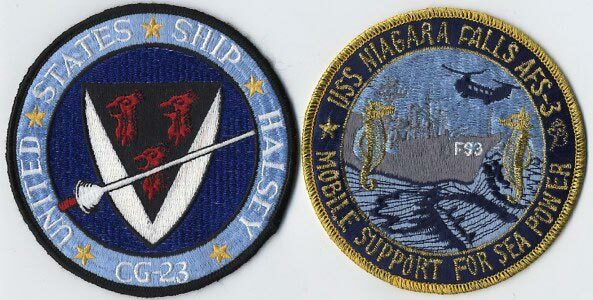 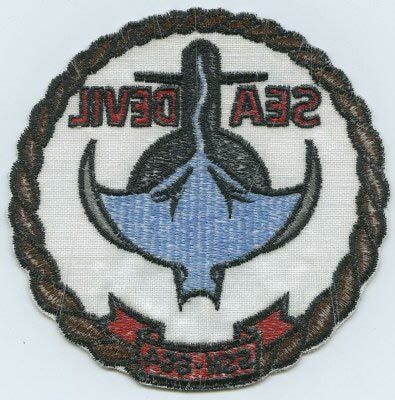 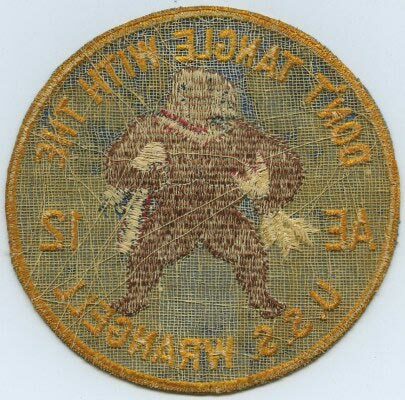 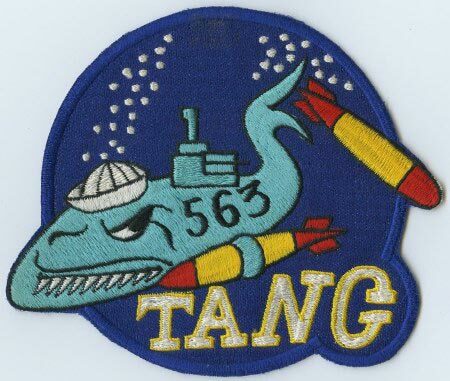 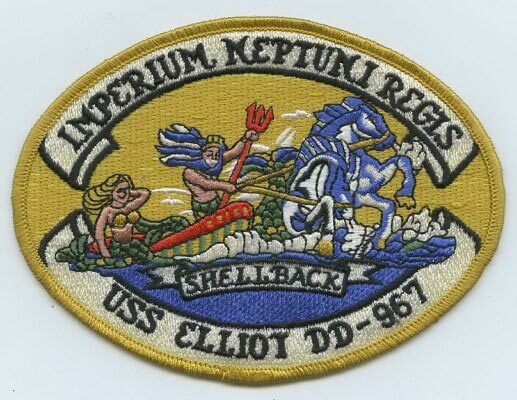 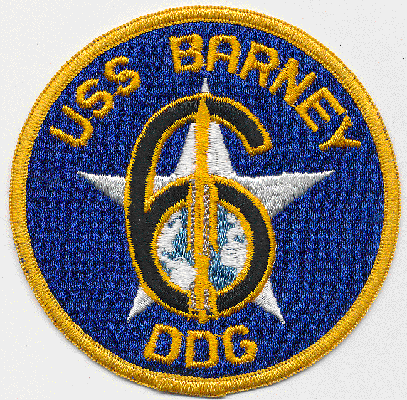 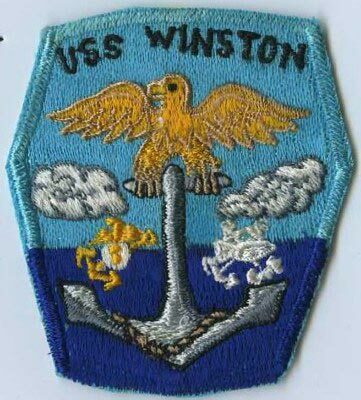 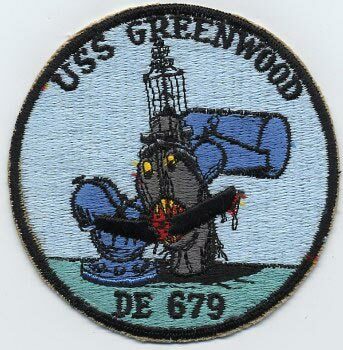 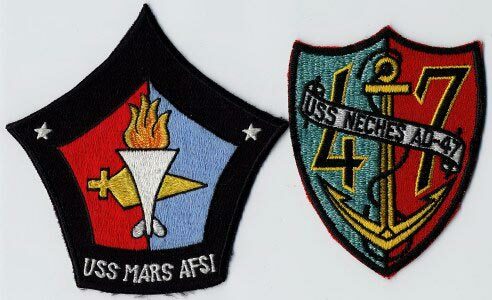 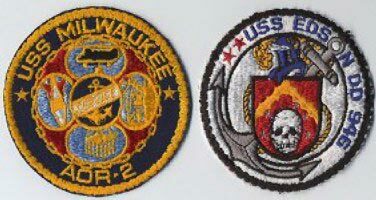 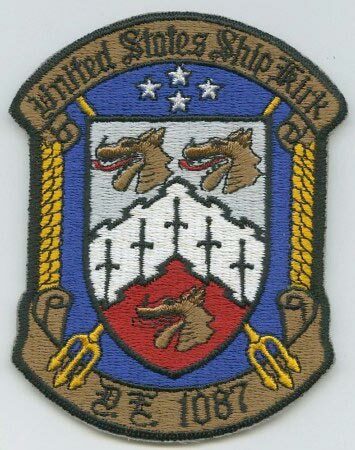 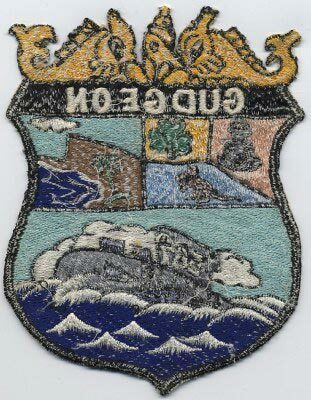 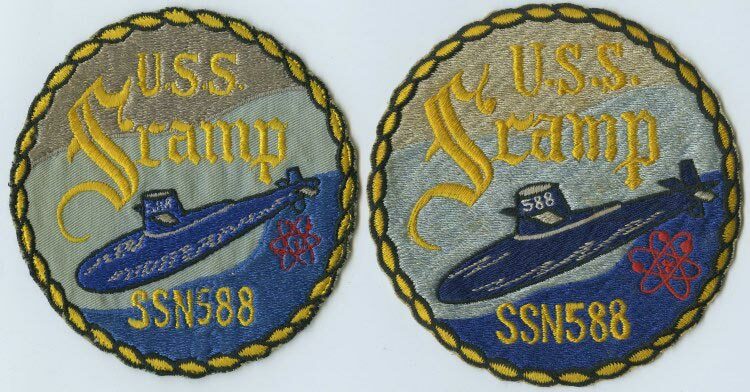 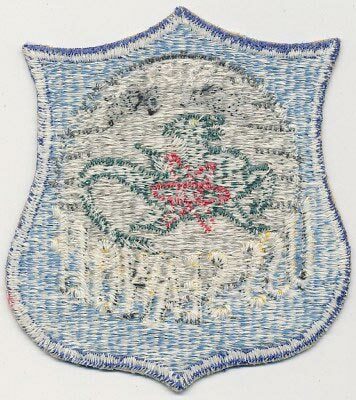 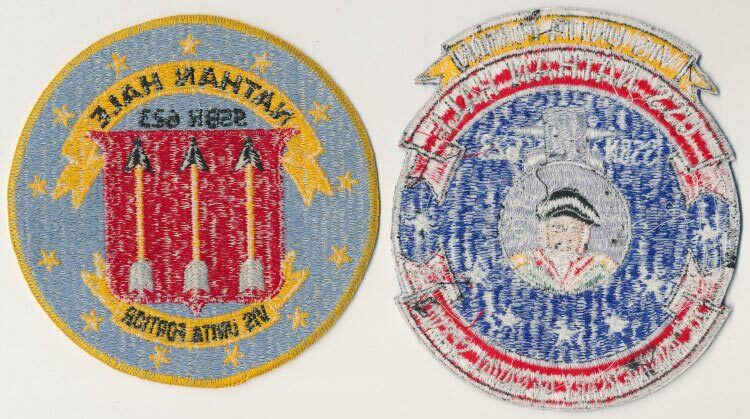 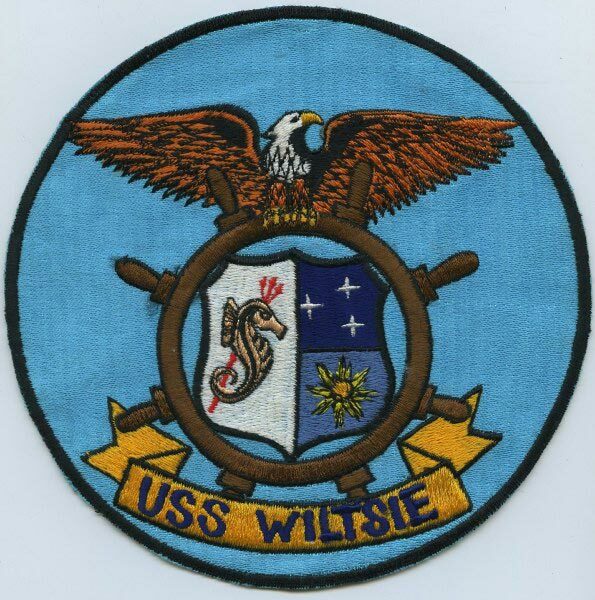 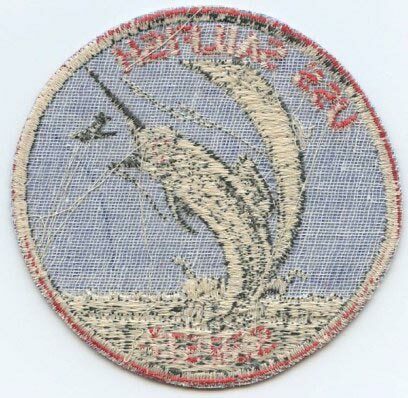 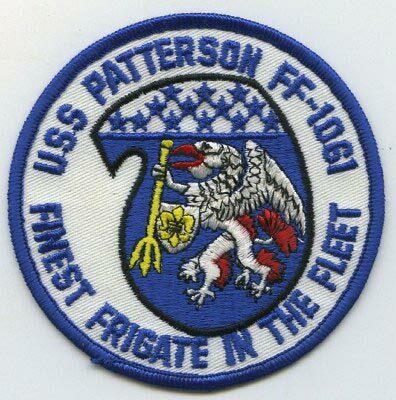 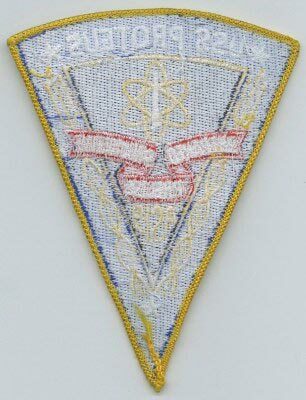 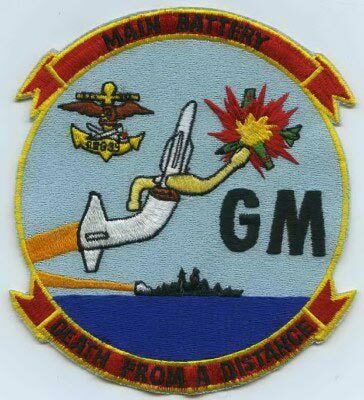 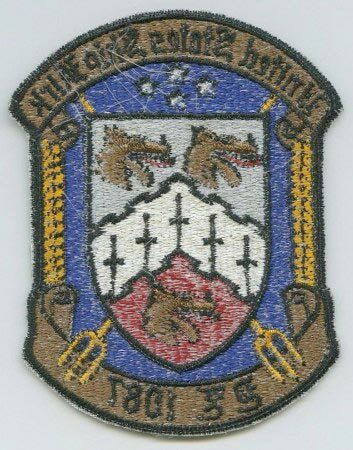 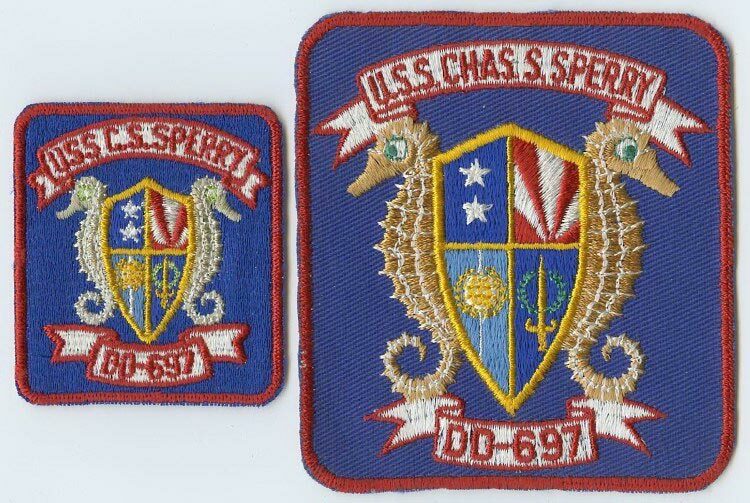 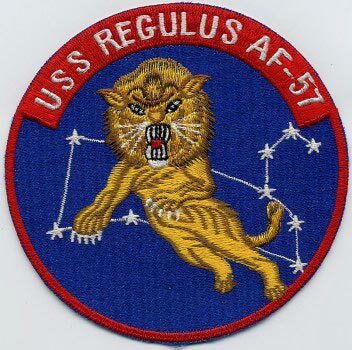 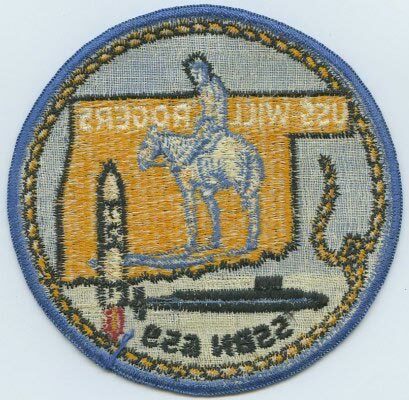 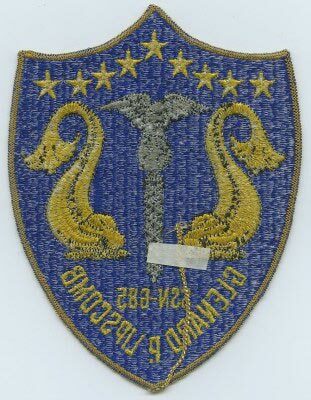 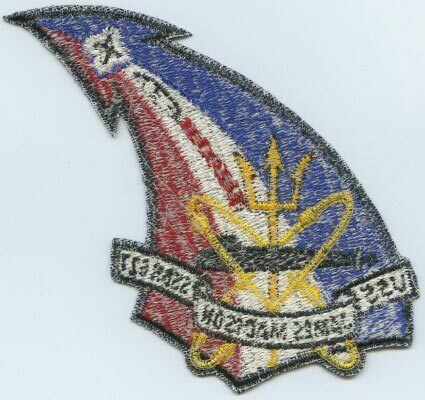 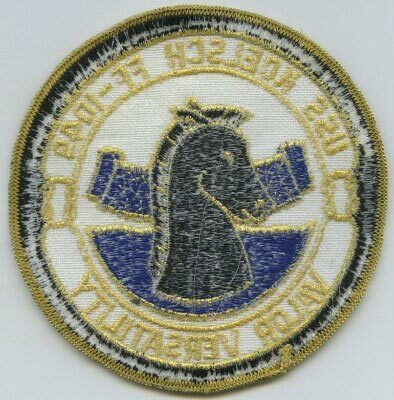 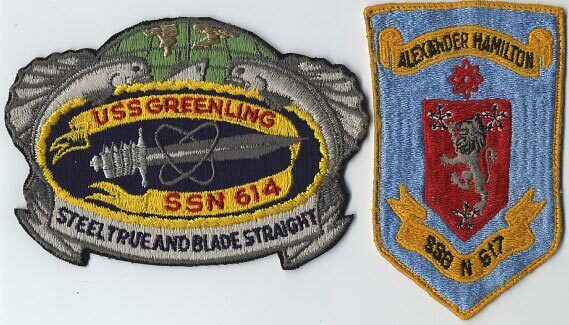 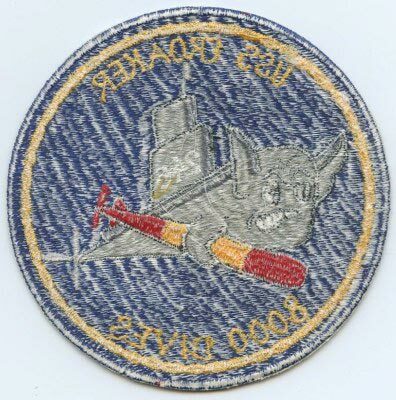 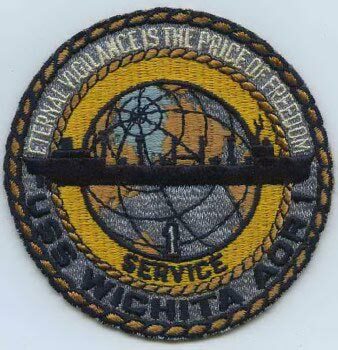 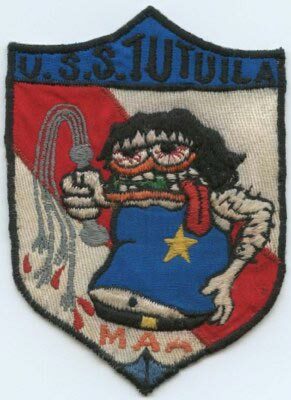 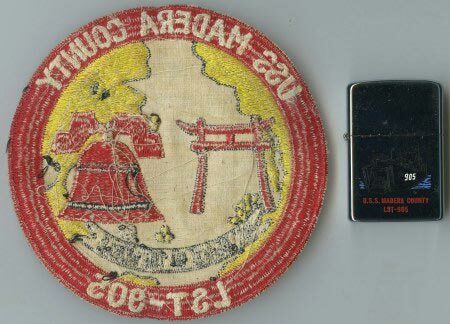 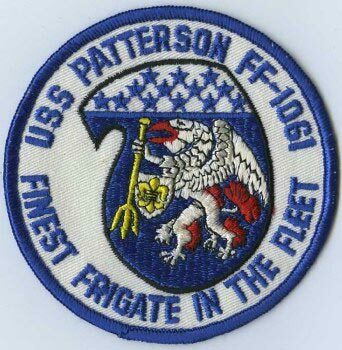 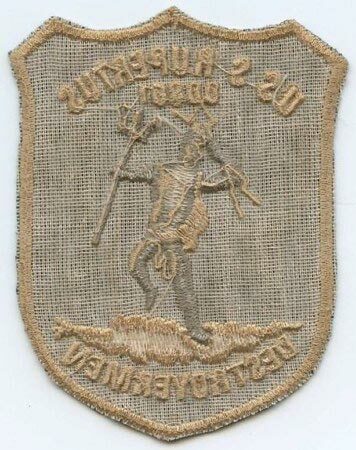 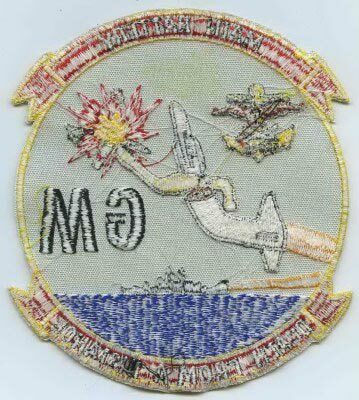 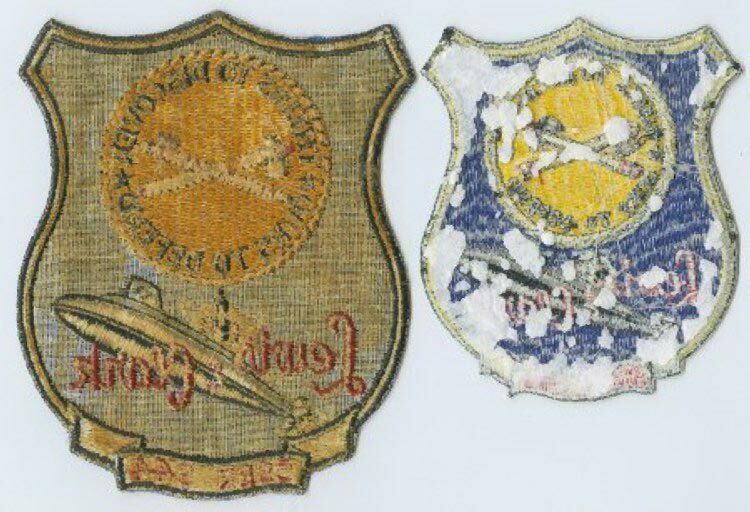 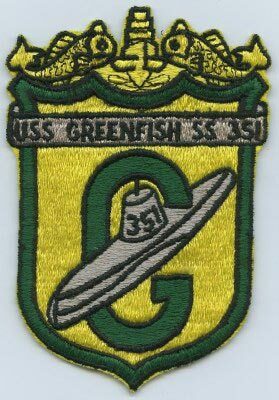 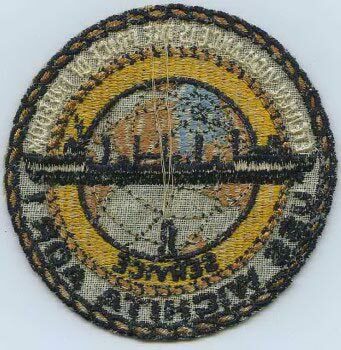 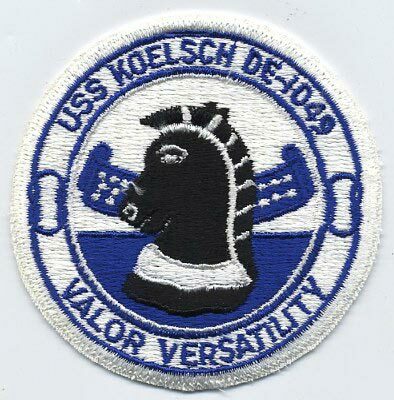 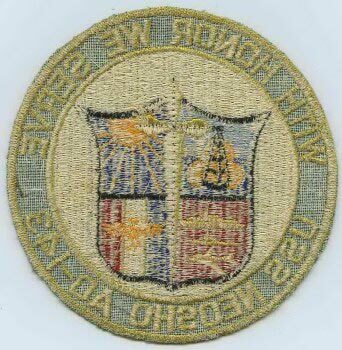 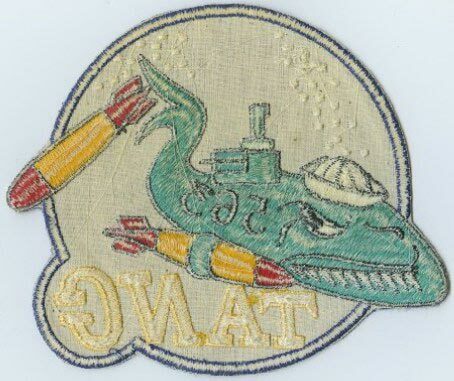 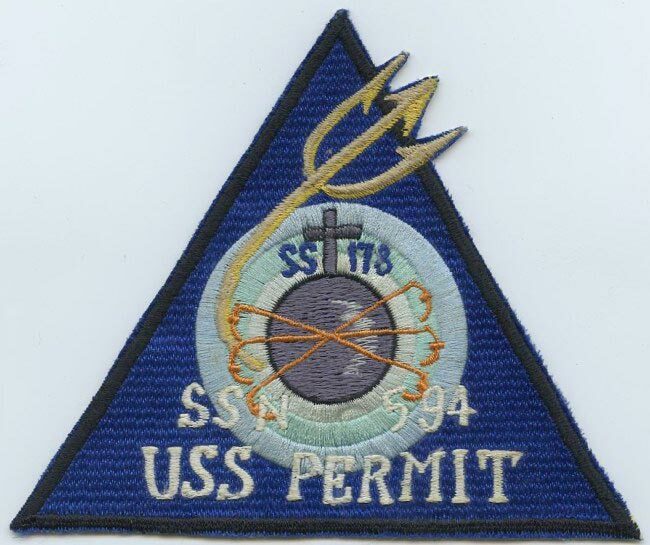 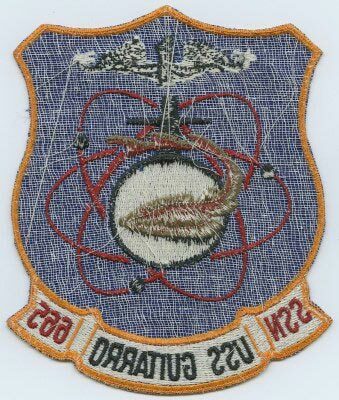 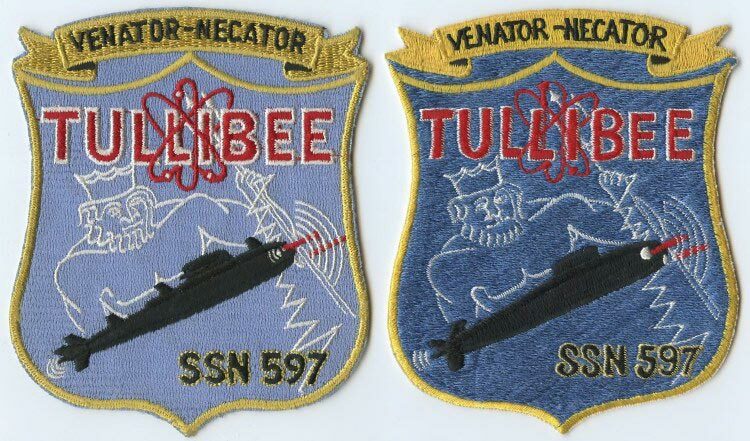 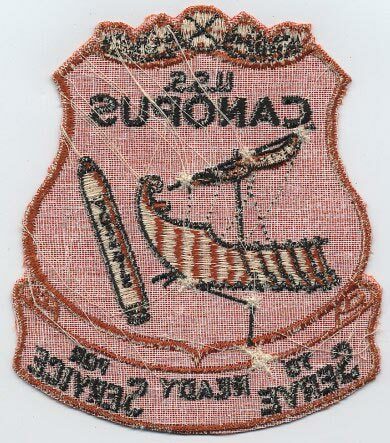 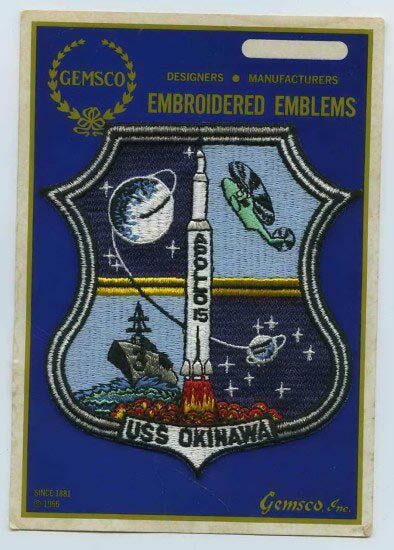 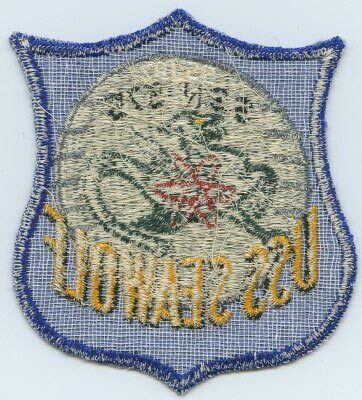 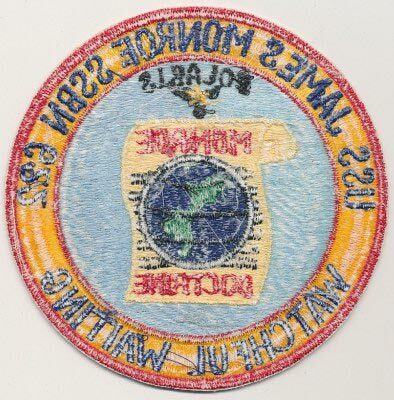 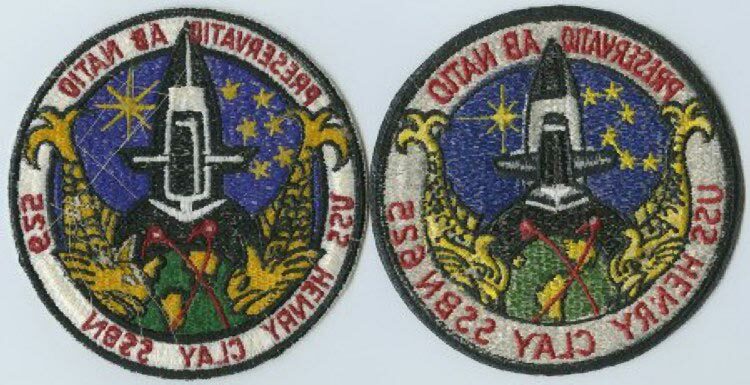 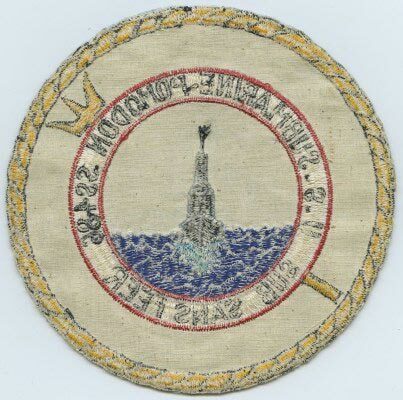 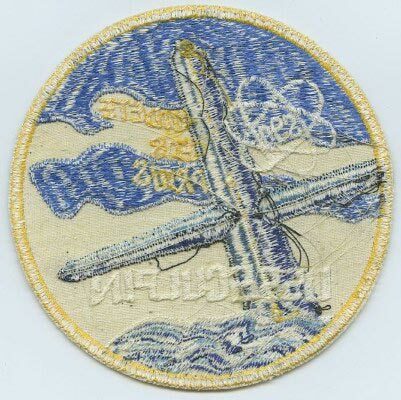 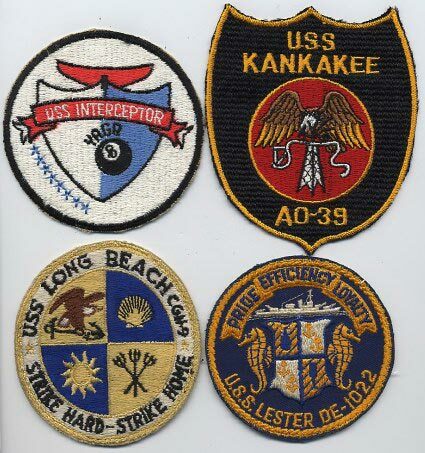 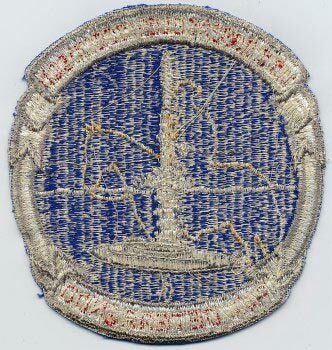 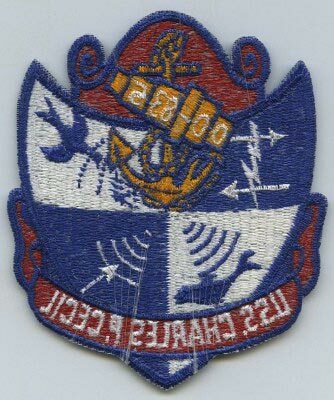 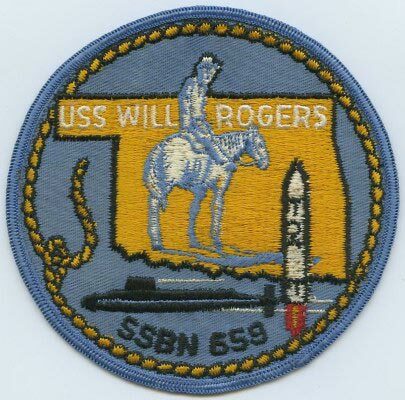 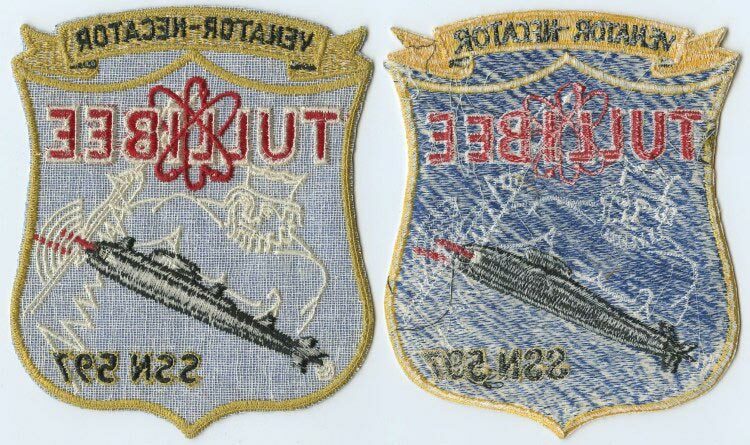 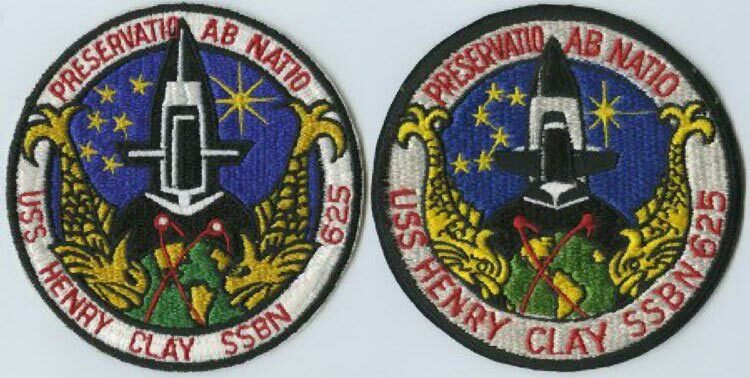 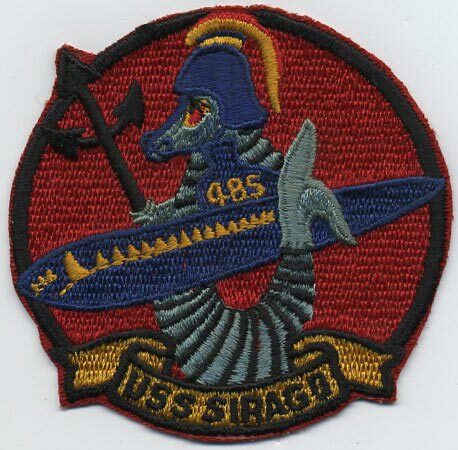 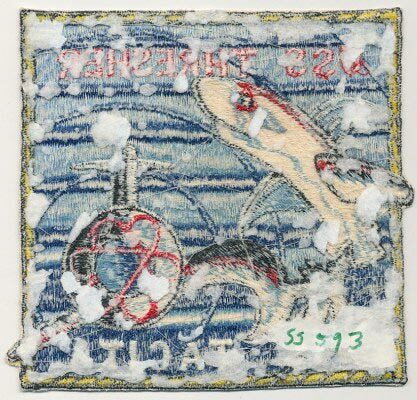 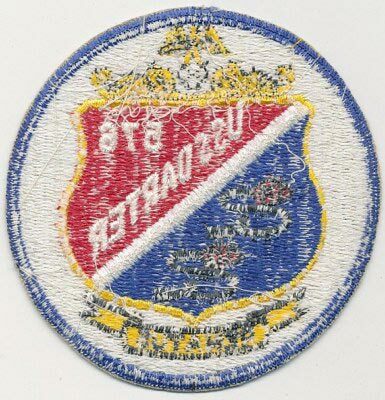 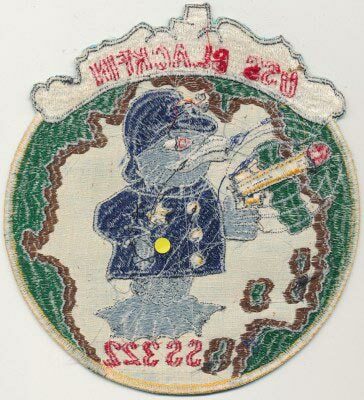 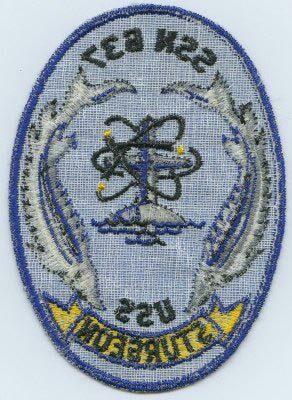 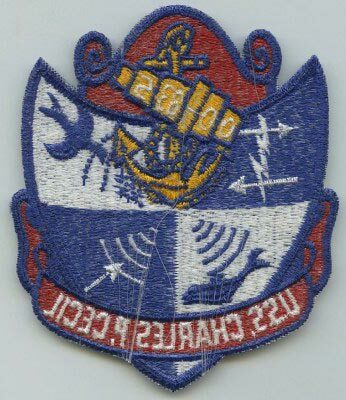 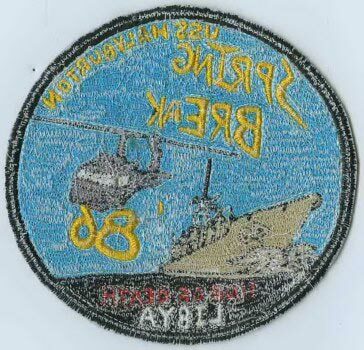 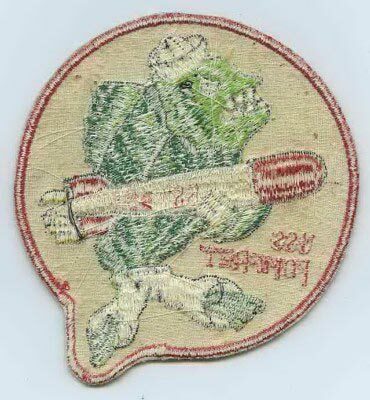 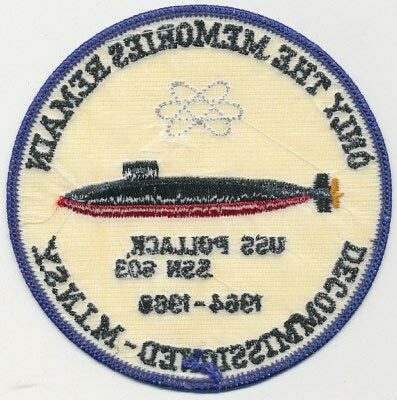 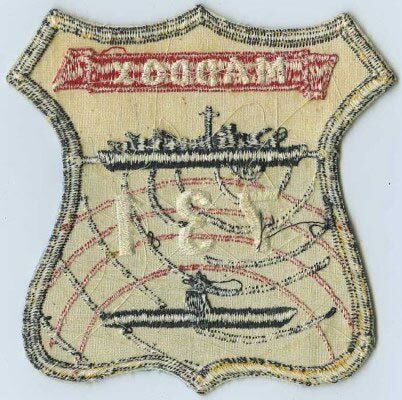 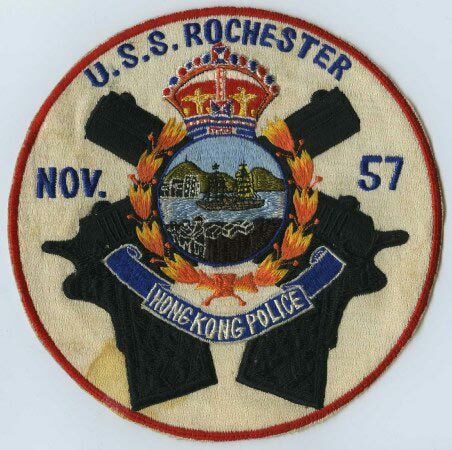 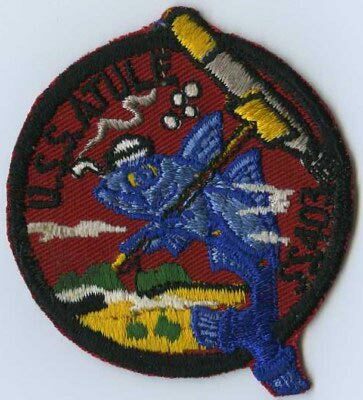 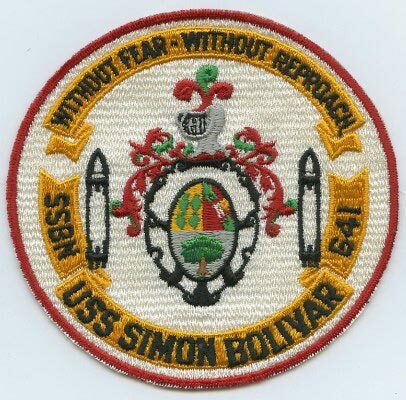 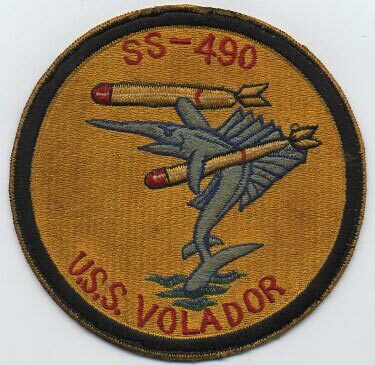 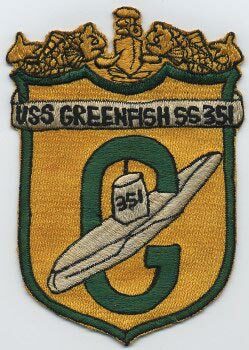 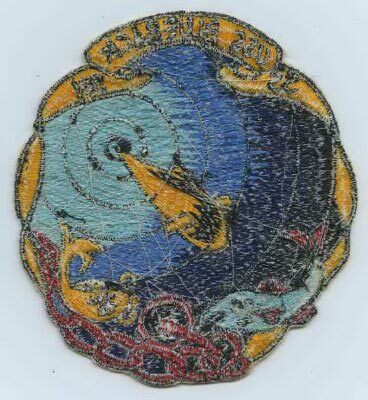 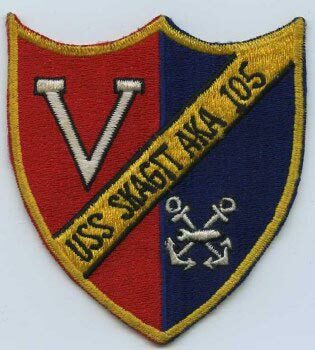 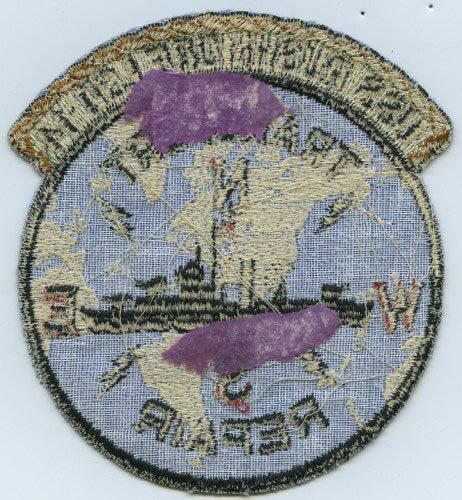 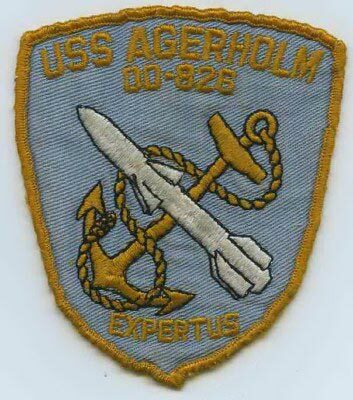 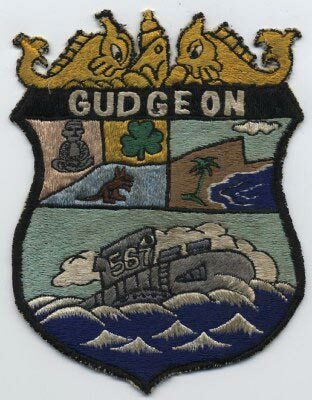 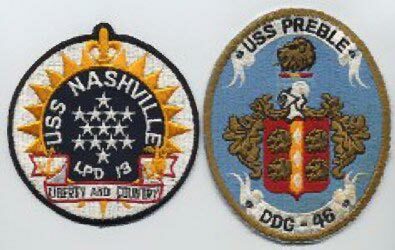 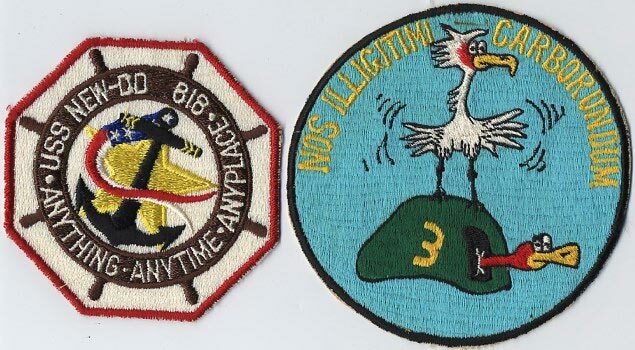 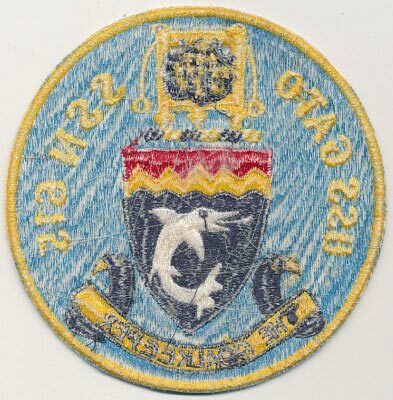 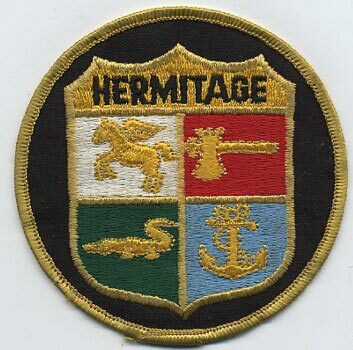 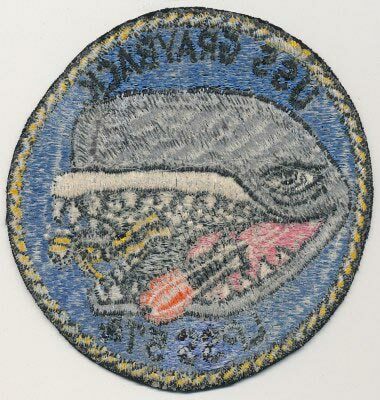 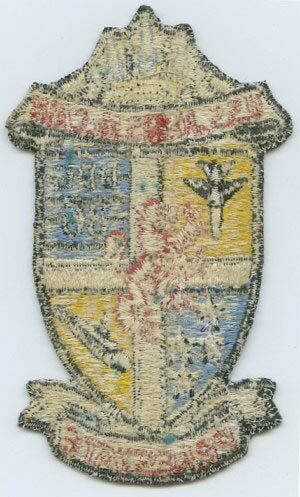 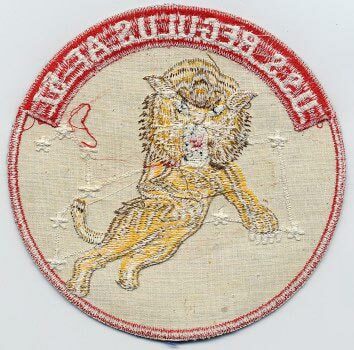 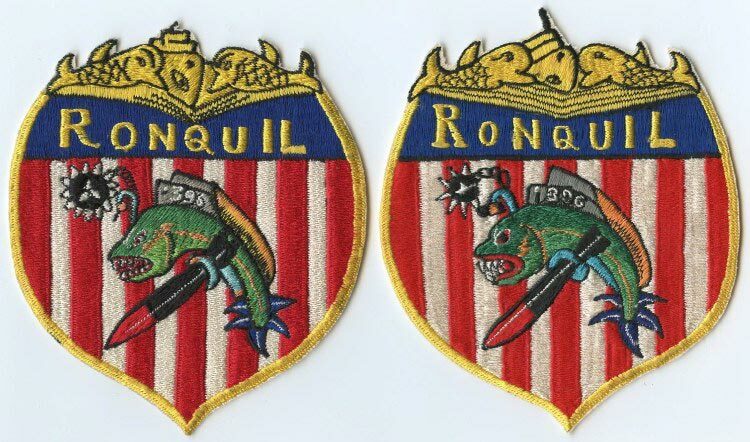 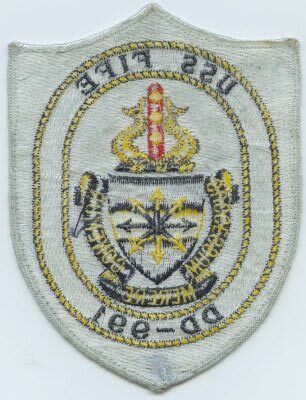 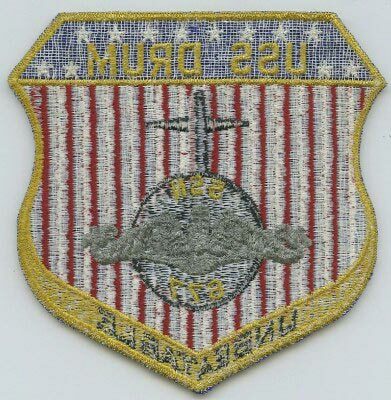 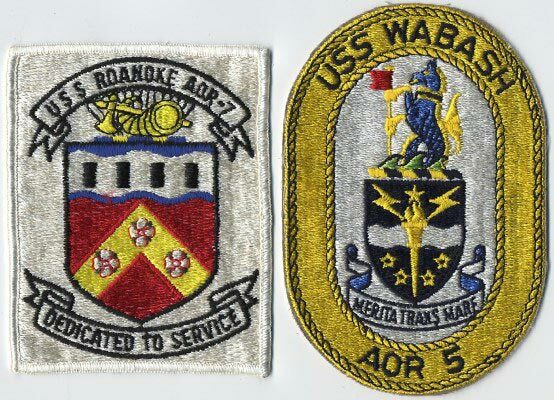 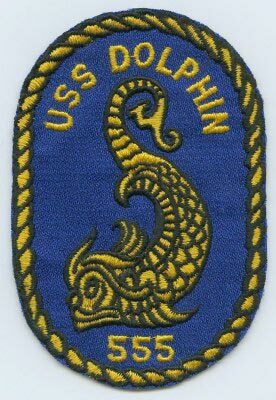 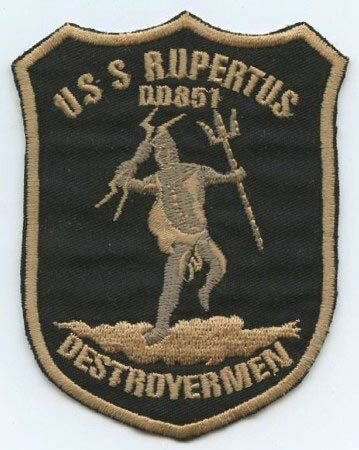 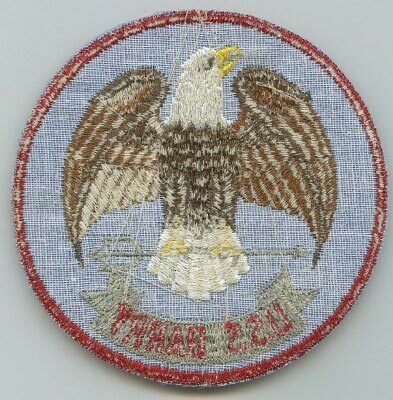 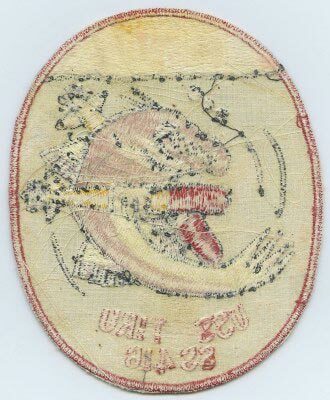 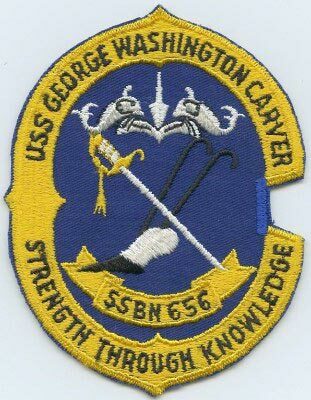 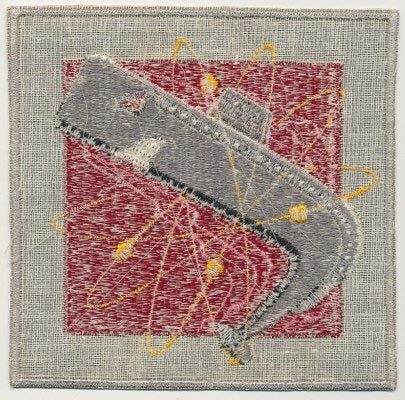 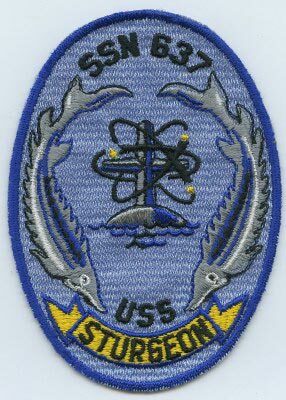 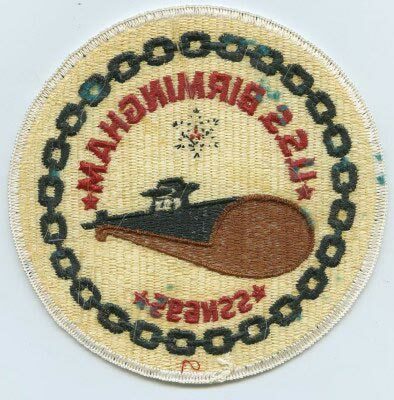 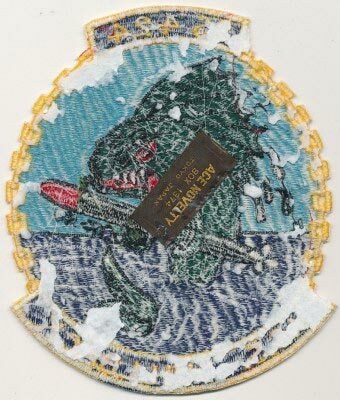 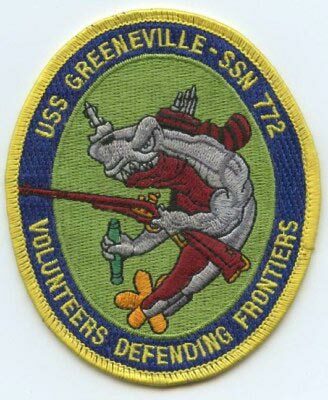 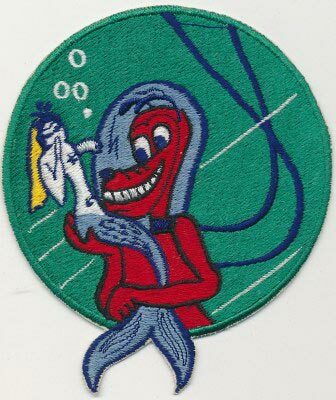 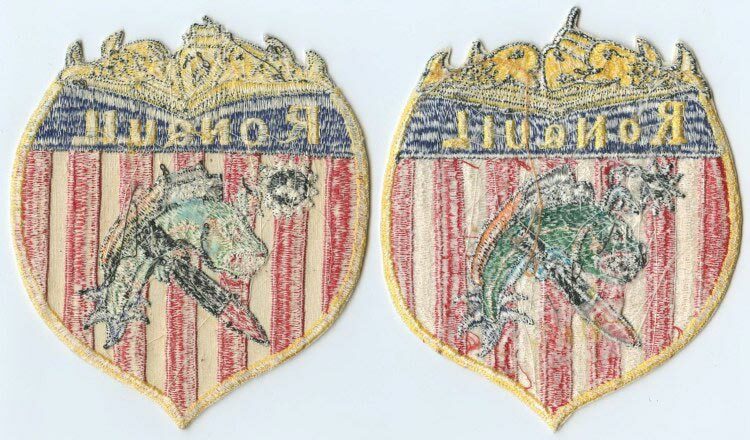 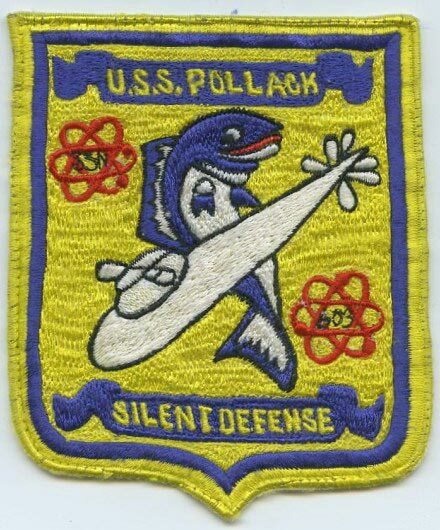 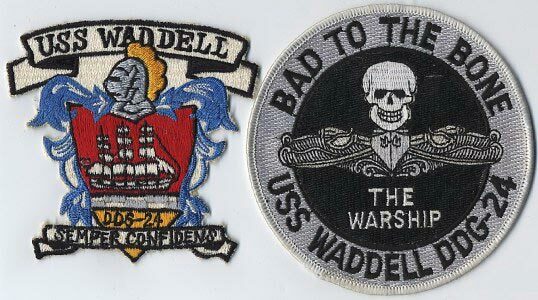 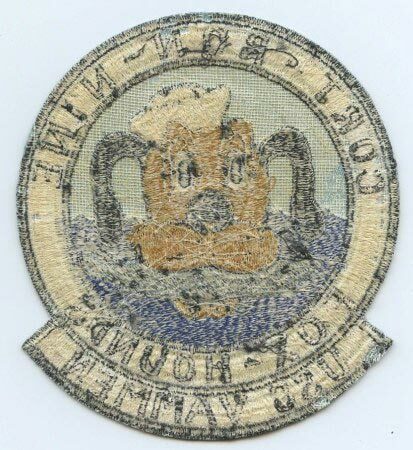 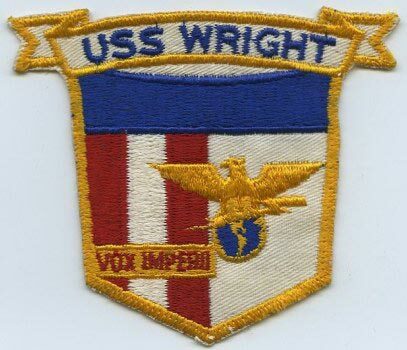 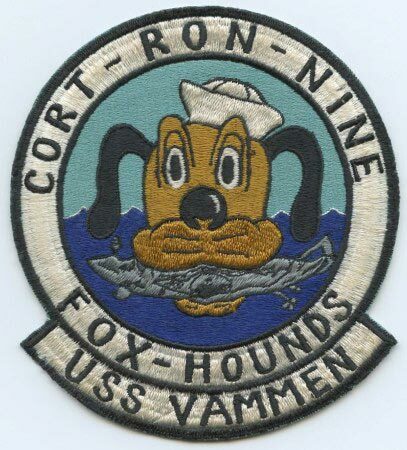 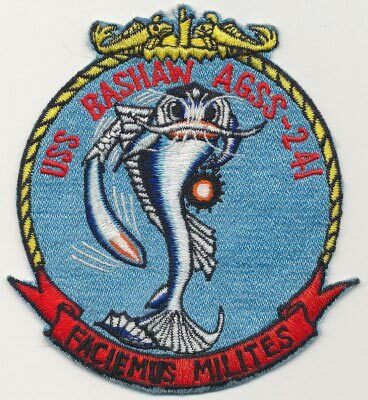 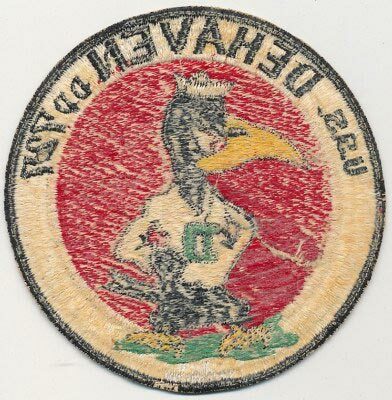 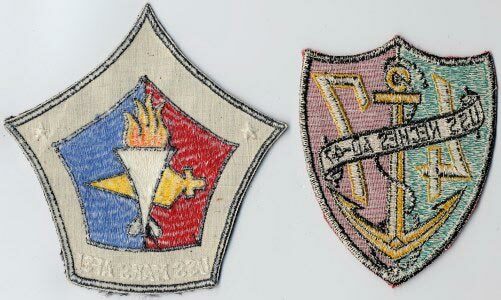 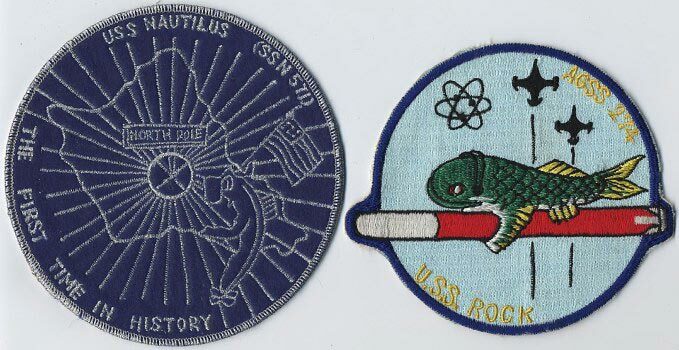 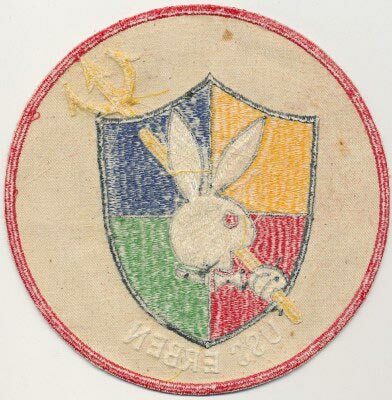 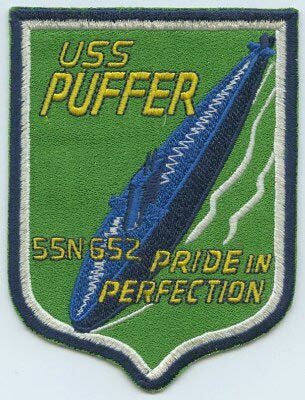 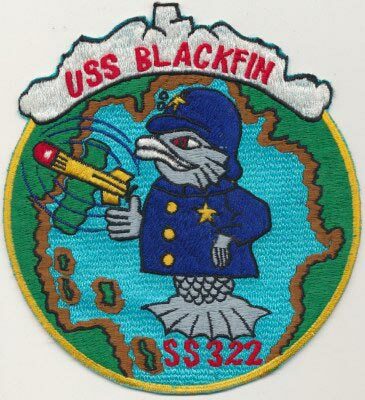 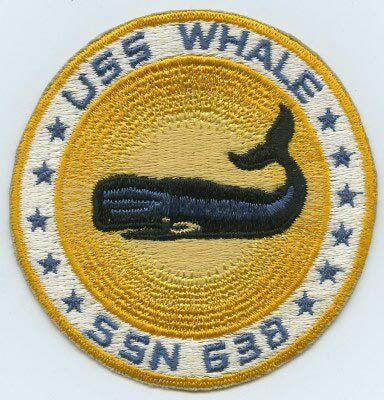 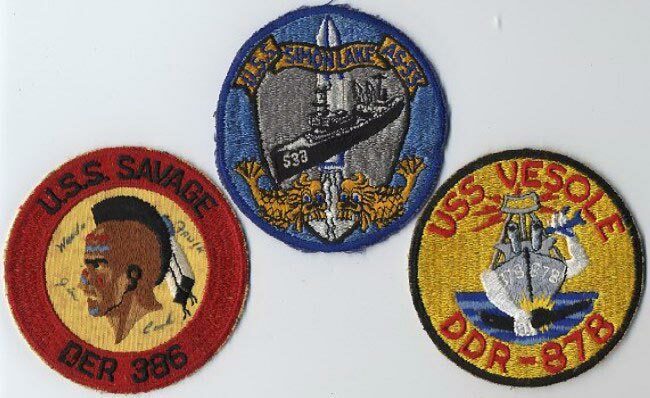 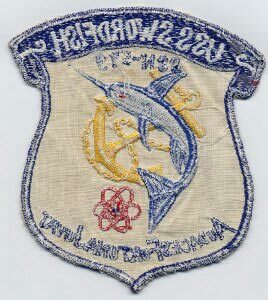 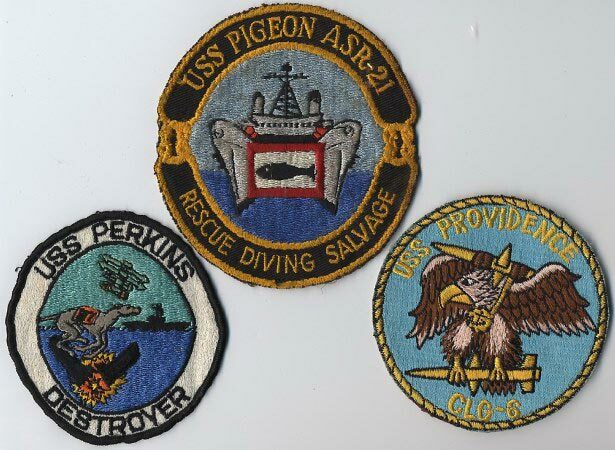 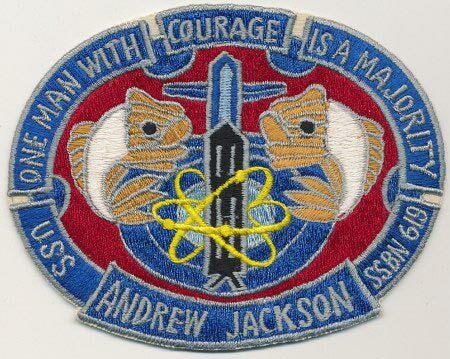 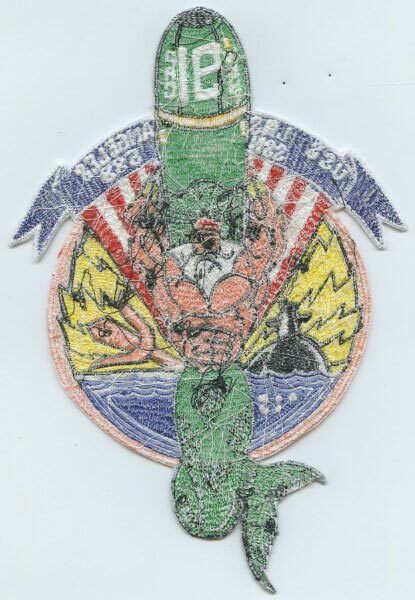 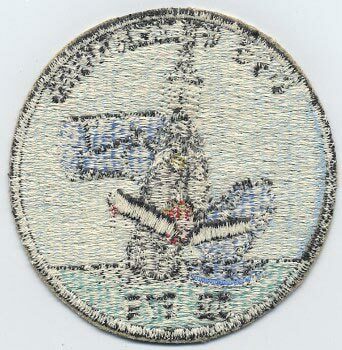 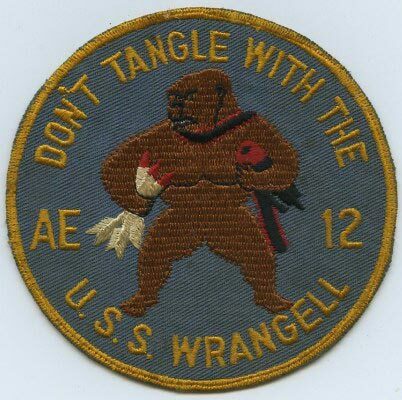 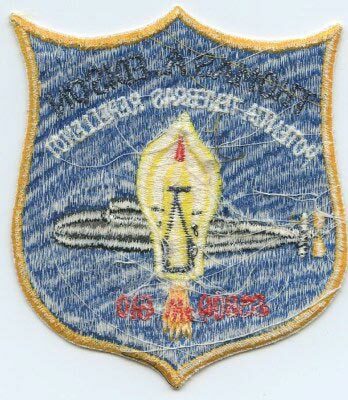 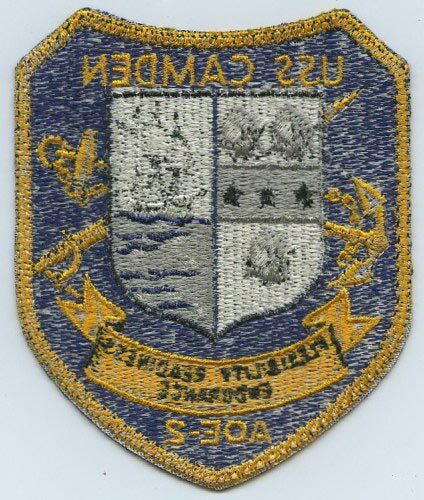 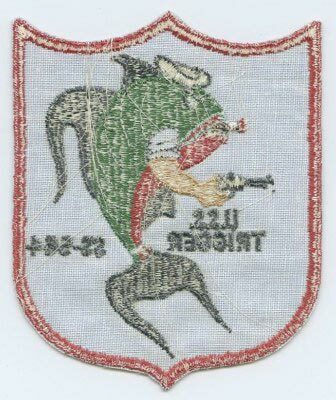 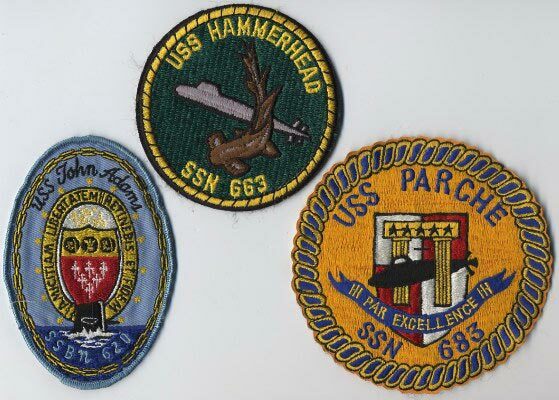 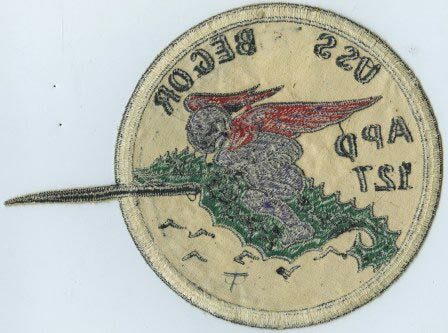 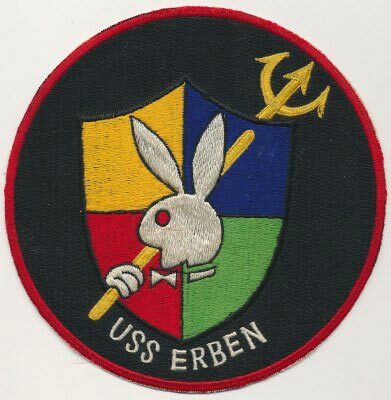 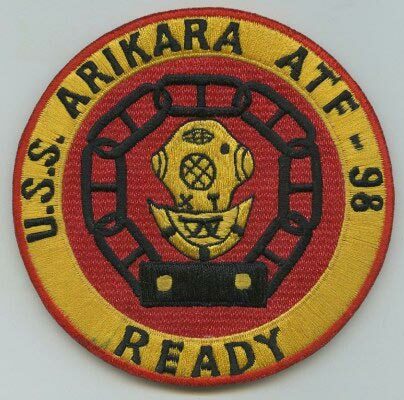 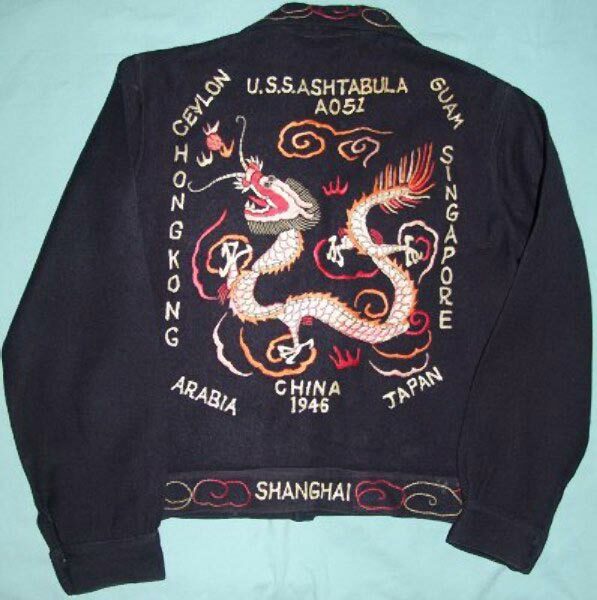 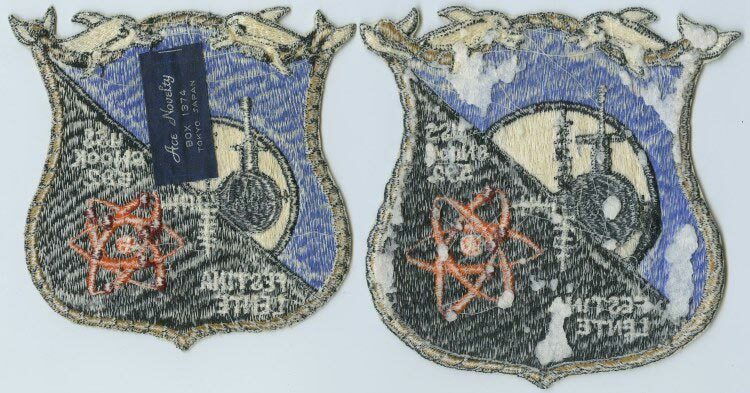 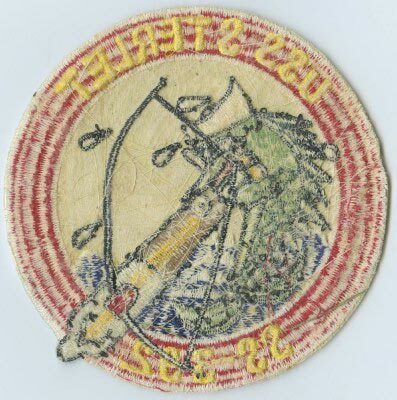 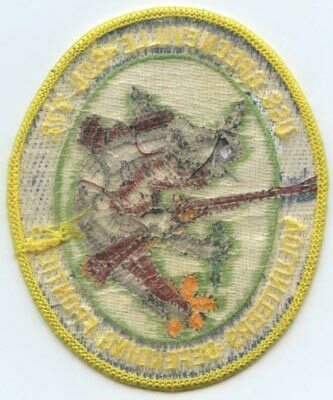 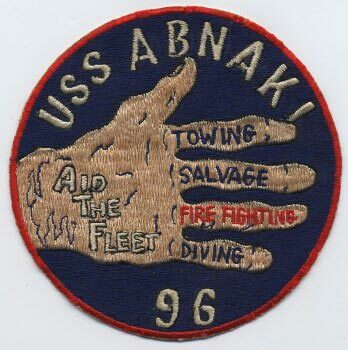 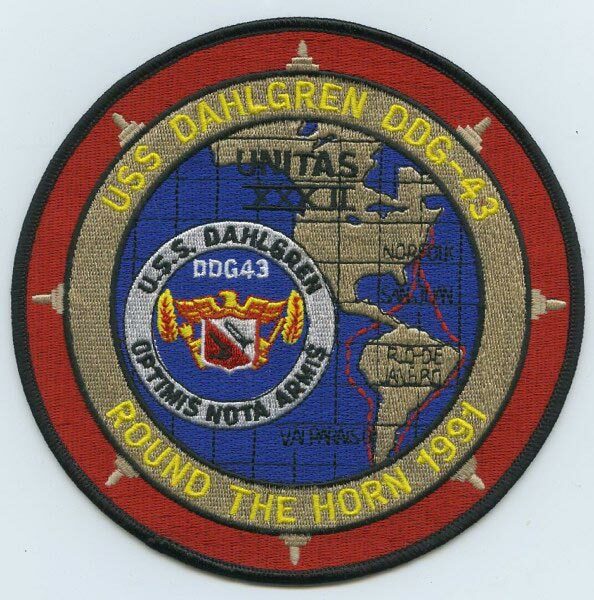 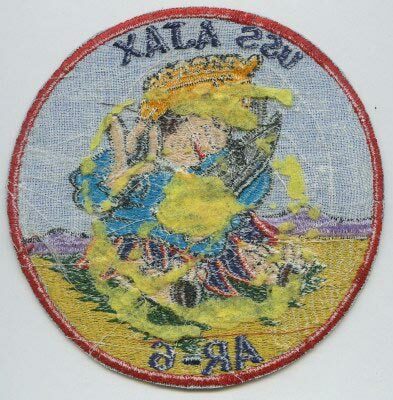 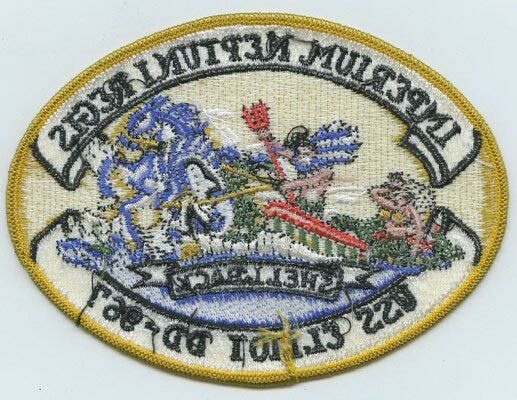 "DON'T TANGLE WITH THE USS WRANGELL"
"Gray Ghost of The Korean Coast"
I saw several Seadragon patches on the Internet....all of them had the Hull Number....probably an uncommon Japan made patch.